Getting off the plane in Saigon/Ho Chi Minh City, I was very nervous again, especially when I saw a sign with my name on once we got off the plane. The man took my passport and paperwork and told me to take a seat. The rest of our group went off to get their visas processed. This was a very worrying time for me as I thought I was about to be put on a plane back! It was a long process of waiting for the officials to get all the paperwork done. Eventually we made it through and our driver with our minibus was waiting to take us to the hotel. 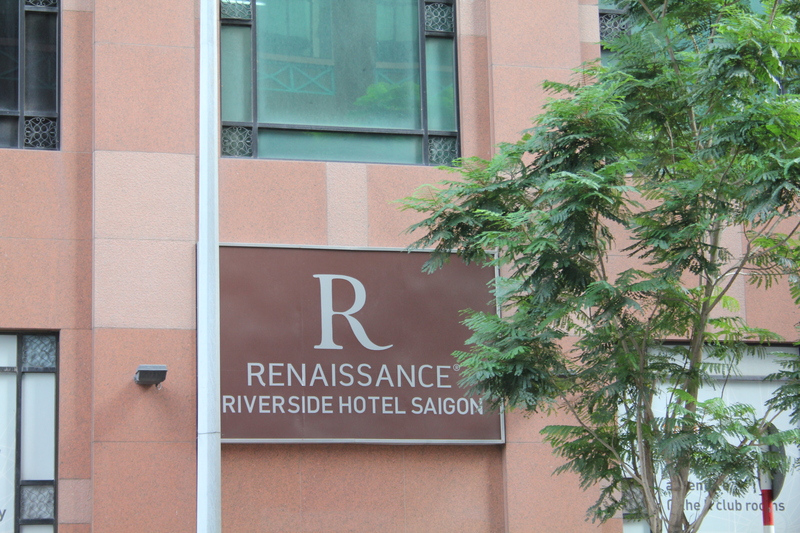 We stayed at the Renaissance in down town Ho Chi Minh City which has a fabulous pool on its rooftop! 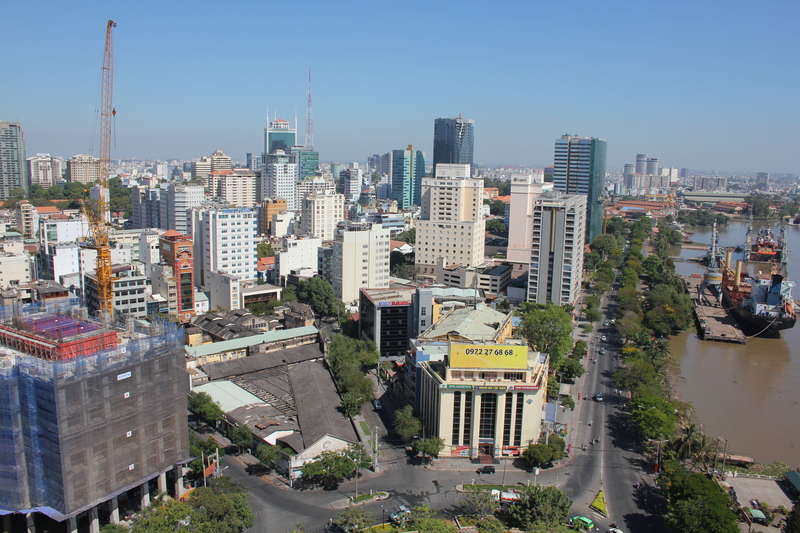 View from the rooftop pool area – across down town HCMC! 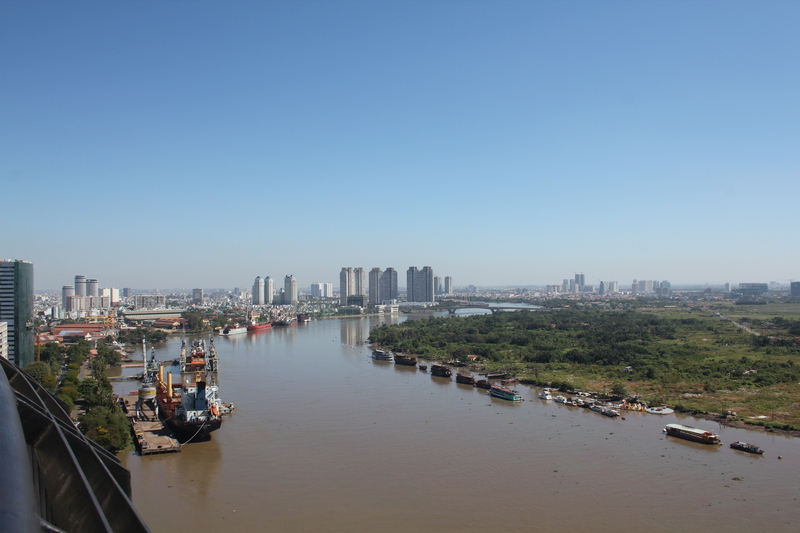 And looking the opposite way – down the Saigon River. 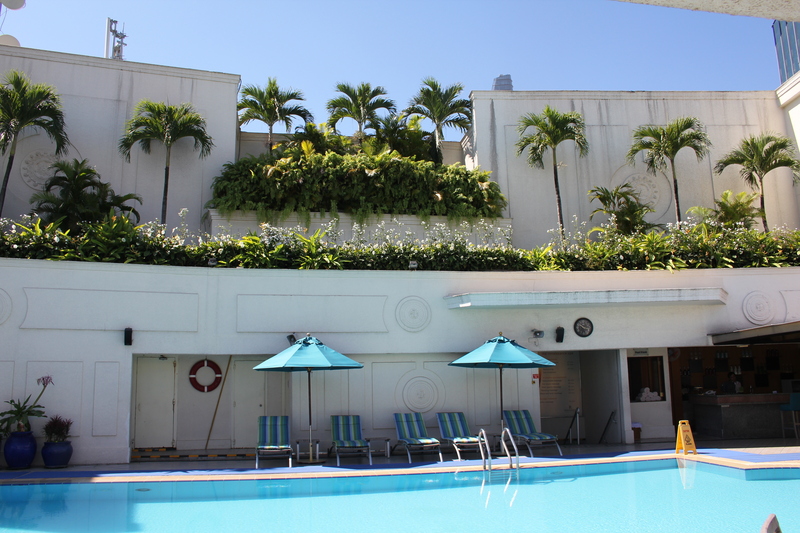 Fabulous rooftop pool at the Renaissance Riverside Hotel. 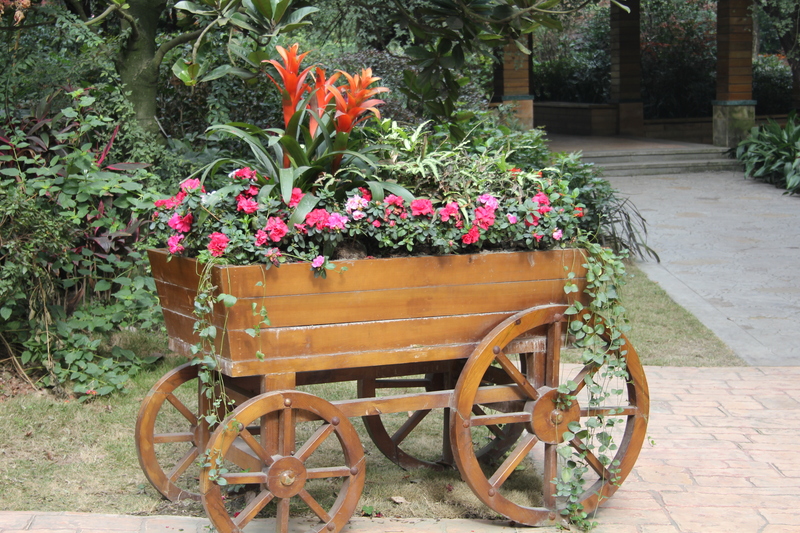 Beautiful flower display in the hotel lobby. 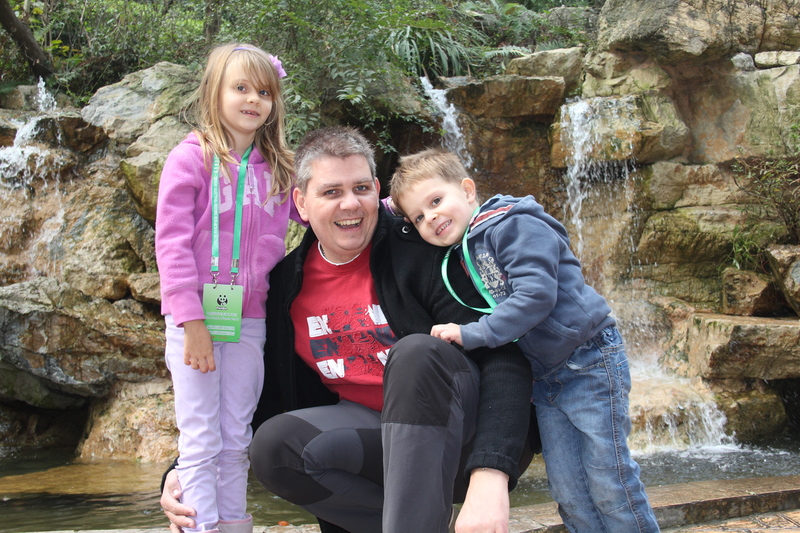 With 2 beautiful children! 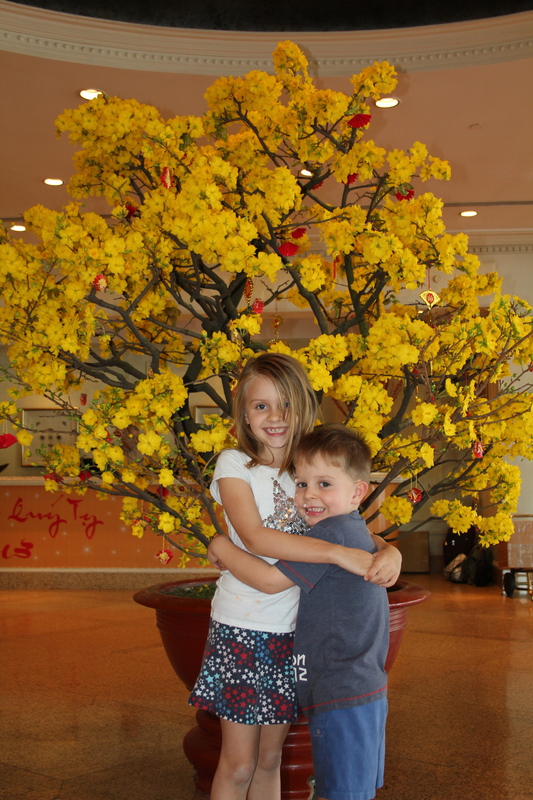 We all enjoyed a delicious lunch at the hotel – I love Vietnamese Pho, which is a noodle/bean sprout/beef soup that is divine. I think I will be living on that for the week! The best thing about Pho is that you can have it in so many different ways and you control the flavor. It is usually served quite simply with the rice noodles submerged in special meat broth with your choice of meat on top. A separate side plate allows you to add as many or as little of the bean sprouts, onions, basil leaves, lemon, chilli and coriander to your liking. 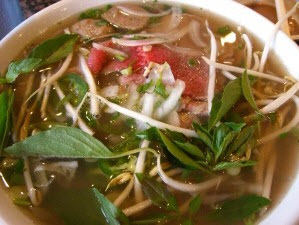 Delicious and yummy Vietnamese Pho. 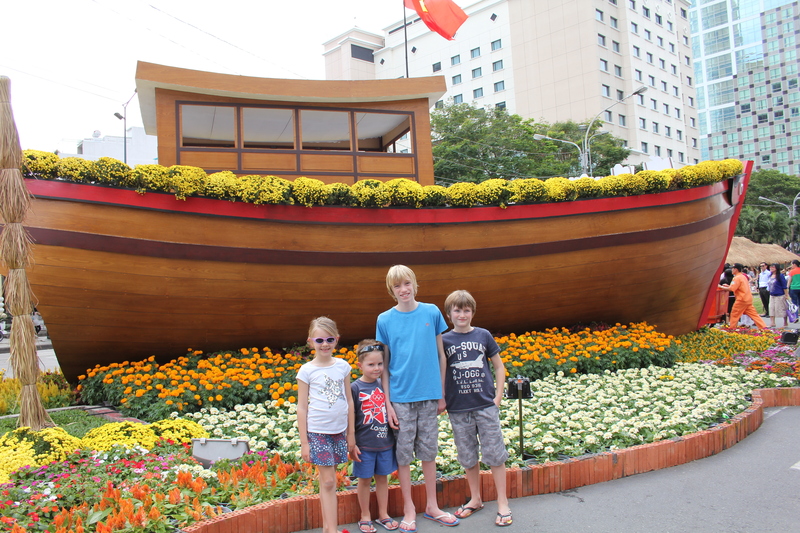 Off to explore the city in the afternoon – we walked from the hotel around alot of the streets and into the main Lunar New Year display (can’t call it Chinese New Year in Vietnam!!). 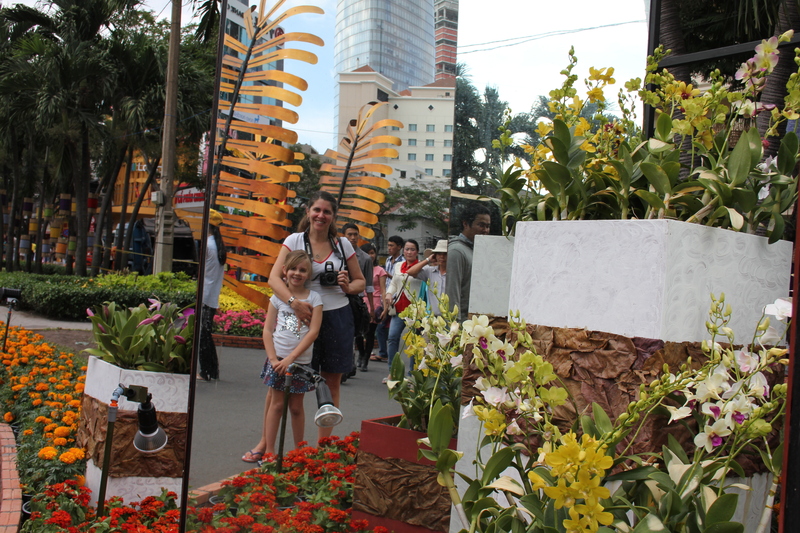 Of course, many places were closed because of this celebration, but everywhere had beautiful flower displays and therefore, good photo opportunities. 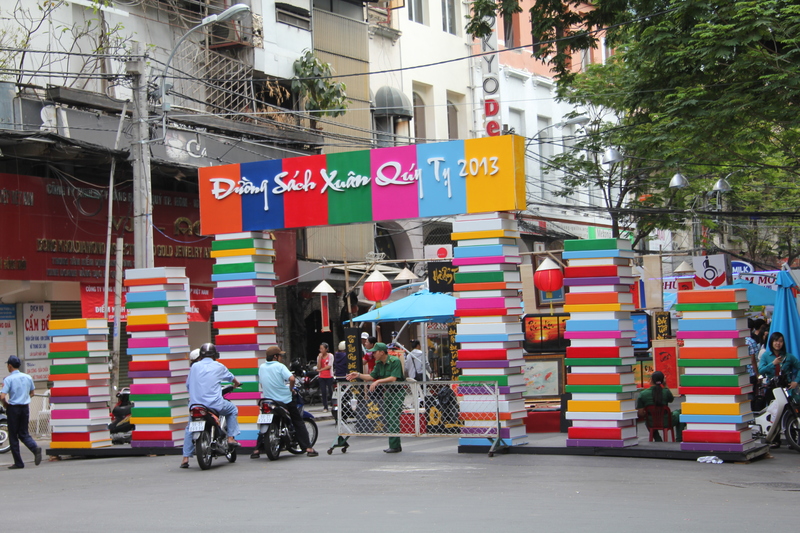 All of the streets had colourful entrances. 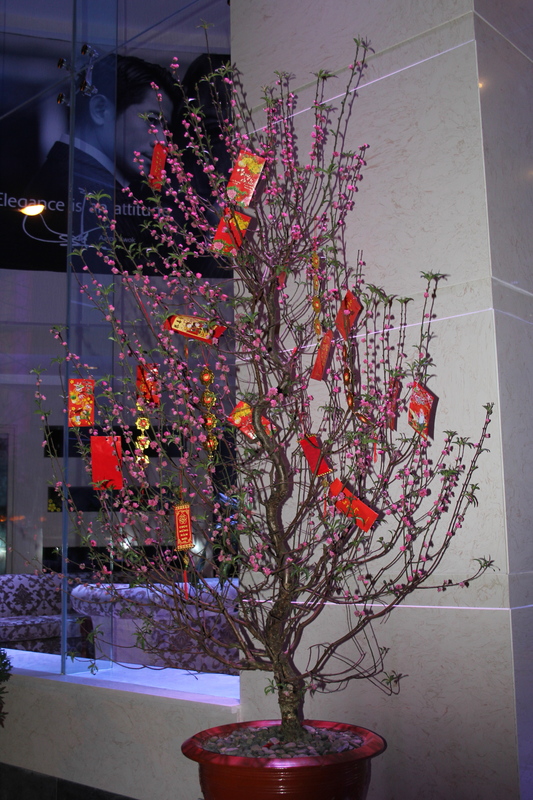 Beautiful flowers and displays to celebrate Lunar New Year. 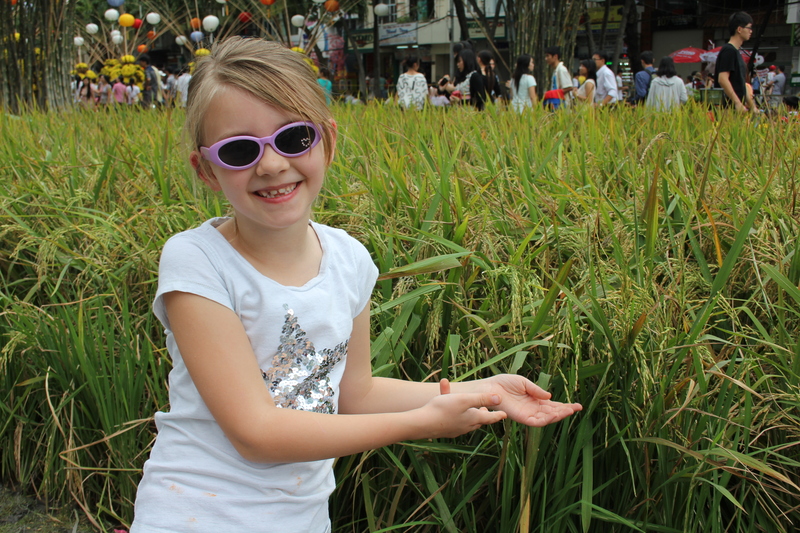 Isabelle pointing to a rice field display. This is how rice grows!! 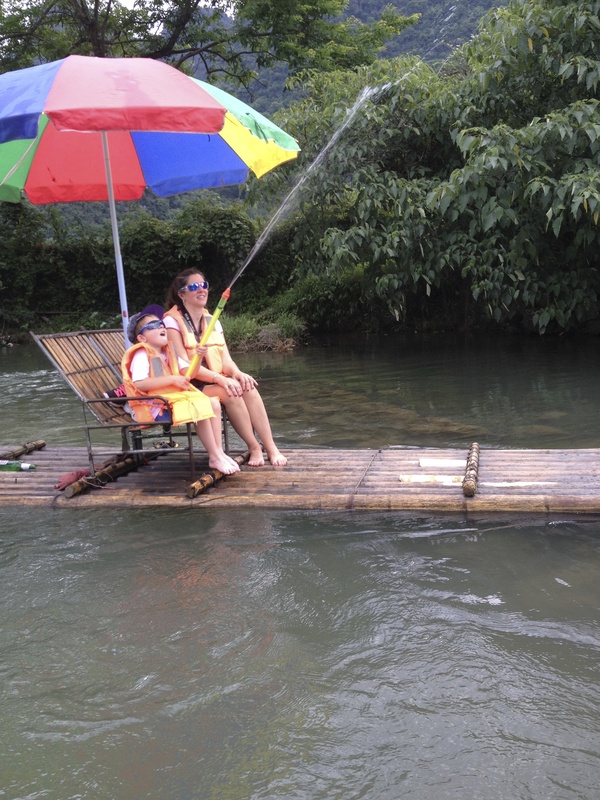 A boat!! 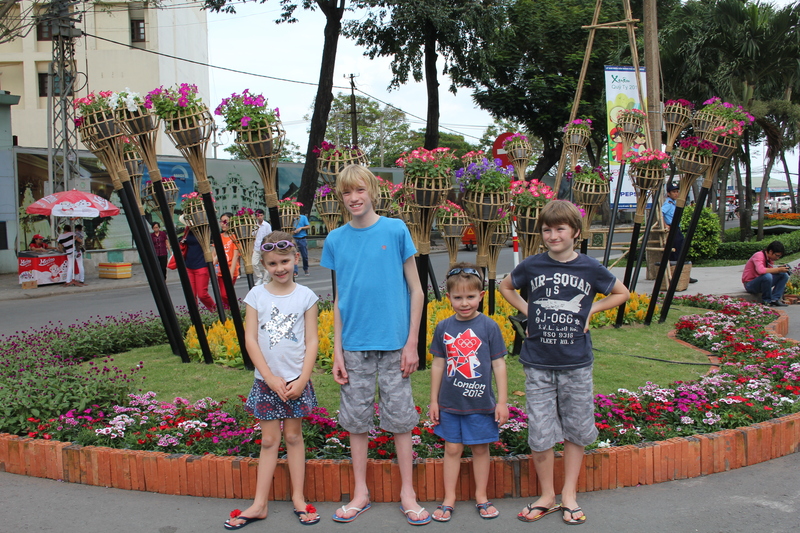 We had many tourists behind us taking photos of these lovely children! The Happy New Year signs for welcoming the Year of the Snake. An arty photo by me as I took this myself! Cool tall mirror reflection made for a good shot of me with Isabelle. Snuggles and huggles with the kids. 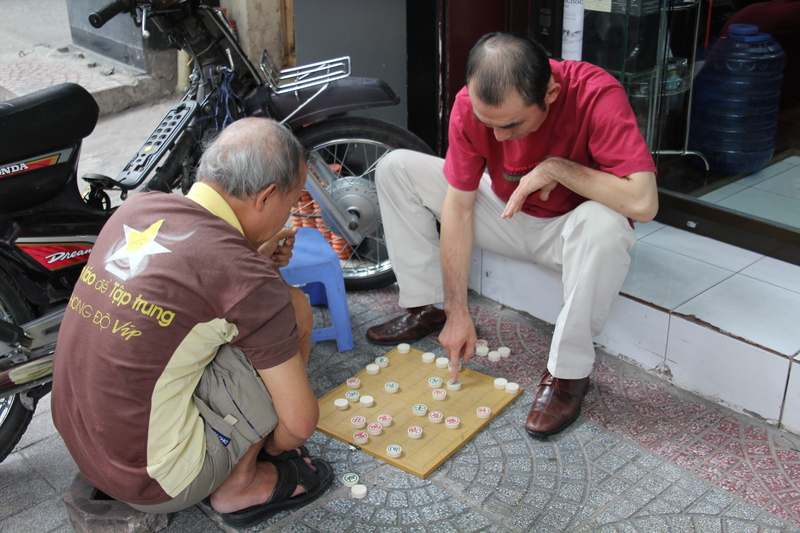 Local Vietnamese playing games out on the street. 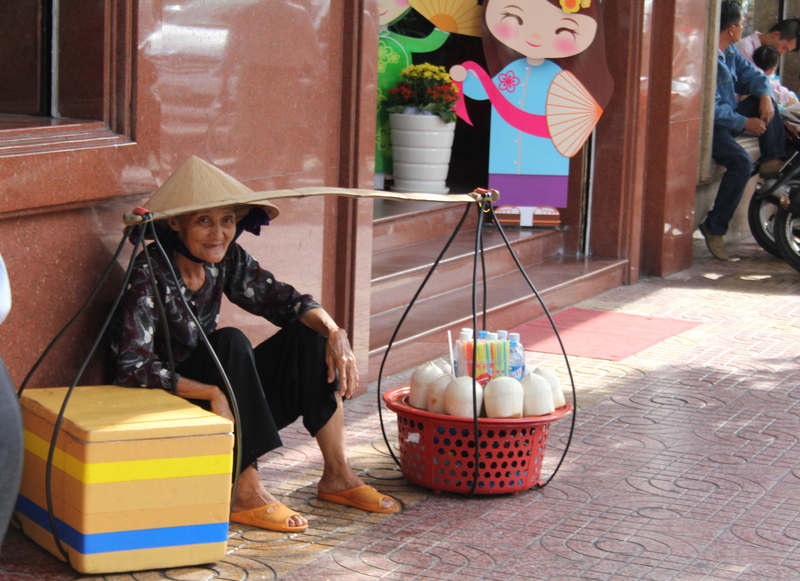 This lady was trying to get us to buy her wares. She looks so fragile and the buckets look so heavy. No wonder she is sitting. New year decorations are just like our christmas lights but with flowers, corn, and other symbols to highlight the start of spring. It was wonderful to see everything lit up – it really does extend the holiday season! 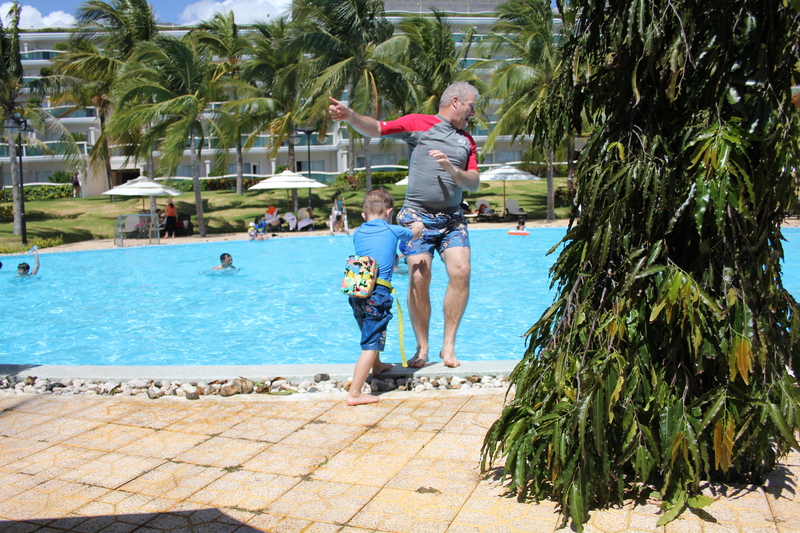 It is very hot in Vietnam and the kids had had enough after 2 hours so it was back to the hotel to take advantage of the roof top swimming pool. 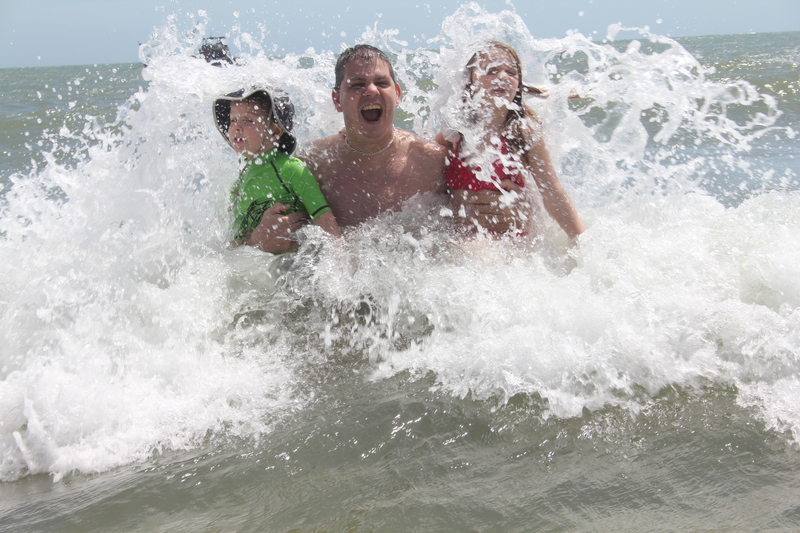 All 4 children had plenty of fun here – they are all water babies. The hotel recommended a restaurant for dinner for us and it was very good. We ordered a lot of dishes that we could all share and everything was delicious. 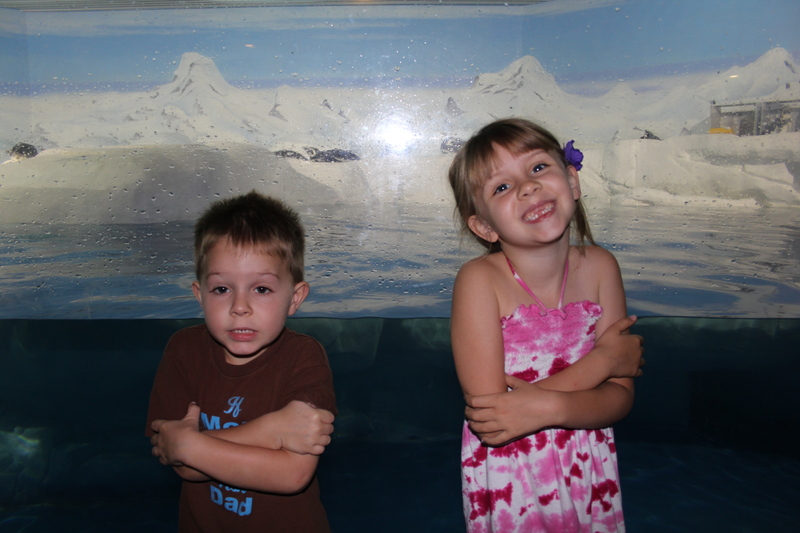 Isabelle and Oliver were adventurous and tried some new things too! 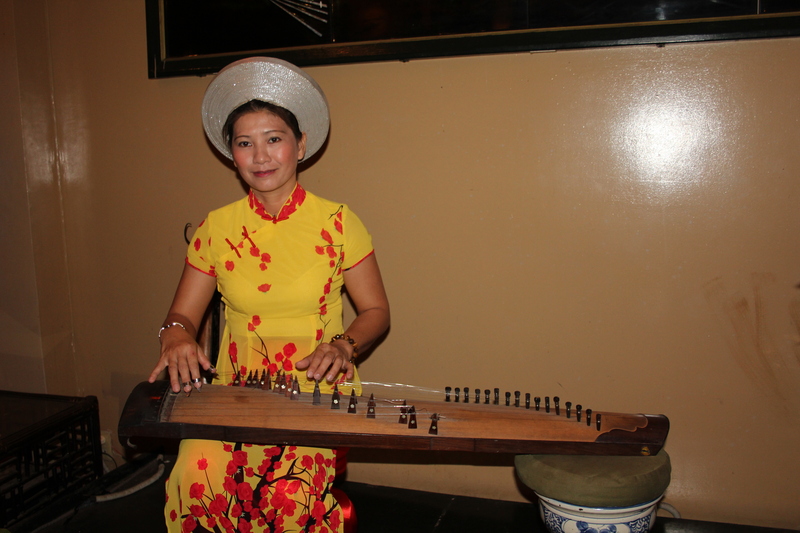 We were even entertained by a local playing on a musical instrument. Our musical entertainment over dinner. Night time lights. Check out all those scooters. 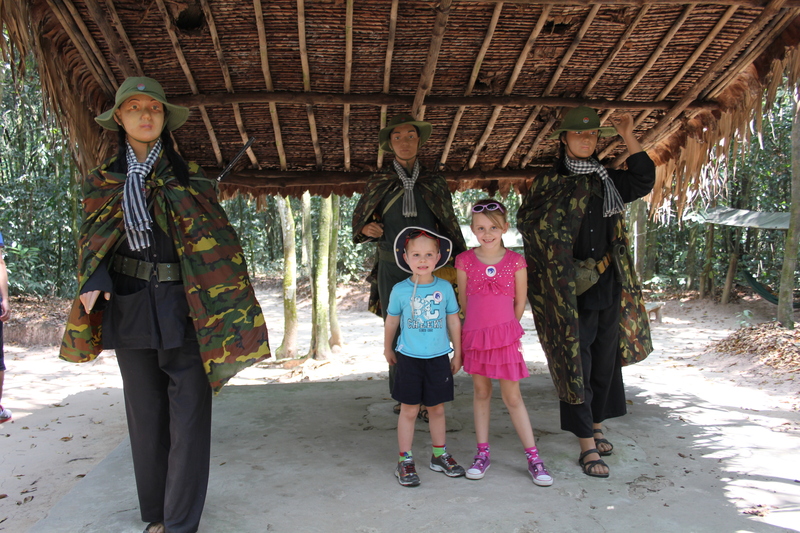 The following morning, our driver picked us up to start our 90 minute drive to the north of HCMC to visit the tunnels at Cu Chi. It was a bumpy ride as the roads are terrible! 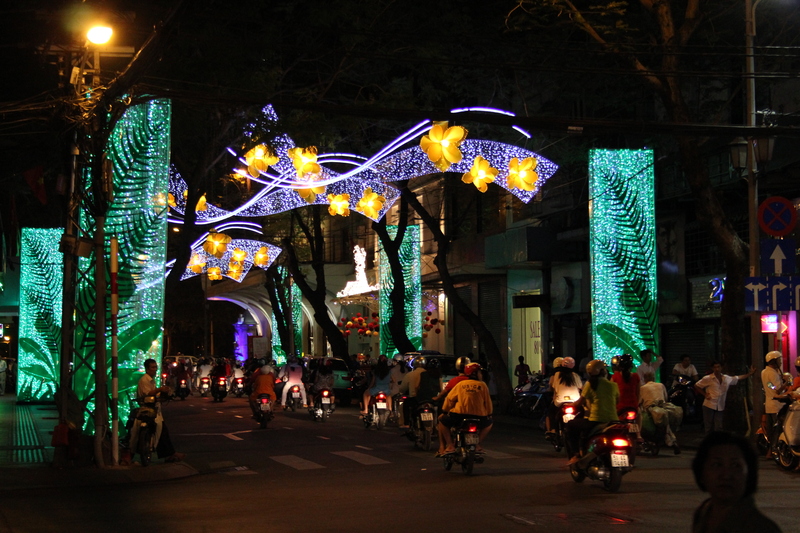 One of my over-whelming memories of Vietnam will definitely be the scooters and motorcycles. They outnumber any other vehicle by at least 20-1 and they crowd the roads loaded with everything from huge packages of toilet paper, plants to live animals to families of four with joyful toddlers and sleeping babies who manage to stay on these 2 wheeled vehicles with apparent ease. I was very happy to see that 95% of all riders were wearing helmets. Many of these were also wearing masks or had wrapped their heads in towels or sheets too! 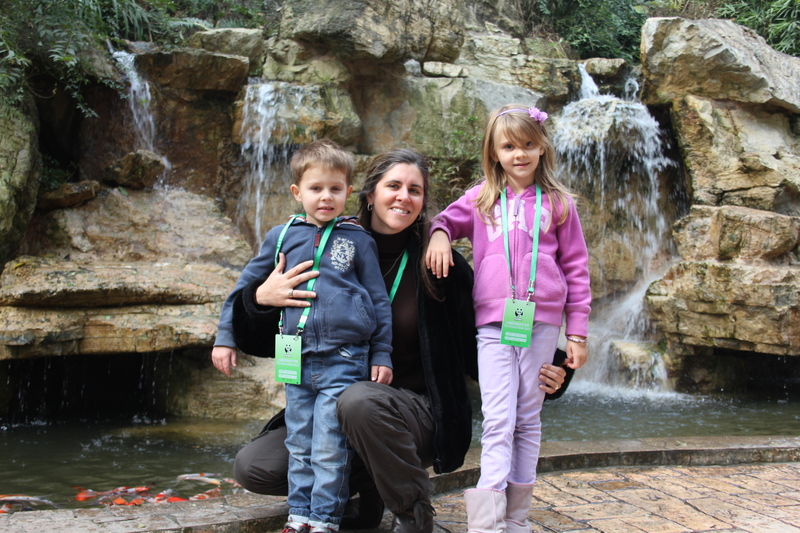 Family of 4 travelling around. 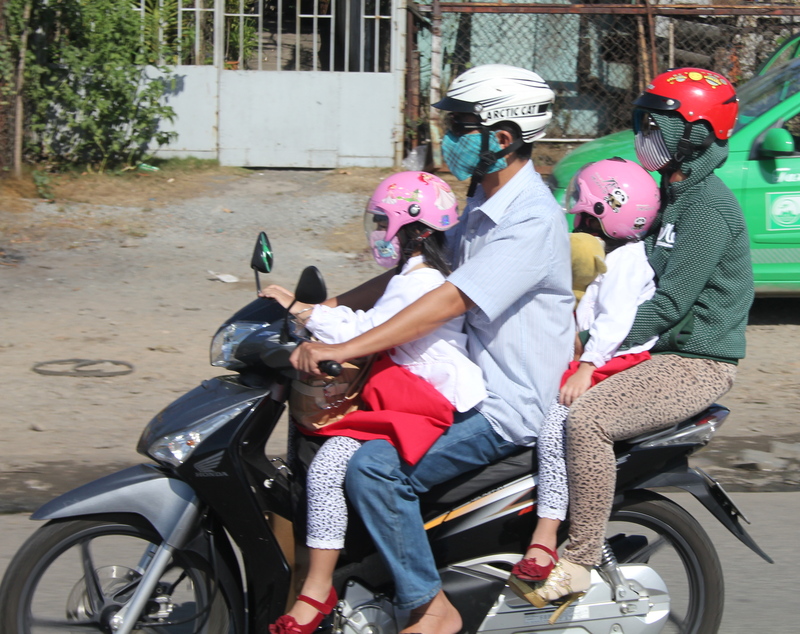 I love the high heels on the Mum, matching outfits and helmets for the girls, plus all the masks. I was quite pleased with this photo as it was taken from our moving car!! 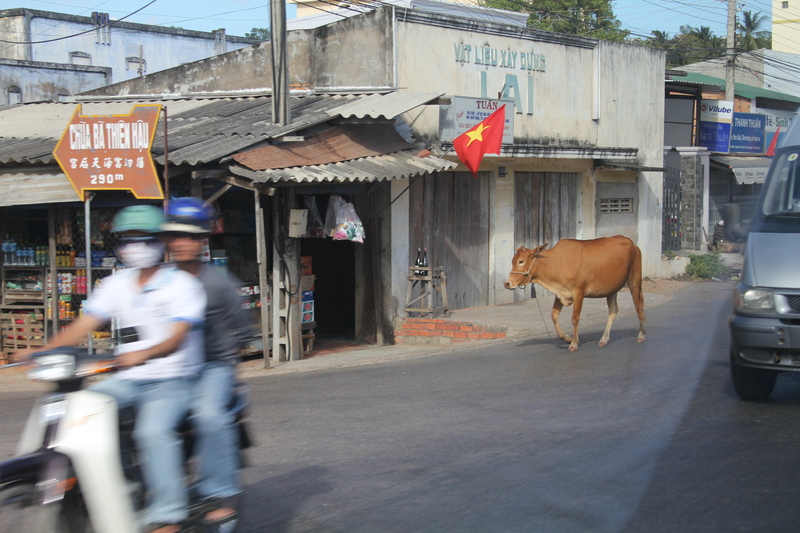 My memory of the 2 wheeled vehicles that dominate the roads in Vietnam! They are everywhere and in such huge volume. 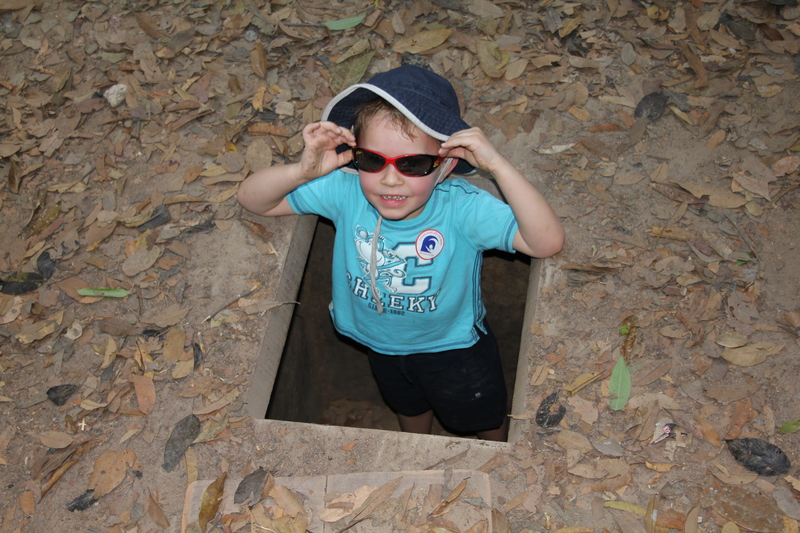 The tunnels of Cu Chi are a network of connecting underground tunnels located in a district to the north of Ho Chi Minh City (Saigon) and are part of a much larger network of tunnels that span across the country. It is rumoured that the tunnel network is over 250KM. 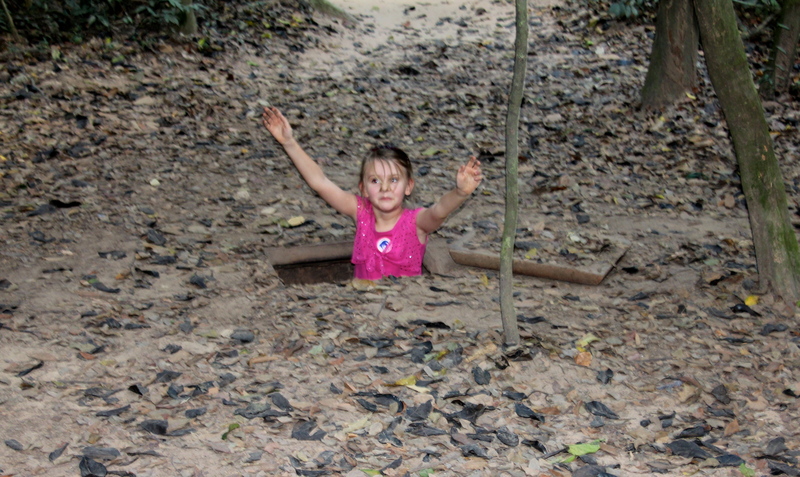 The Cu Chi tunnels were the location of many military campaigns during the Vietnam War (the locals call it the American War) and were the Viet Cong’s base of operations for the Tet Offensive in 1968. 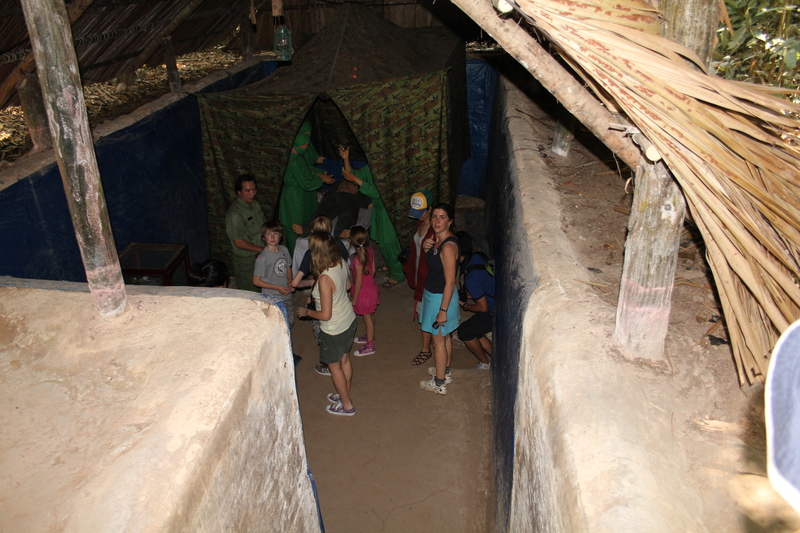 The tunnels were used by the Viet Cong as hiding spots during combat, as well as serving as communication and supply routes, hospitals, food and weapon caches and living quarters for numerous guerrilla fighters. 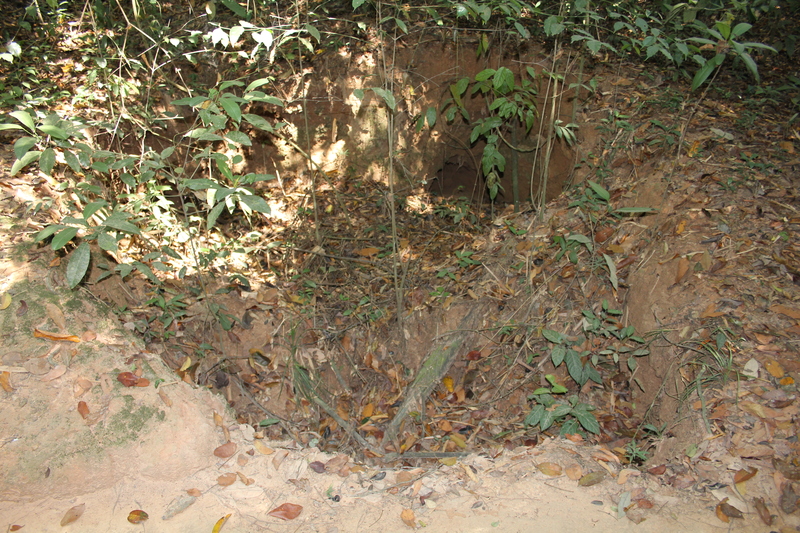 The tunnel systems were of great importance to the Viet Cong in their resistance to American forces, and helped achieve ultimate military success. 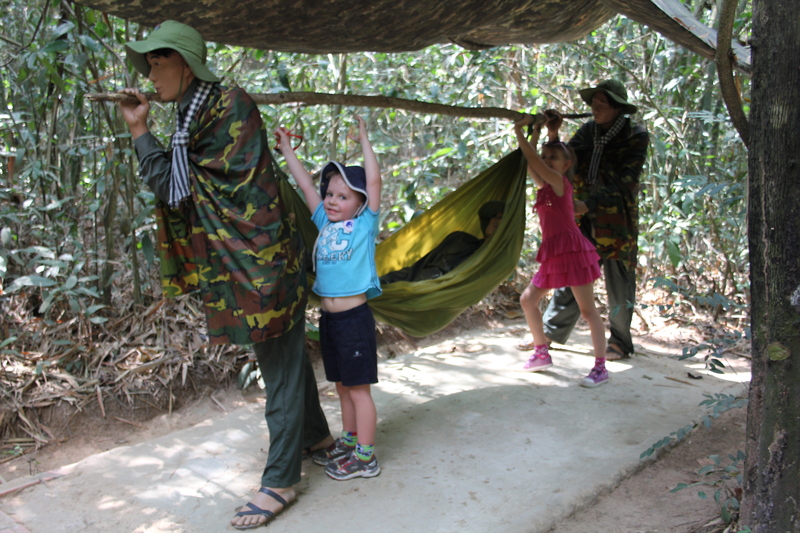 For the Viet Cong and Vietnamese locals, life in the tunnels was difficult. Air, food and water were scarce and the tunnels were infested with ants, poisonous centipedes, scorpions, spiders and vermin. 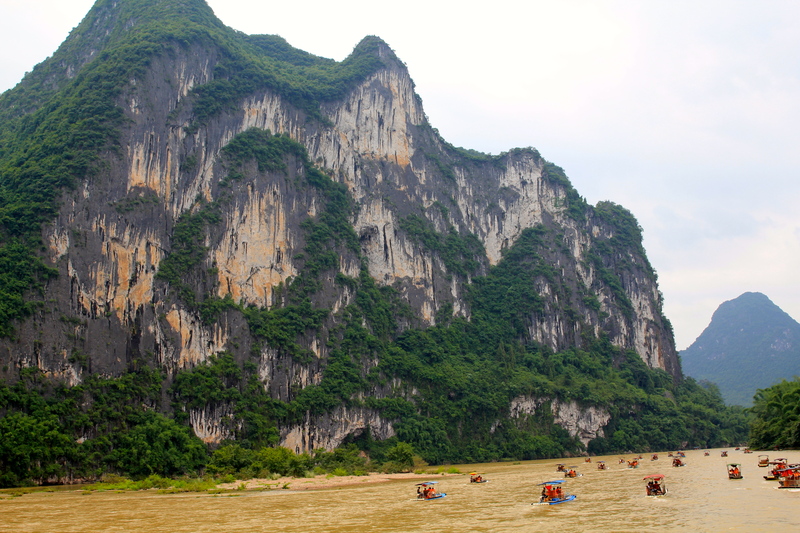 Most of the time, Vietnamese soldiers and fighters would spend the day in the tunnels working or resting and only come out at night to scavenge for supplies, tend their crops or engage the enemy in battle. Sometimes, during periods of heavy bombing or American troop movement, they would be forced to remain underground for many days at a time. Sickness was rampant among the people living in the tunnels, especially malaria, which was the second largest cause of death next to battle wounds. This was an incredibly moving experience. I could not believe the engineering, architectural miracle that was created over many years. 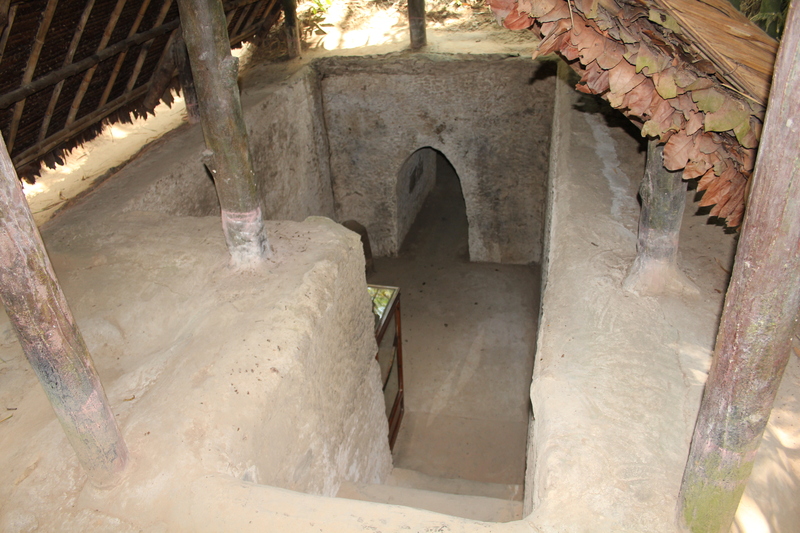 In some places, the tunnels are 4 levels deep and include deep fresh water wells, cooking, sleeping, and even hospital set ups. 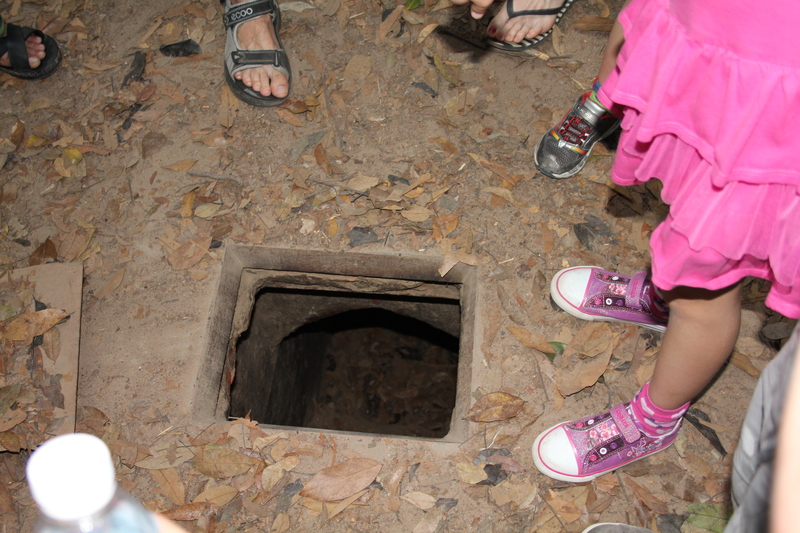 The secret tunnels, which joined village to village and often passed beneath American bases, were not only fortifications for Viet Cong guerillas, but were also the center of community life. Hidden beneath the destroyed villages were underground schools and public spaces where couples were married and private places where lovers met. 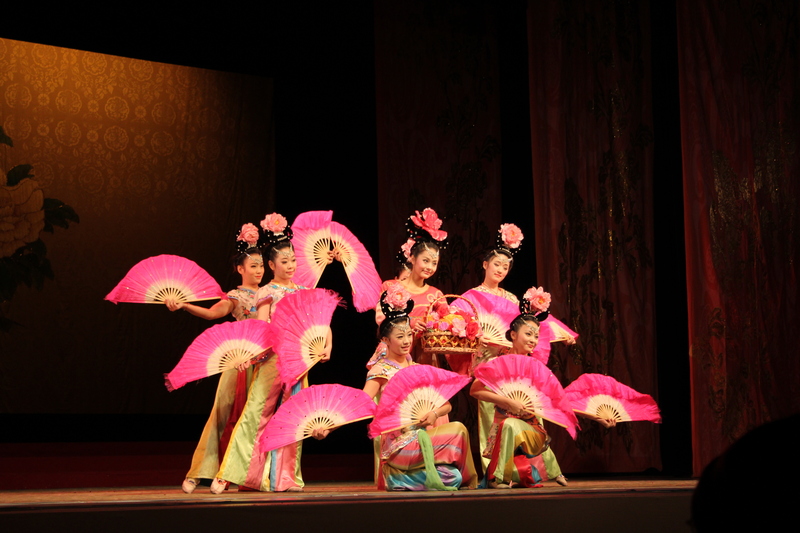 There were even theaters inside the tunnels where performers entertained with song and dance and traditional stories. 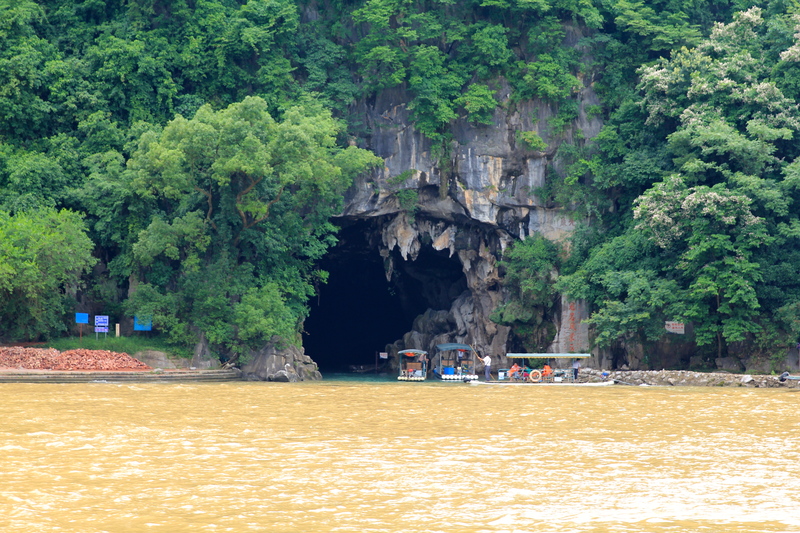 Having previously held the belief that these tunnels were created during the Vietnam War, it was eye opening to discover that the network was actually started decades earlier during the French occupation of Vietnam. The tunnels were extended and built out during the conflict in the 1960’s. 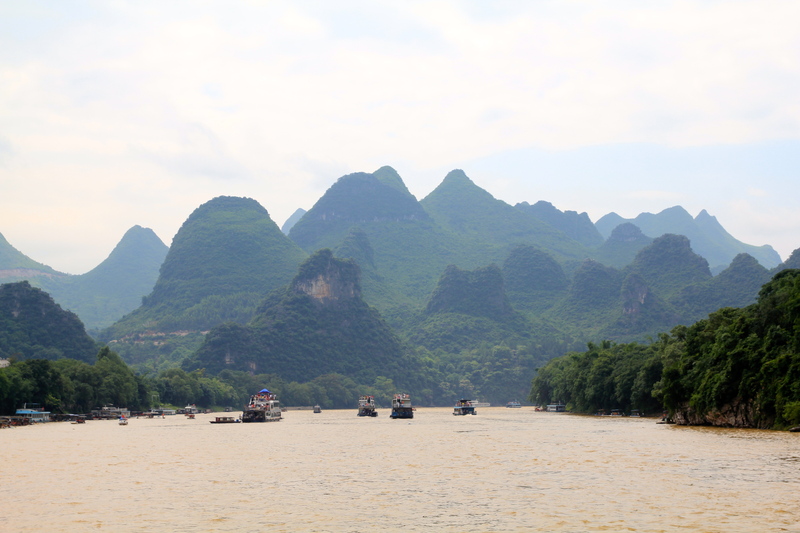 Even more amazing to me was the fact that this complex system was built with bare hands and bamboo shovels. An example of the tunnel network. 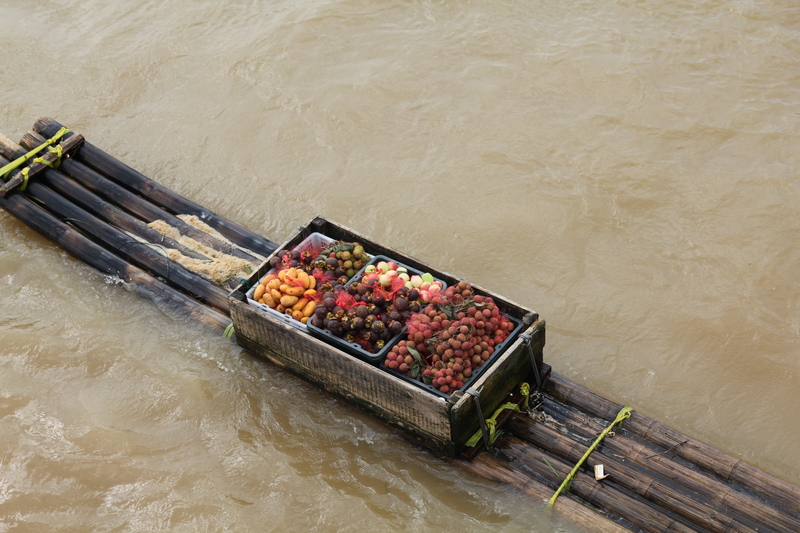 4 levels with ingenious ways to get air into the system, fresh water, cook and live. 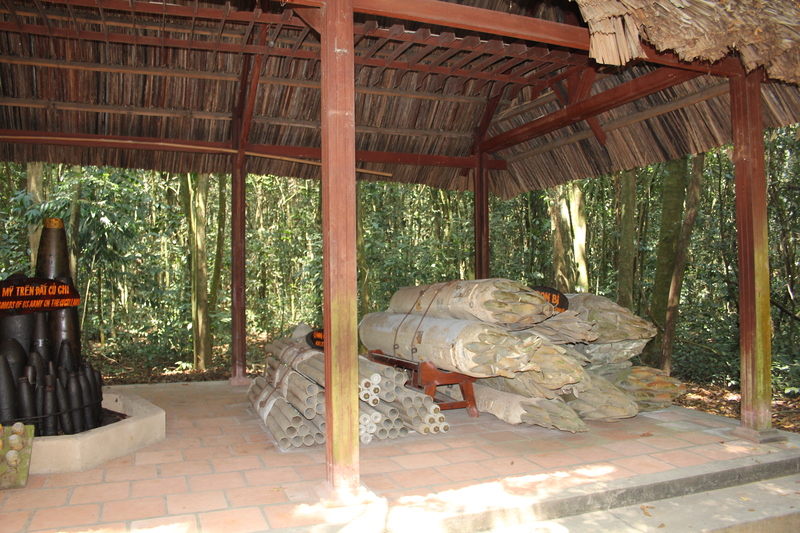 It was horrendous to see the traps that were set for the enemy – so evil with lots of bamboo sticks, covered pits and nasty ways of trapping people. 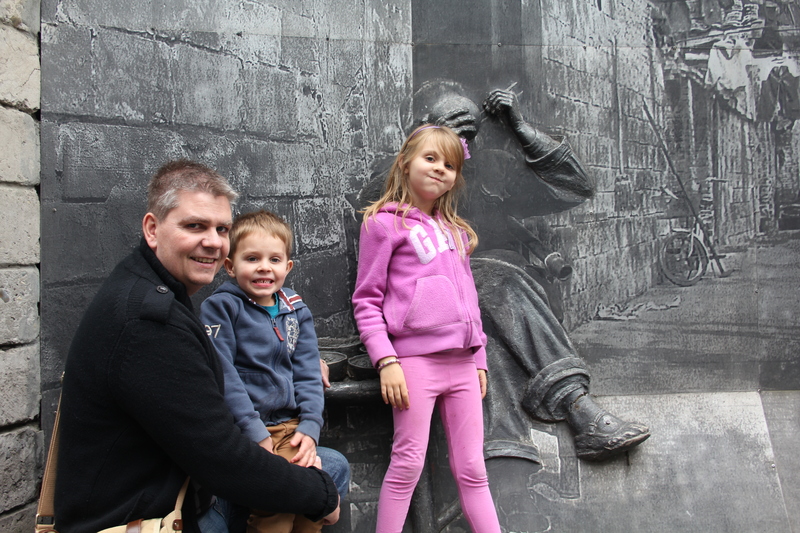 Having lived in America for so long and interacted with many US Vets of this war, it was also interesting to hear the other side. As in any situation there are always 3 versions – his story, her story and the truth, which is usually somewhere in the middle. In summary (in my humble opinion), this was a horrific period in time with no real winners, a tremendous loss of life and has left a lasting impression on both sides of the world. 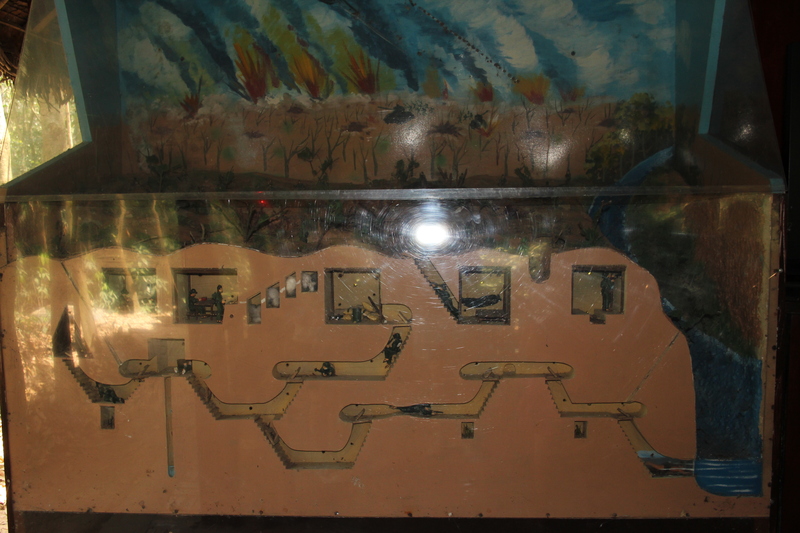 Even in times of peace, the tunnels continue to serve as an enduring tribute to the sheer human will to live and Vietnamese peasants’ wartime ingenuity. 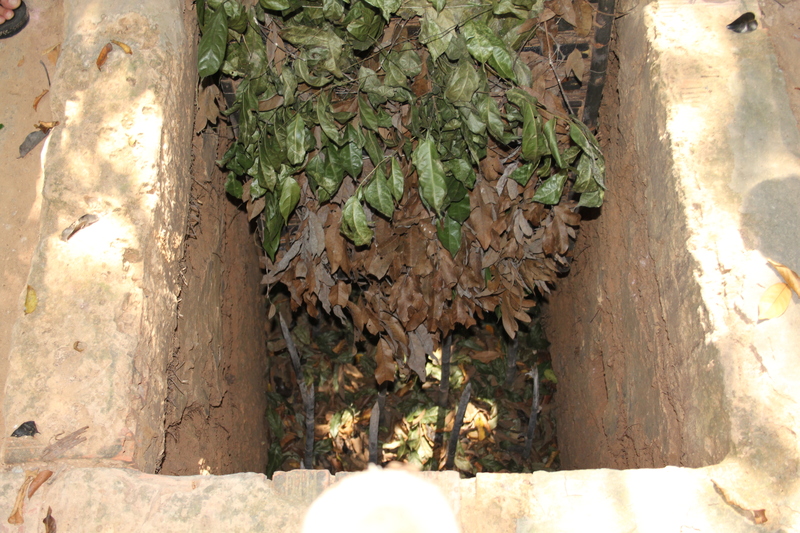 One of the trap doors into the tunnel system. You can see the size of the opening compared with Isabelle’s shoes. I am way too cool for these tunnels. Isabelle popping up at the end of one tunnel. A restored tunnel as a tourist attraction. 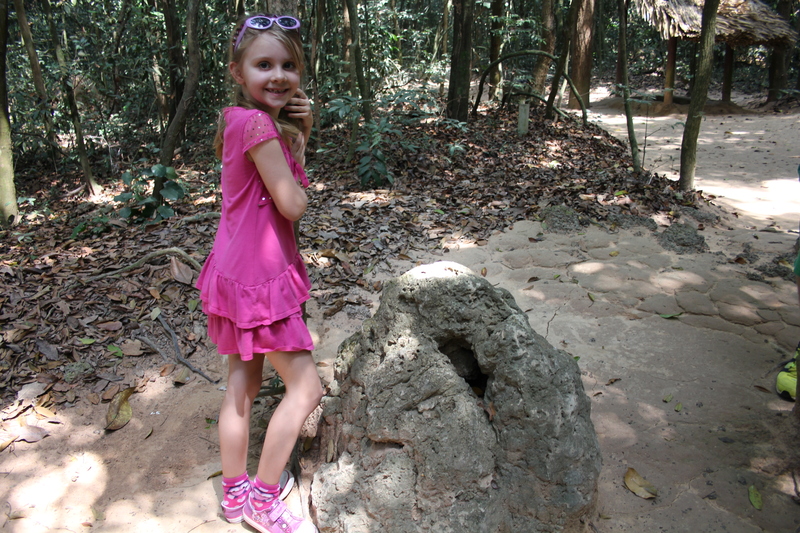 Isabelle standing by a termite hill. Except, this is actually a clever disguise of a lookout for a tunnel. Coming out from the “banquet” tunnel. 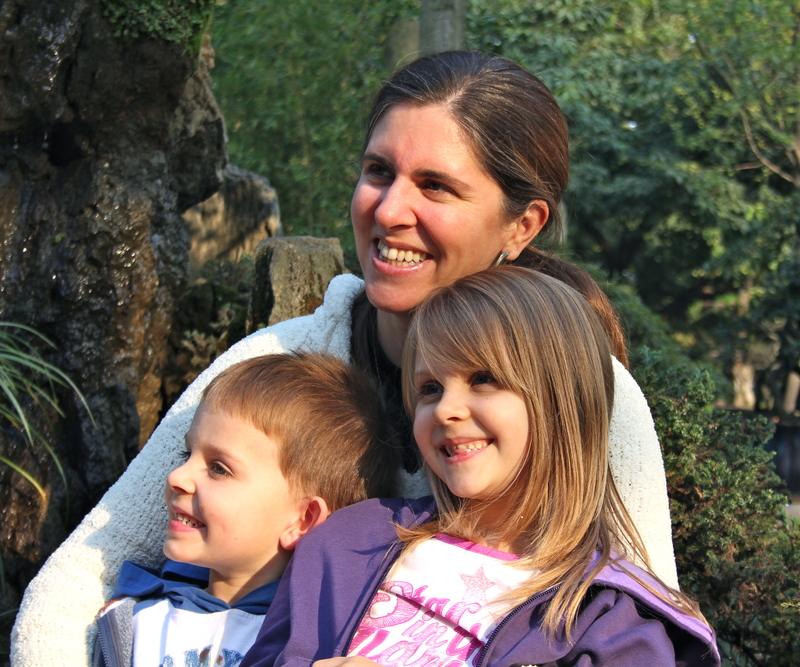 We were so close to many bats – the kids thought that was really cool! The experience of crawling through these tunnels was unforgettable. 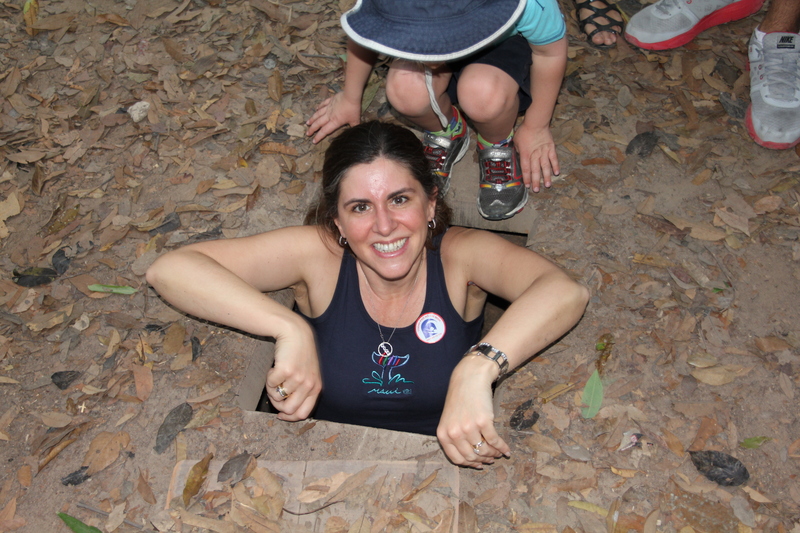 Even though the tunnels at Cu Chi have been “westernized” – made larger for western people to get through and with low level lights installed, it was still a heart thumping, stomach churning adventure. Oliver did one tunnel run and then did not want to go back down. 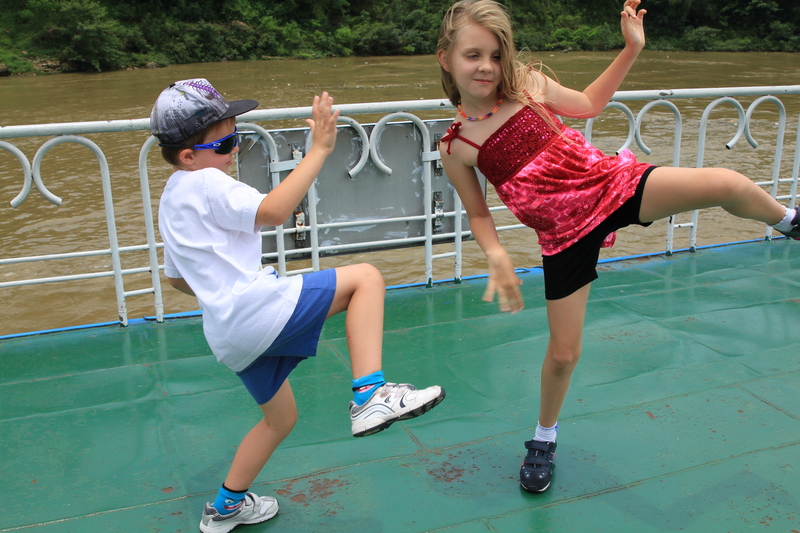 Isabelle and I (along with Jenny, Dan and Luke) went down as many as our guide showed us. Some of them were long, dark and required getting on hands and knees. It was claustrophobic, dirty, dark, dusty and muddy. I highly recommend it! The tourist propaganda on the walk through the jungle to the tunnel entrances. 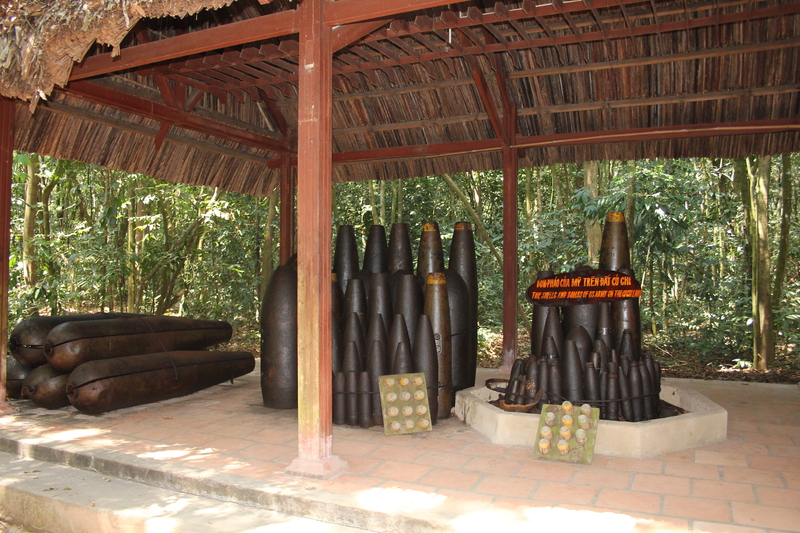 Displays of bombs and missiles! I hope they are all un-armed! Trying out the medical hammock! 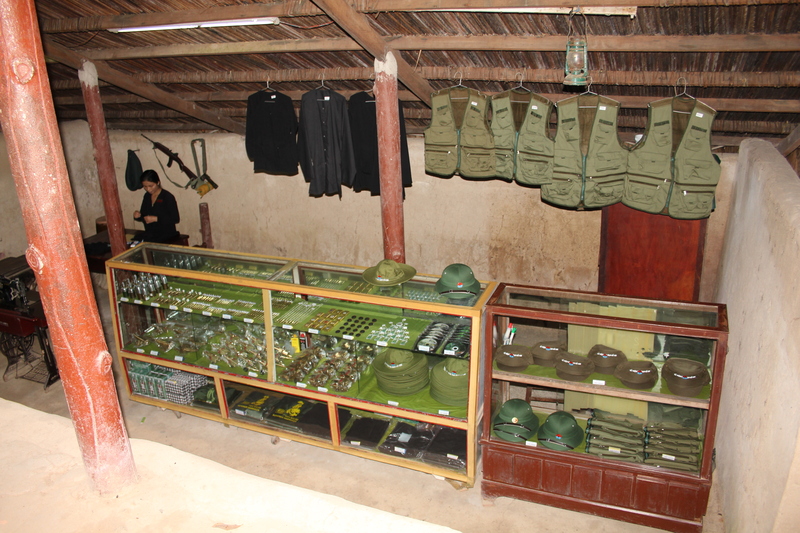 The “souvenirs” that are available for the tourists to buy. One of the nasty traps that is on display. It is camouflaged so well in the Jungle with leaves and dirt. 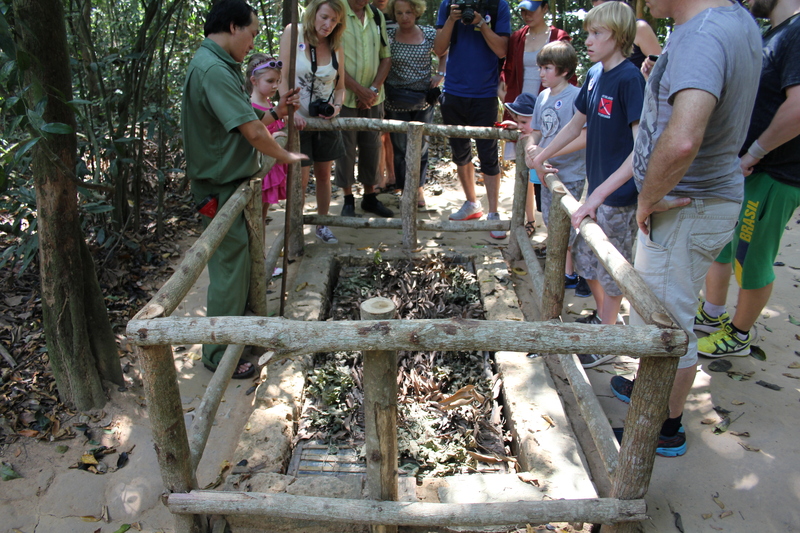 When you step on the trap it flips up and you slip onto the sharpened bamboo sticks. If you are lucky it will kill you, otherwise it is a slow, painful death. 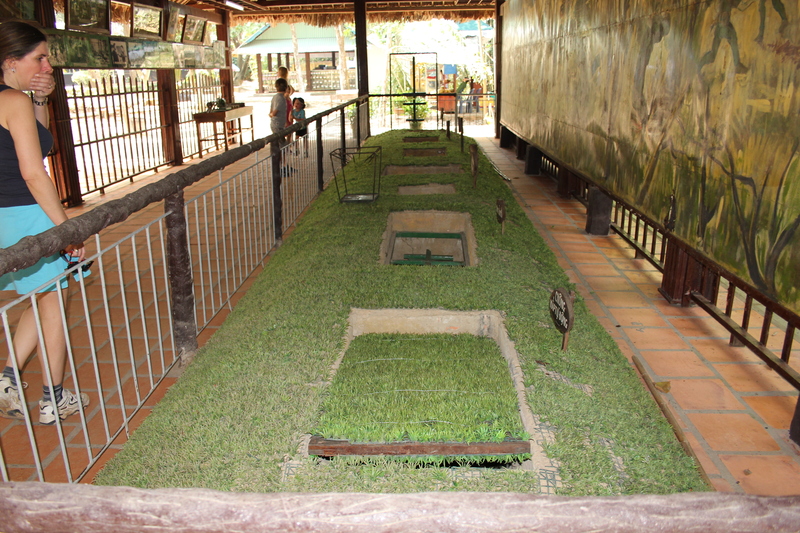 Examples of the many different types of traps that the Viet Cong used in the war. 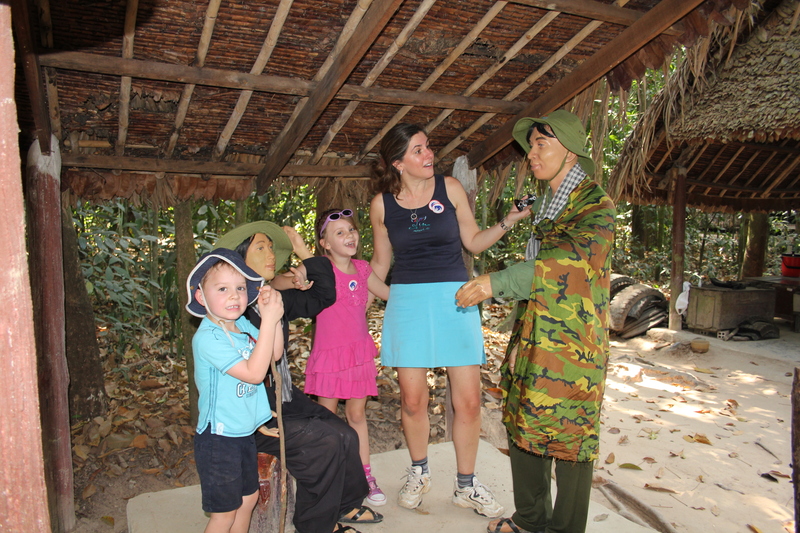 After the tunnel adventure it was time to wander back through the jungle to meet our driver. Along the way we had the opportunity to see a local making flip flops out of discarded tyres! We could also try some of the simple food that was eaten during the War. All of the kids loved the fresh coconuts here! 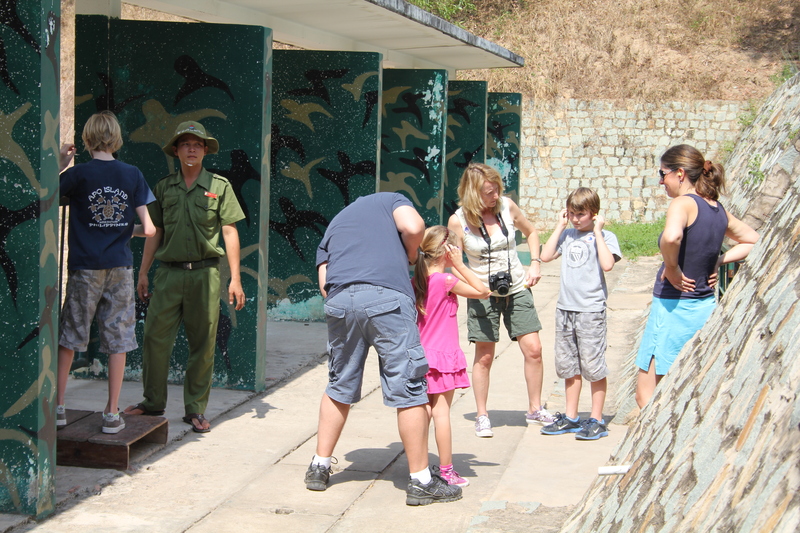 Next stop was at the Firing Range (a very short drive from the tunnels). We wanted to have a go at firing AK47’s. It costs about $1 per bullet to fire and so we bought 8 bullets to share among us. Oliver was too small to reach and John did not want to go. That left the ladies, Dan, Luke and Owen. As Owen had fired many of these when he was in the Army, he was very helpful in setting everything up for us. It was very loud!! 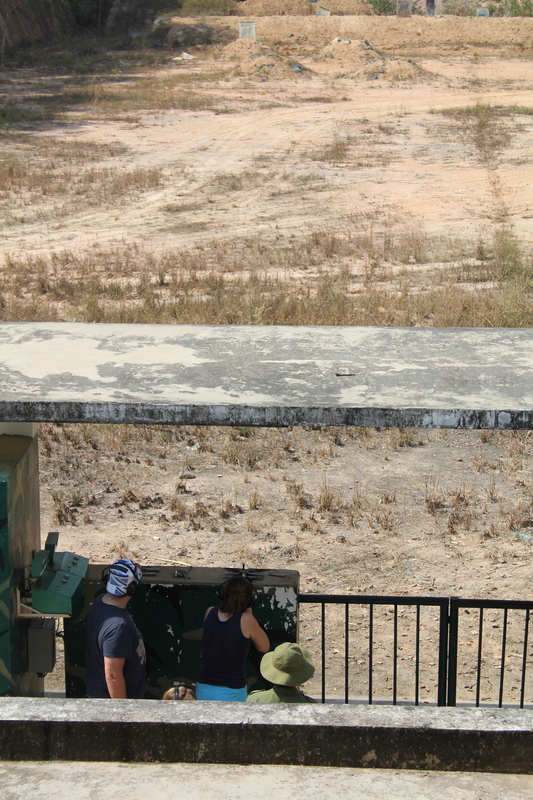 At the firing range. Putting ear plugs in to wear underneath the defenders. Even so, the shots were very loud! Our hotel had recommended and booked a restaurant for us to have lunch at. 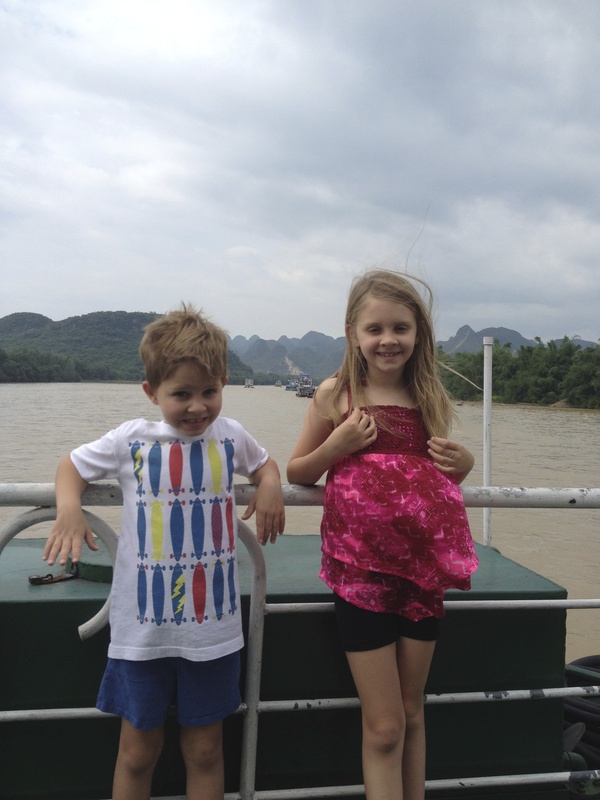 This was about 30 minutes from the tunnels on the way back to the hotel in HCMC. 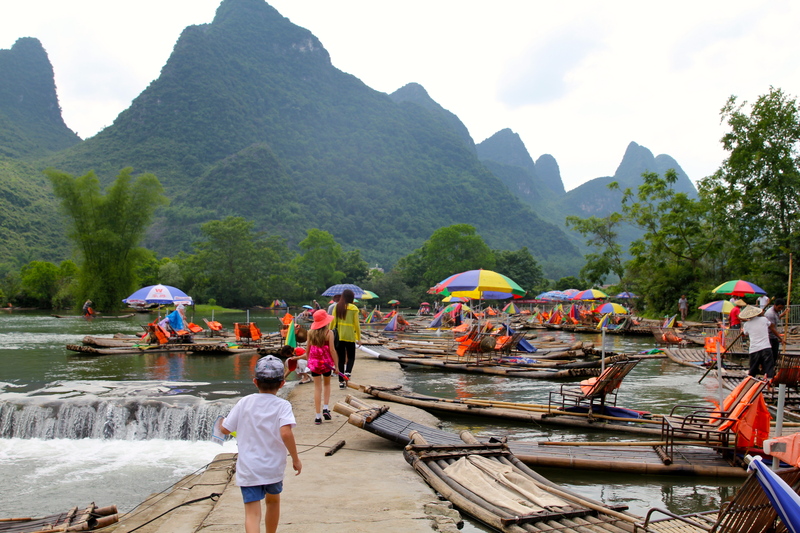 Our van pulled up into an idyllic place and we were very excited about more local food. Especially me, as I cannot get enough Pho!! We were a little suspicious that there were no cars or people around. True enough, once we walked over the bridge to the restaurant, a man came out and told us he was shut because of Lunar New Year. Our driver tried to explain that we had a reservation that had just been made that morning, but it was obvious that we were not going to eat there that day! A fantastic location for the lunch that never happened! We decided to go back to the hotel for a very late lunch and more pool time to relax. 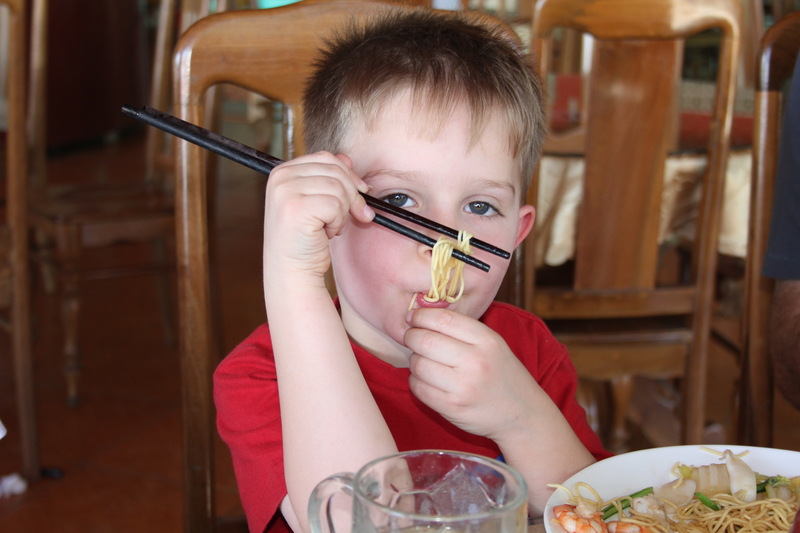 Oliver is getting used to chopsticks and is getting quite good with them! A New Year money tree. 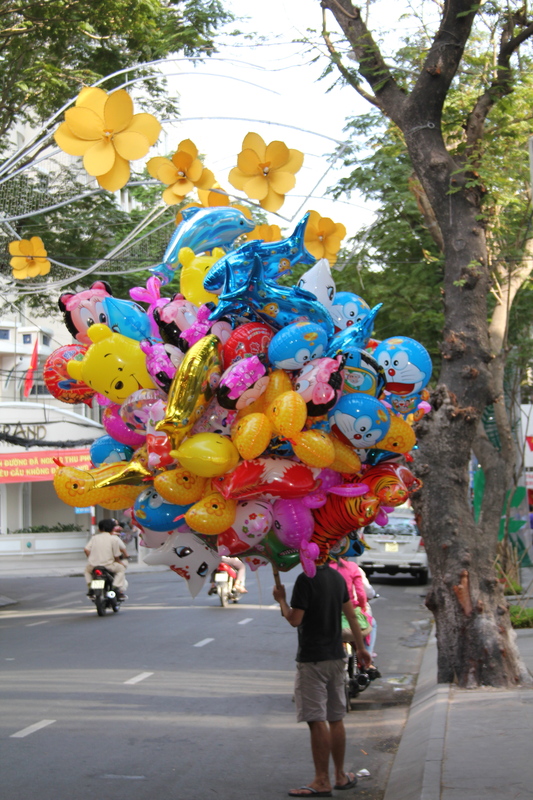 You see these all over China, Hong Kong and Vietnam at the Lunar New Year time. 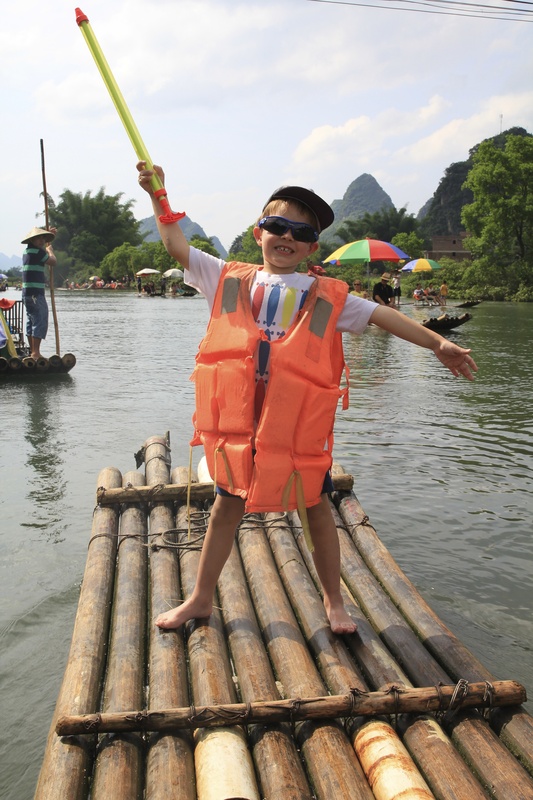 I am sure that most of Asia that celebrates this new year does the same thing. Red is a lucky colour in this part of the world. 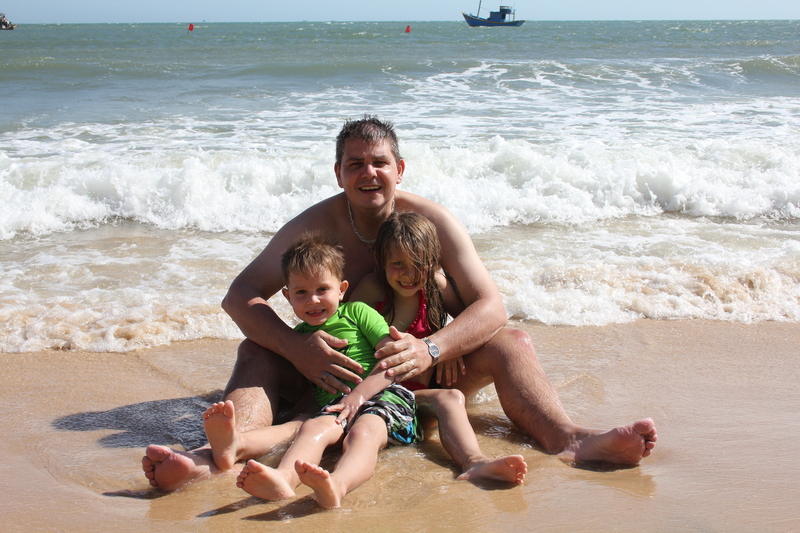 The next morning was the start of our relaxing break at the beach. The only thing that stood between us and that was the long, boring 5 hour car journey. It is only 114 miles (according to Google Maps) but because the roads are so bad, the entire trip was done at about 35 MPH at top speed! We had considered taking the train, but colleagues of mine who have travelled extensively in ASIA, advised against this in Vietnam. Apparently, the local kids all throw stones and rocks at the passing trains so all the windows are boarded up. You cannot see out and you are stuck for an equal length of time to a car journey with many other people. 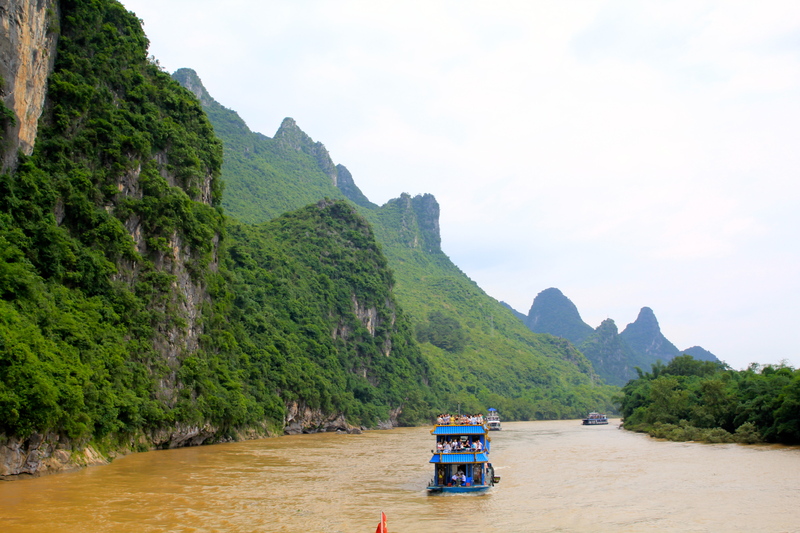 At least, when we had a driver we could stop at our request and also see some of the beautiful scenery of this lovely Country. There are rest areas set up at regular intervals along the road. Each of these has a shady hammock sleeping area. 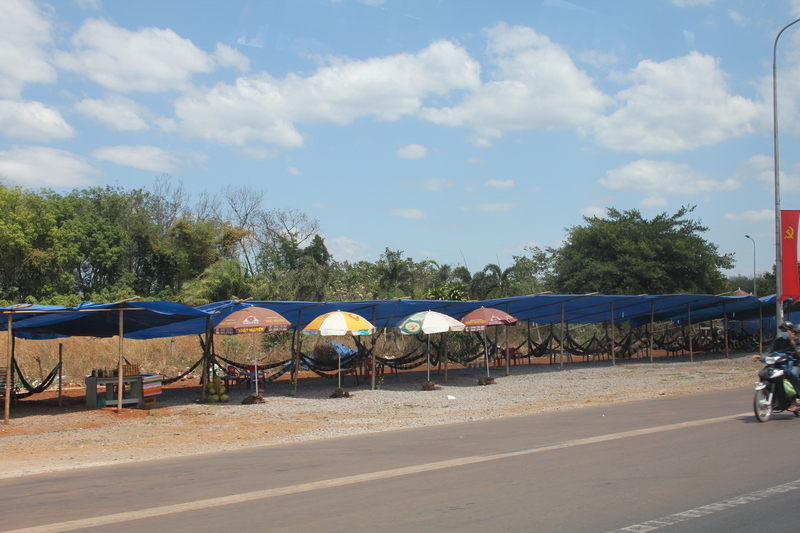 A rest area on the side of the road with hammocks for sleeping. 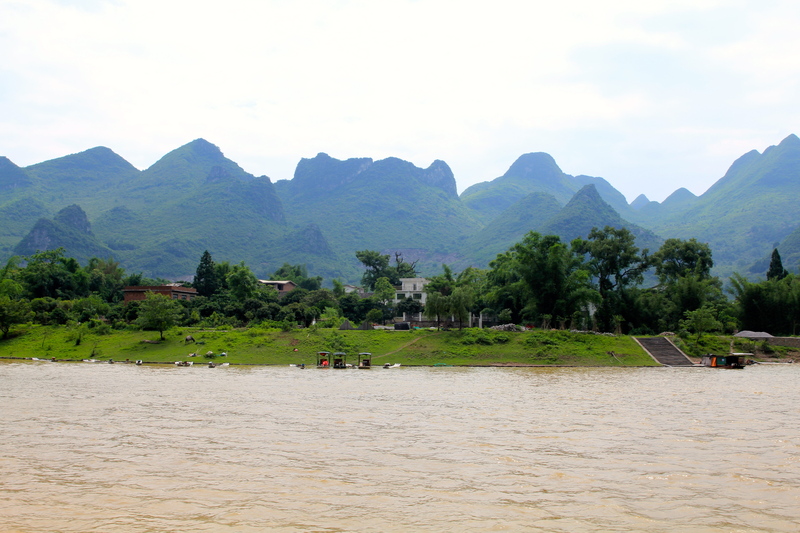 Another photo taken from our moving car! Our driver was constantly on the horn – beep, beep, beep, beep, beep, every time we overtook a scooter/motorcycle. As I already said that these outnumber cars by 20 to 1, the horn feels non-stop and became quite irritating. 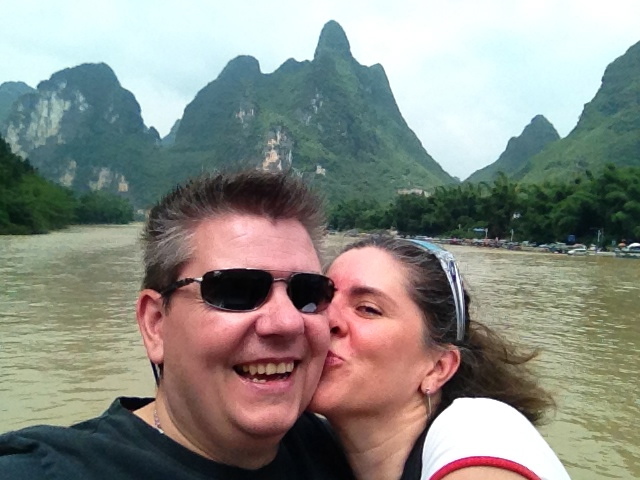 We stopped for lunch where I had …….. Pho!! Eventually we got closer to the ocean and passed through some lovely little villages. There is much evidence of a land trying to re-invent itself and compete in the 21st century. It is obviously still a very poor nation and it is hard to see so much of that on the sides of the roads. 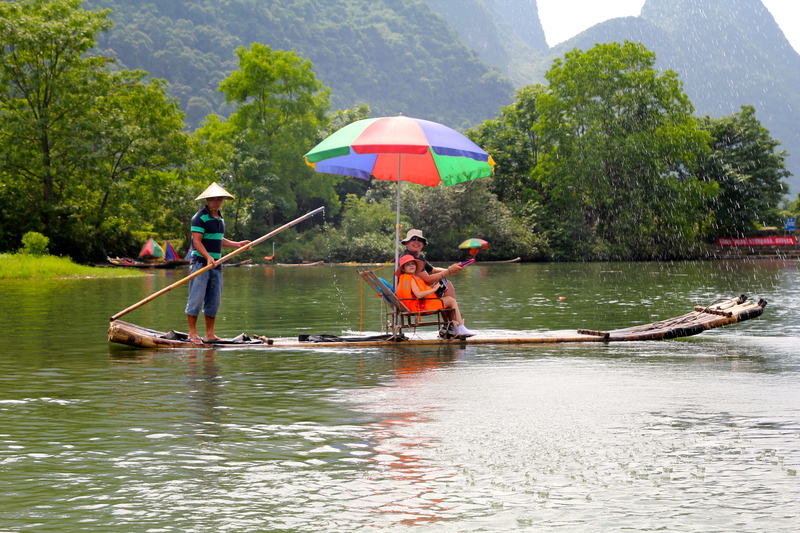 But, the Vietnamese people are wonderful – very friendly, always smiling and a warm, welcoming race. Evidence of the Vietnam war is everywhere. You would think it was more recent than over 40 years ago. The things you see on the road are amazing! This is why a 114 mile journey takes over 5 hours! We arrived in Mui Ne on the coast in the late afternoon and met the owner of “Villa Panda” who showed us all the facilities of this lovely Villa on a golf course by the ocean. This would be our home for the next 5 days. 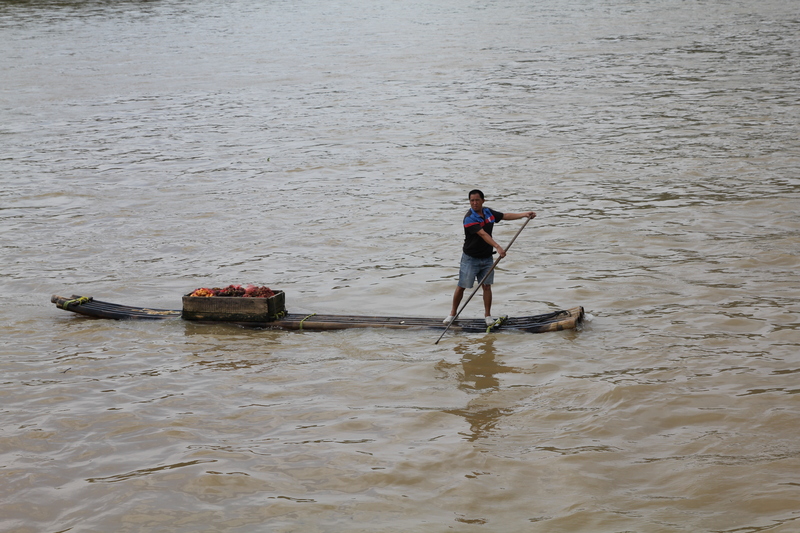 He also took John and I shopping to buy some staples to keep us going. 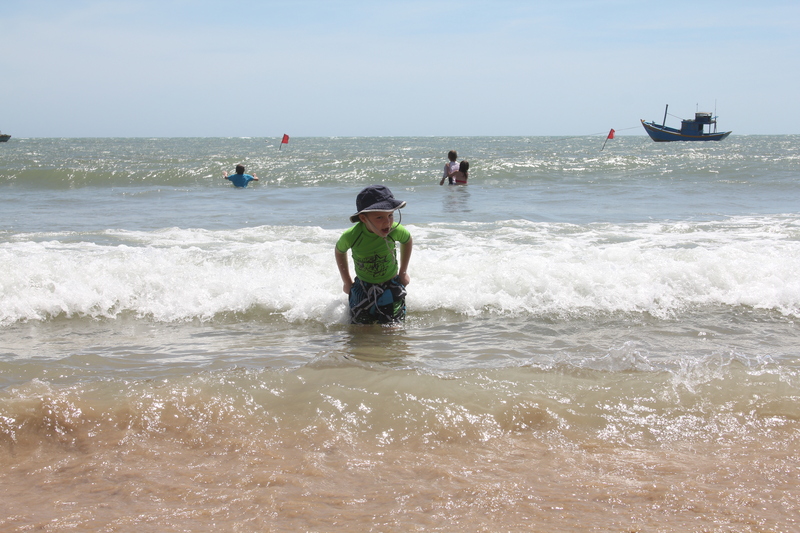 He kept a running commentary going with restaurant and bar recommendations, shopping and beach access. Once back at the Villa we quickly unpacked and settled in. Time to explore! 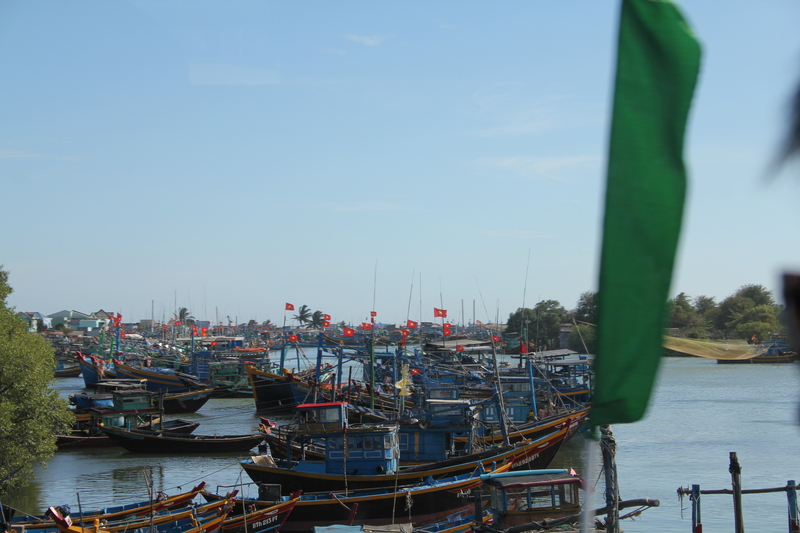 Tourism has transformed Mui Ne into a resort destination since 1995, when many visited to view the total solar eclipse in 1995. 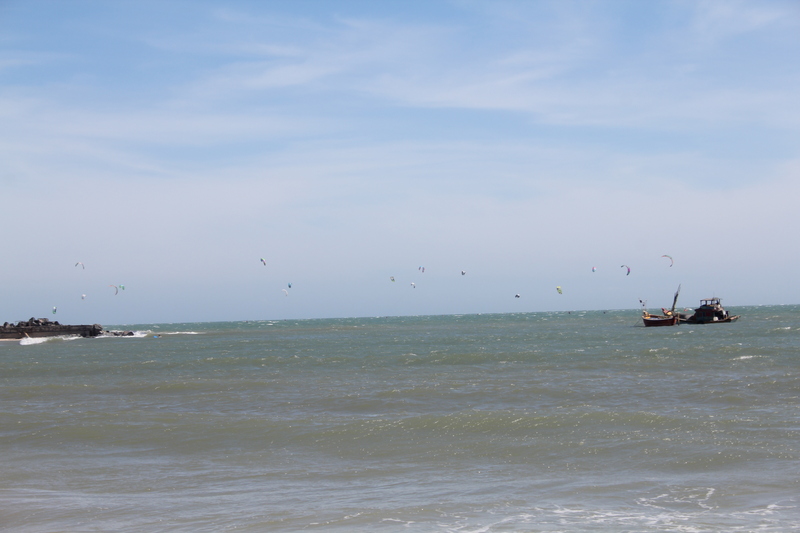 It has many resorts on the beach, as well as restaurants, bars and cafes. 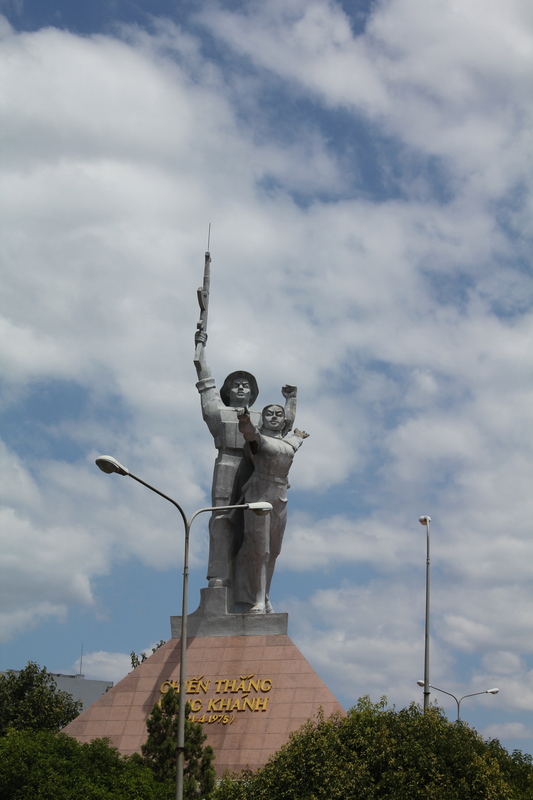 Mui Ne is a popular destination for Russian tourists, and many of the restaurants and resorts are Russian-owned. 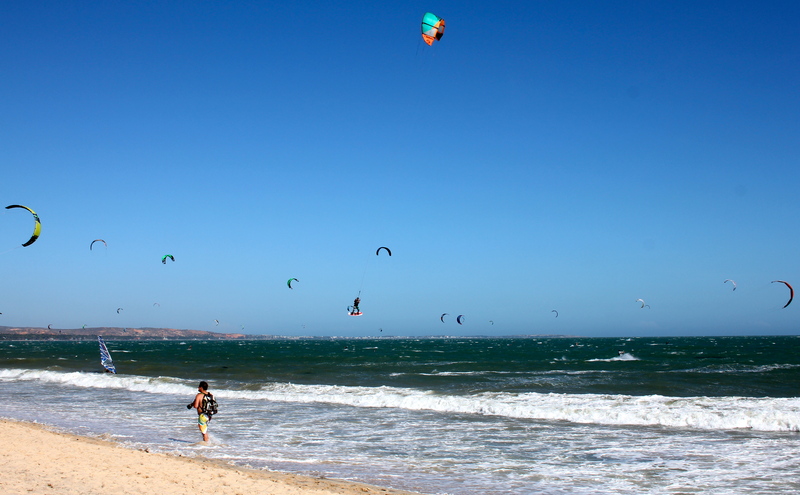 The strong sea breezes make this the kite surfing capital of the world. None of the beaches are crowded and I love that feeling of space when you are relaxing. Tranquil beach. So peaceful to just chill and watch the surfers. The town has a Florida feel to my mind. It is very casual and relaxed. 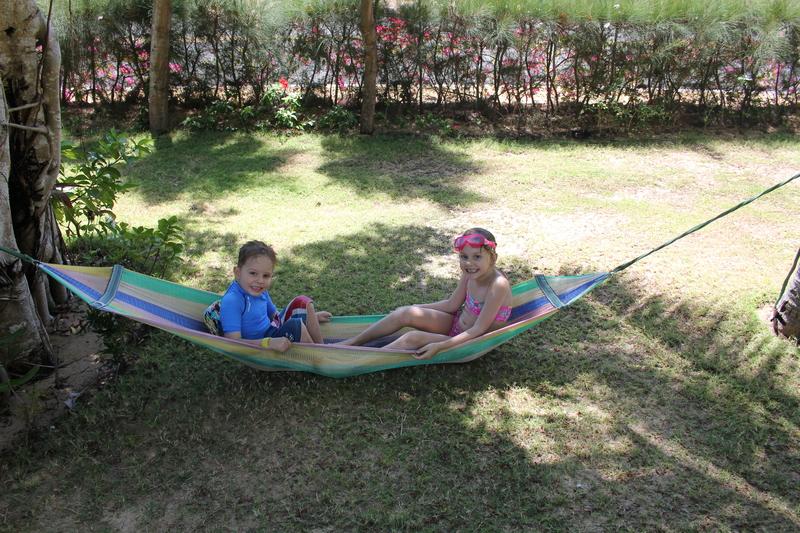 Our villa is lovely – 4 double bedrooms, so perfect for our 2 families of 4. The kitchen and living room are spacious and open. We could walk to the beach but it would be a long uphill return and it is only a 5 minute car journey. The sunset view from our back patio. 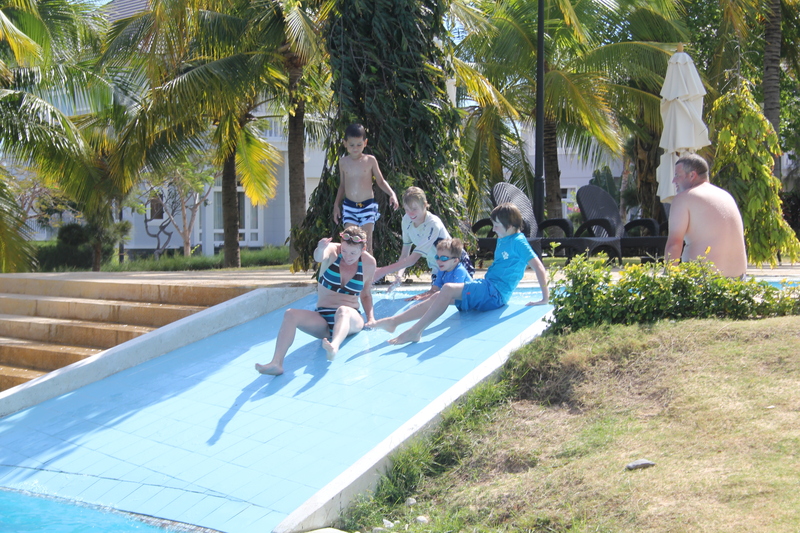 The golf course has a 5 star hotel which has a luxury recreational area with a pool system of 5 interconnecting pools. 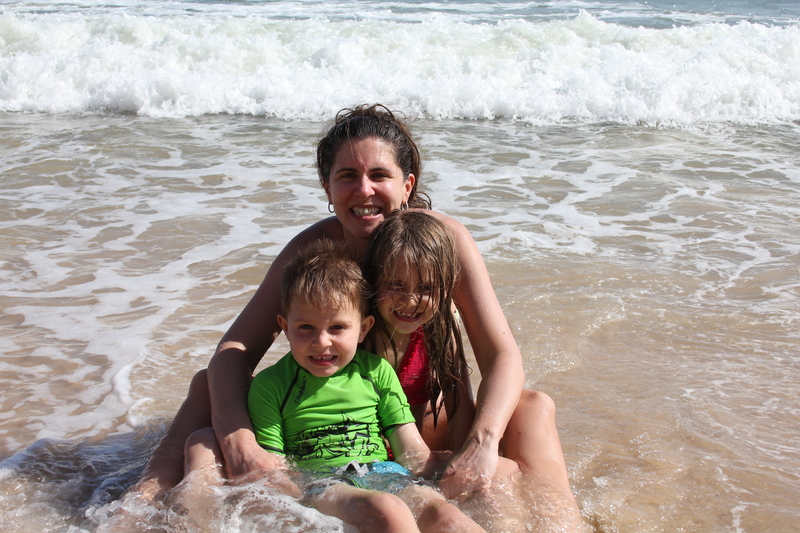 Our next few days were spent alternating between the beach and these pools. It was very relaxing. 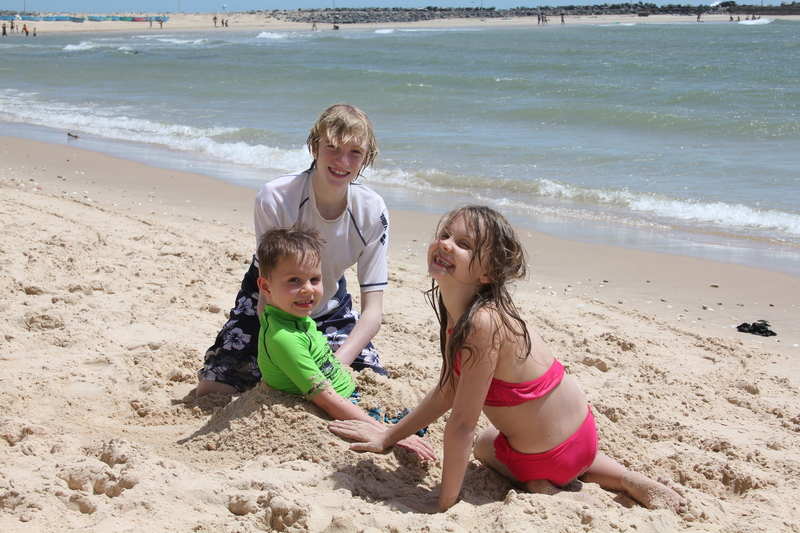 Burying each other in the sand at the beach. 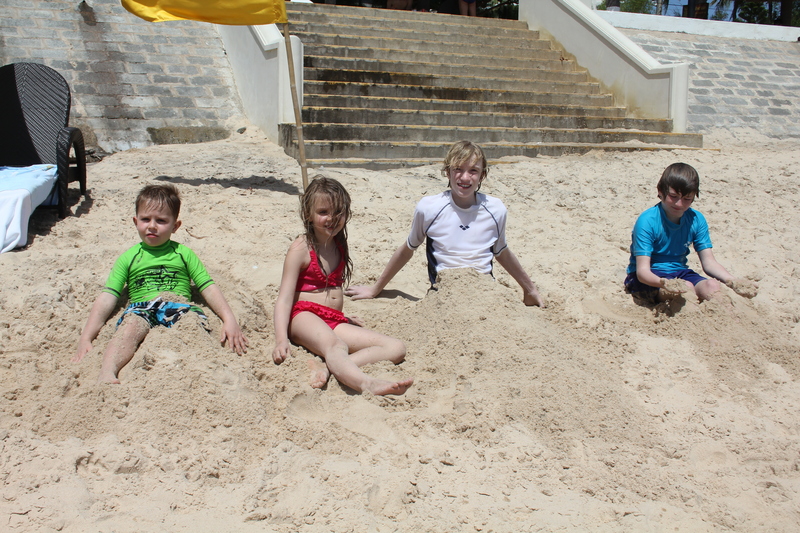 Dan buried Oliver up to his neck! And, he loved it! 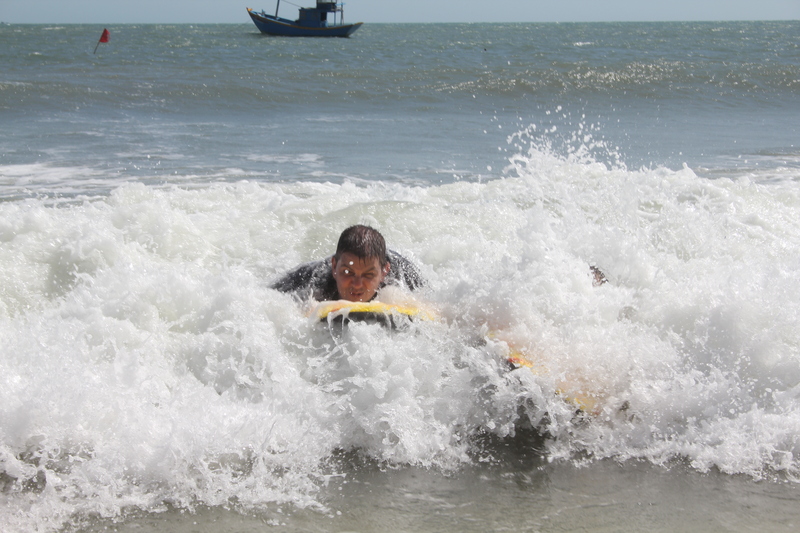 Jenny and I bought some boogie boards for the kids. These were a big hit and not only with the children. All the adults couldn’t resist either. 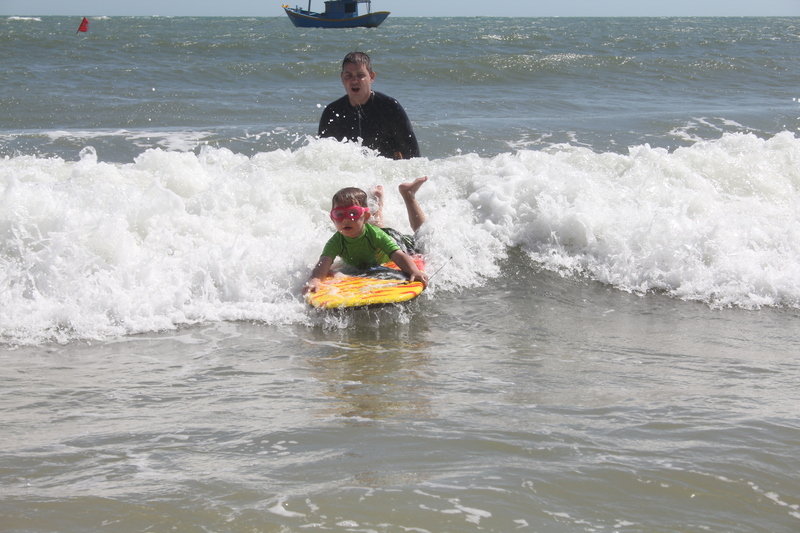 The waves were perfect for this – large enough for fun for all, without being too rough for our littlest man! 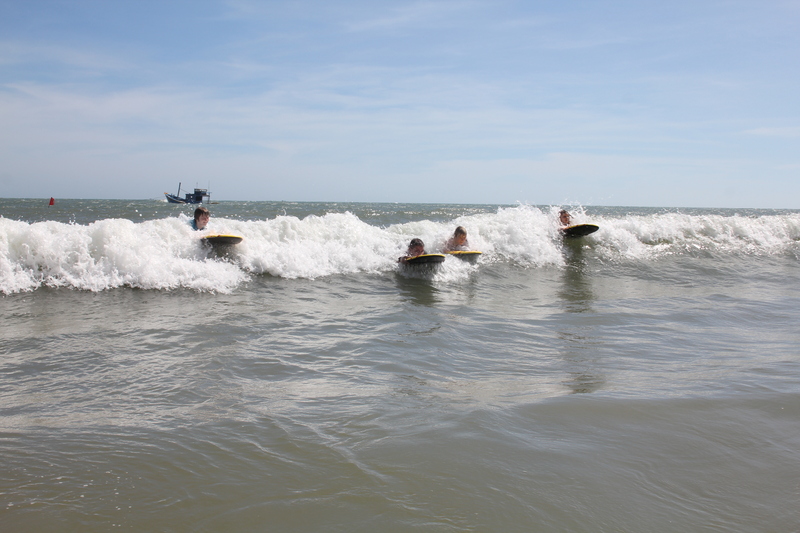 Luke, Isabelle, Dan and Owen catching a wave. 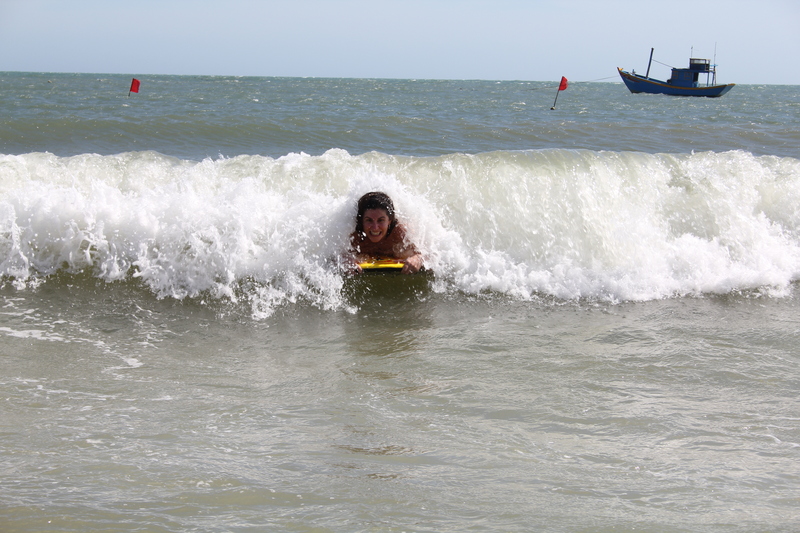 My turn to drink the ocean! 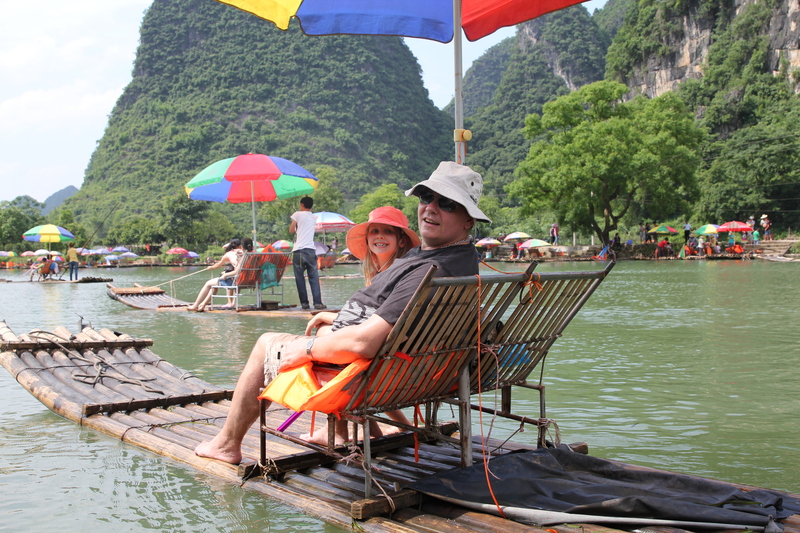 The hammocks were all over the resort – not just at rest stops along the road. 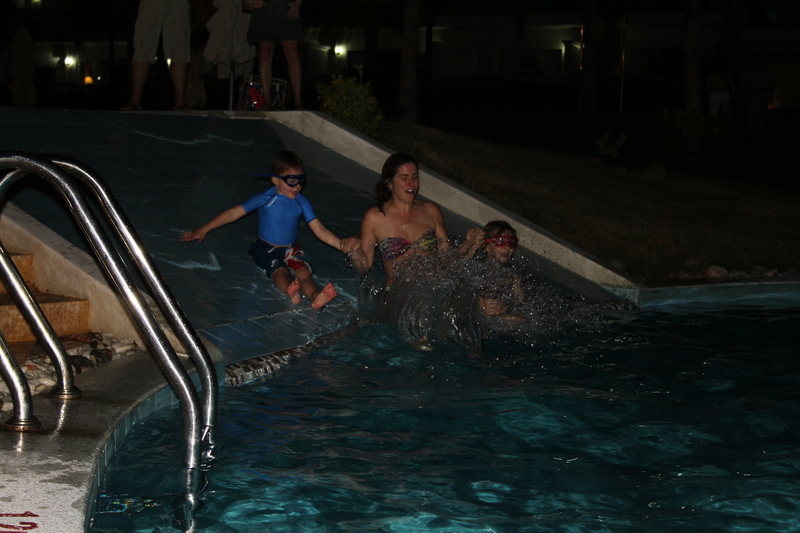 Nighttime swimming was a first for Isabelle and Oliver and they loved it. The slides were fun for everyone. 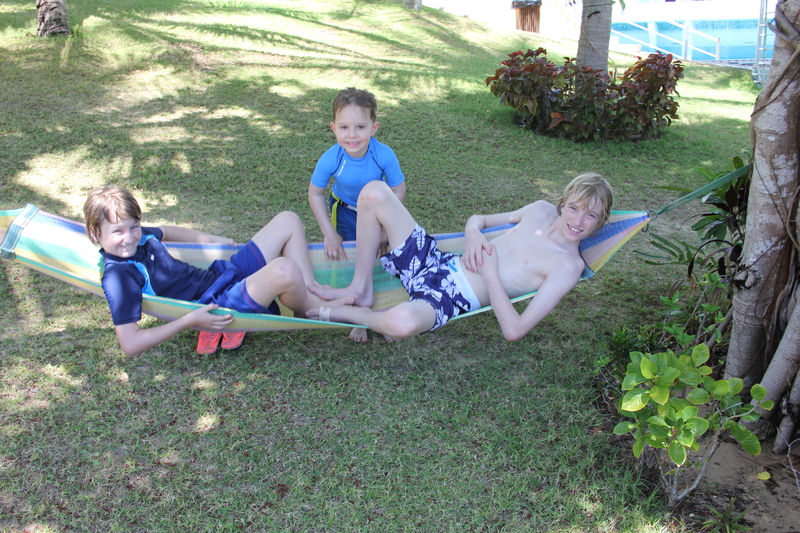 Good sharing of the hammock. 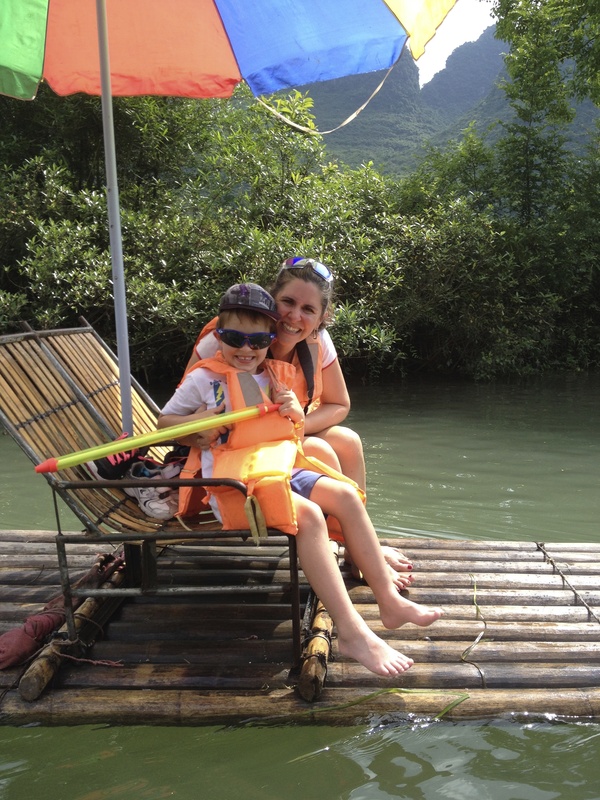 When Mr John was “checking the fishes” Oliver pushed him in. He loved this and thought it was hilarious. Oliver, Dan, Luke, Jenny Isabelle and Sara. 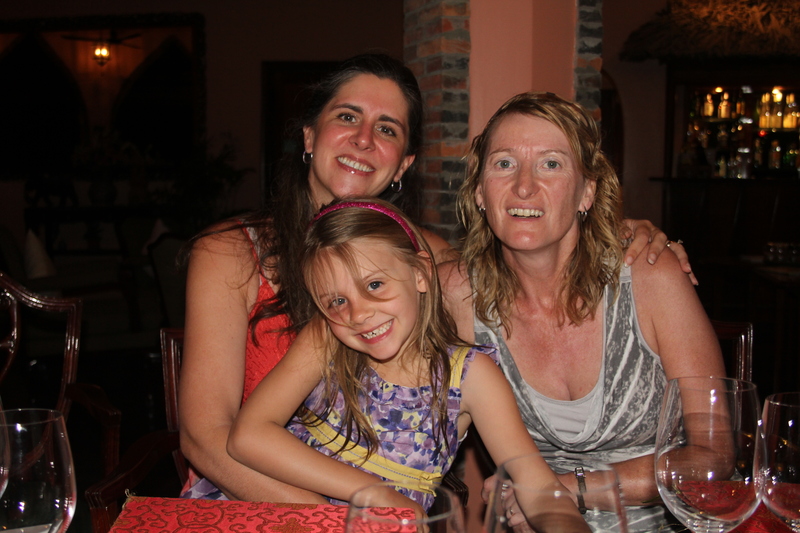 Great Italian dinner in Mui Ne. 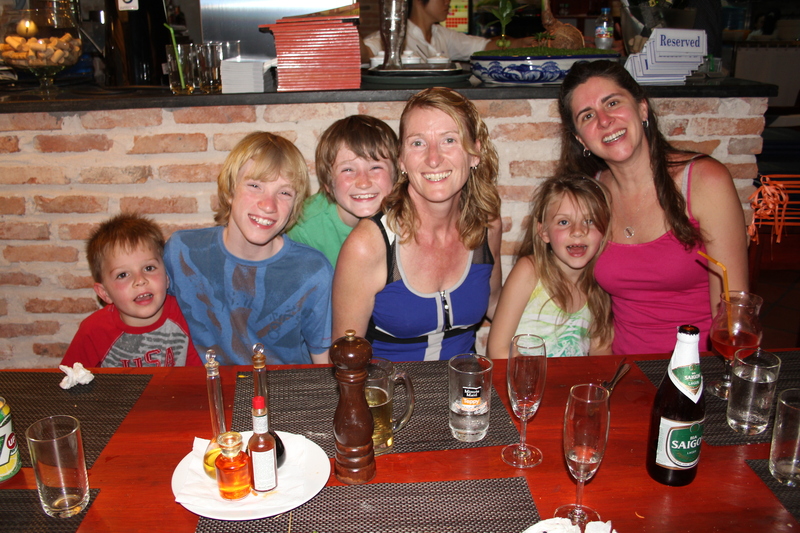 Final night in Mui Ne and we went to a lovely restaurant. All the boys here. 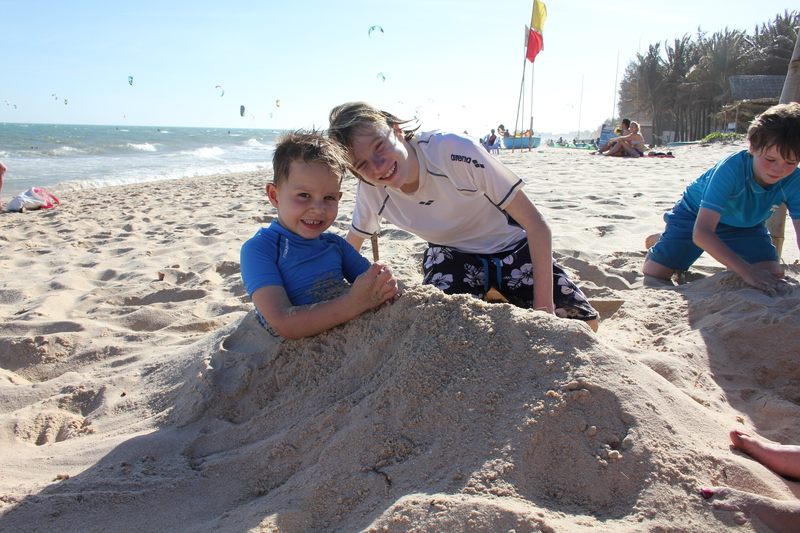 After a very relaxing stay in Villa Panda in Mui Ne, it was time to return back to HCMC for our flight to Hong Kong. 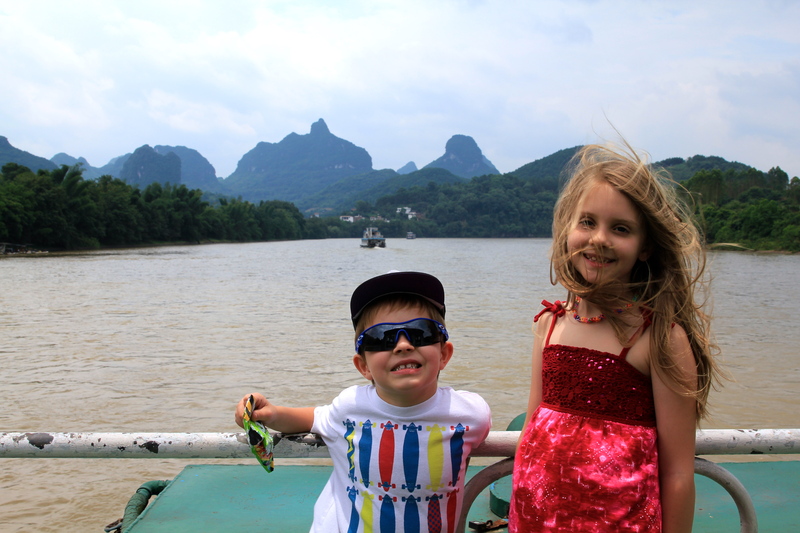 John & Jenny and their kids were an absolute delight to be away with and I can’t wait for our next adventure! It was another horrendous 5 hour trip in the car, but this time we started it at 4.30am to make our flight time. 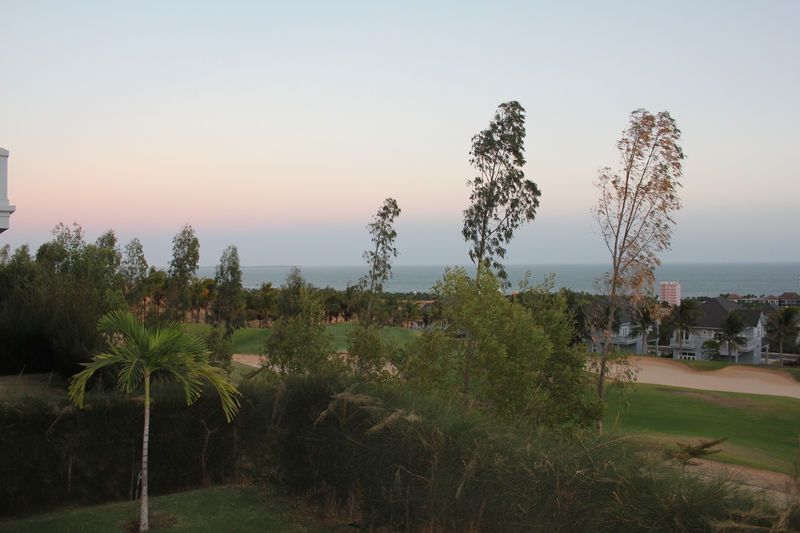 It was lovely to watch the sun come up and see so many people going to church at 5:00am – they were packed. I was very surprised to see so many Christian churches – I guess that is the consequence of prolonged European influence. 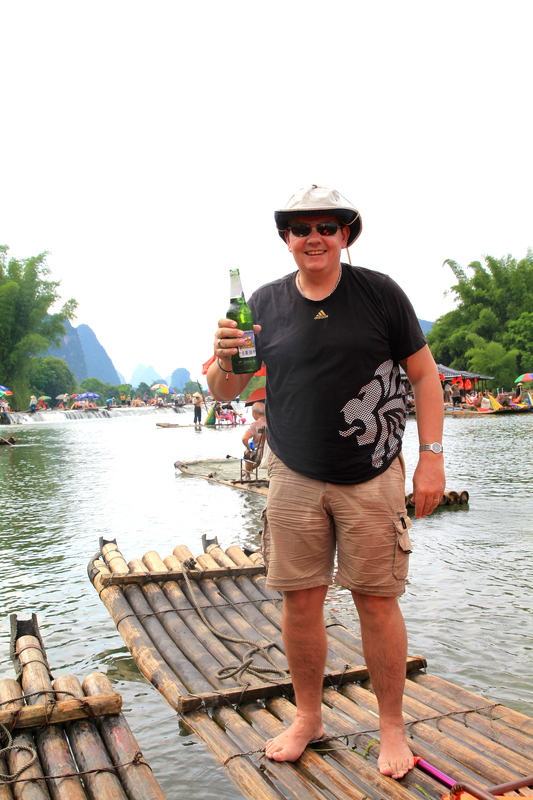 The French baguettes in Vietnam were also some of the best I have tasted! We passed field after field of dragon fruit growing. I thought this was marijuana as all the plants had lights around them! In stopping for the toilet on the way back, it also is apparent that squat toilets are not unique to China! 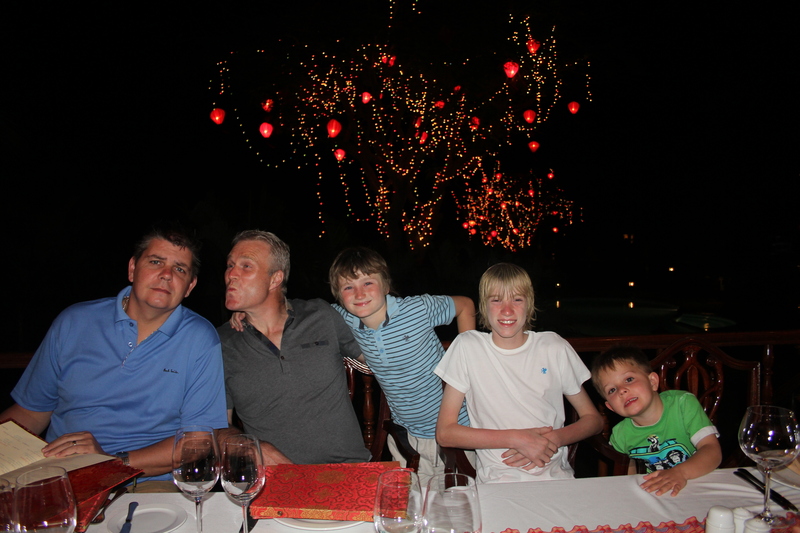 A fantastic Chinese New Year for all us! 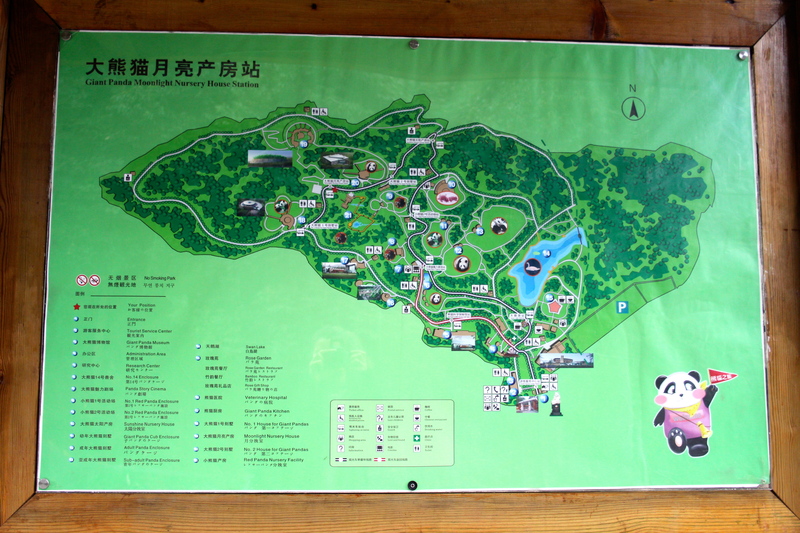 Chengdu is the capital of Sichuan Province in southwest China and is home to 14 million people. 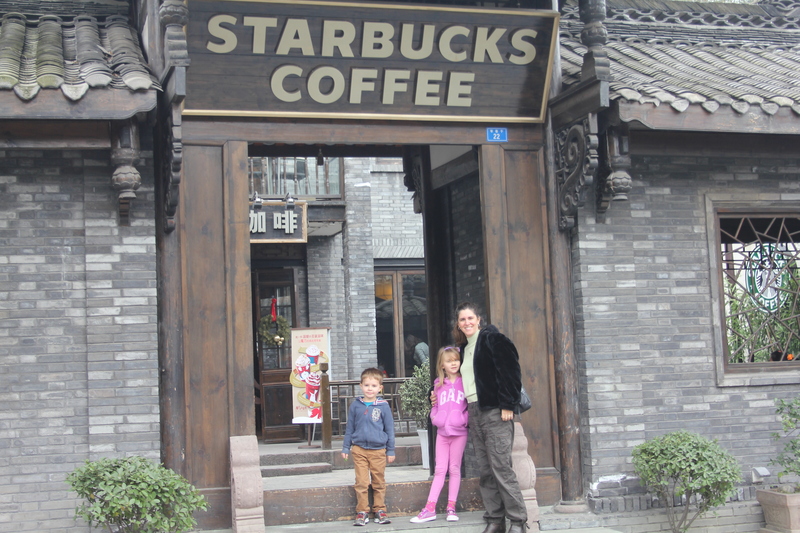 It is a 3 hour flight from Shanghai and this is where we set off to on Saturday morning. 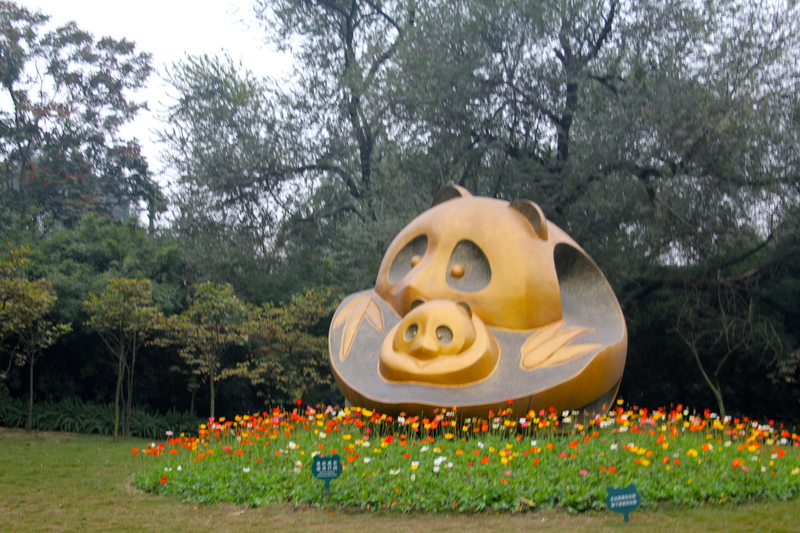 Chengdu is also known as the Country of Heaven! 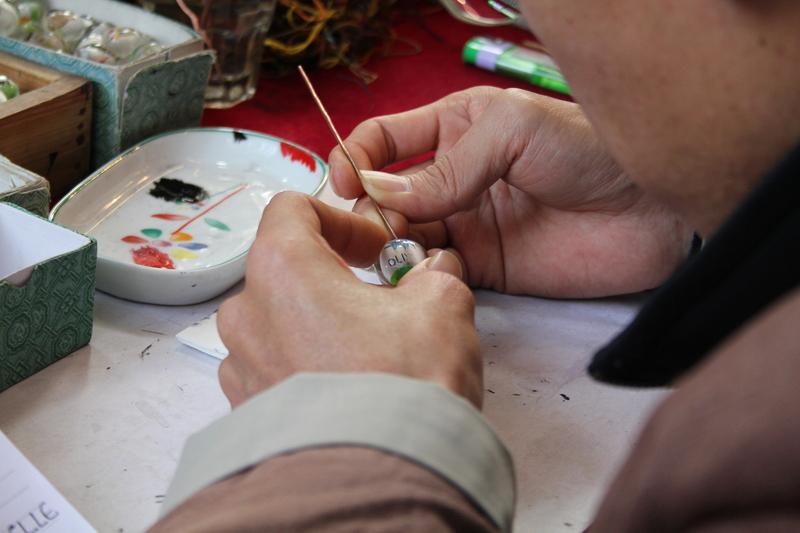 It has a deep history which can be traced back over 2300 years. 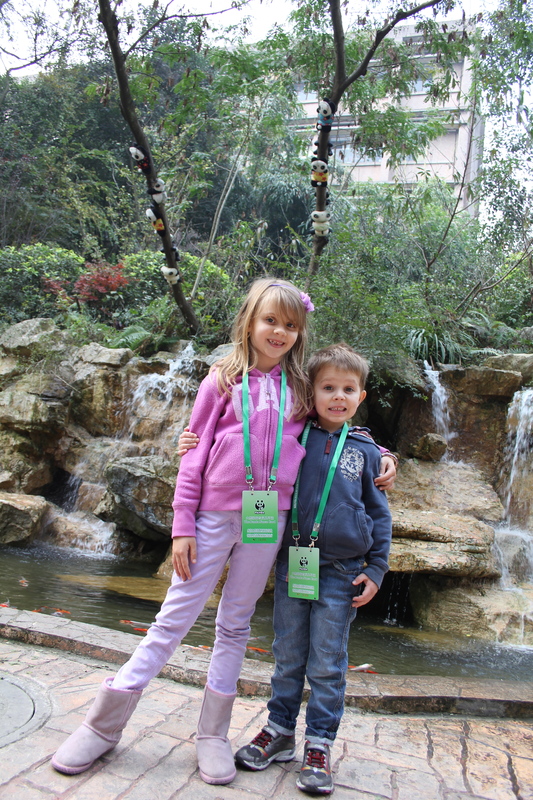 We arrived at lunchtime and went straight to our hotel – the Sheraton Chengdu Lido in the heart of downtown. We dumped our bags in our room and then solicited the help of the Concierge to organize a couple of things for us. Within minutes, Jack (a super helpful, very nice man) had arranged a car and driver for us; provided us with a map of the City, highlighted areas that we should visit and gave us his cell phone number in case we got into any difficulties! We ate lunch (buffet style) in the hotel and by the time we had finished, our driver and car were waiting to whisk us away for an afternoon of site seeing. 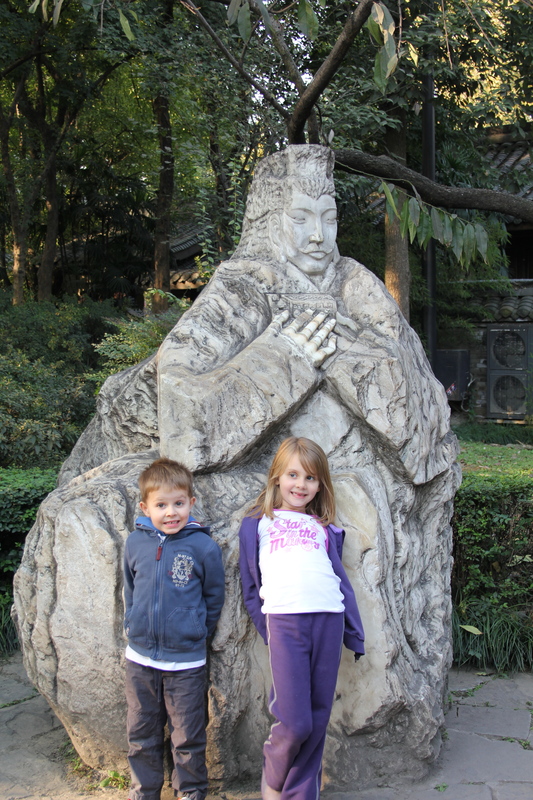 We started at the Wuhou Memorial Temple. Our driver took a photo of us outside the doors and told us where he would be waiting for us when we ready for the next stop. 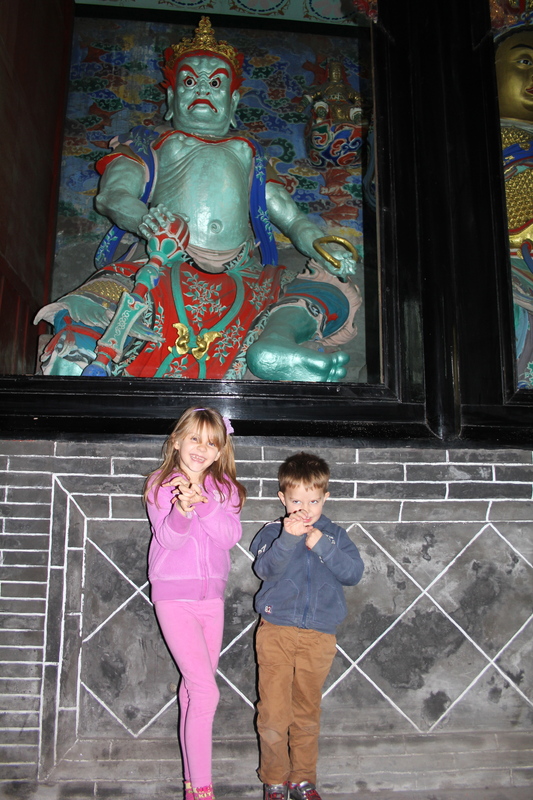 First Stop – Wuhou Memorial Temple. 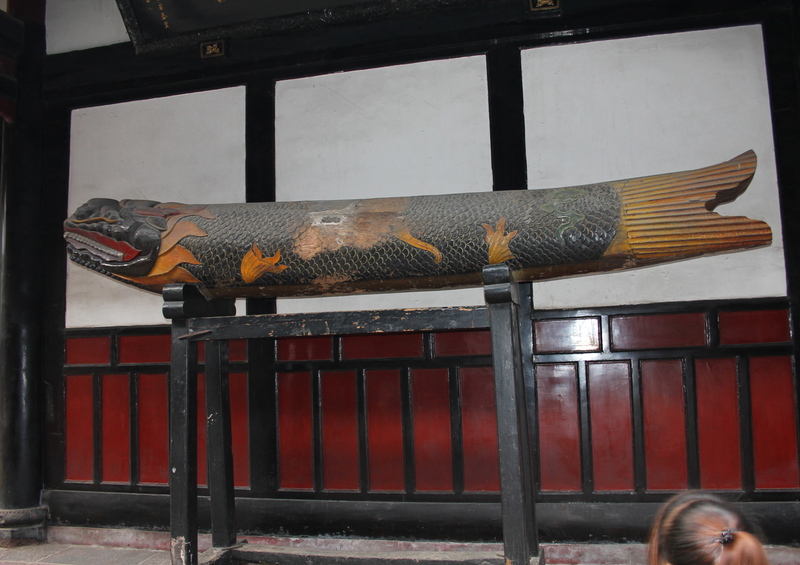 This memorial celebrates the Three Kingdoms period in Chinese history. 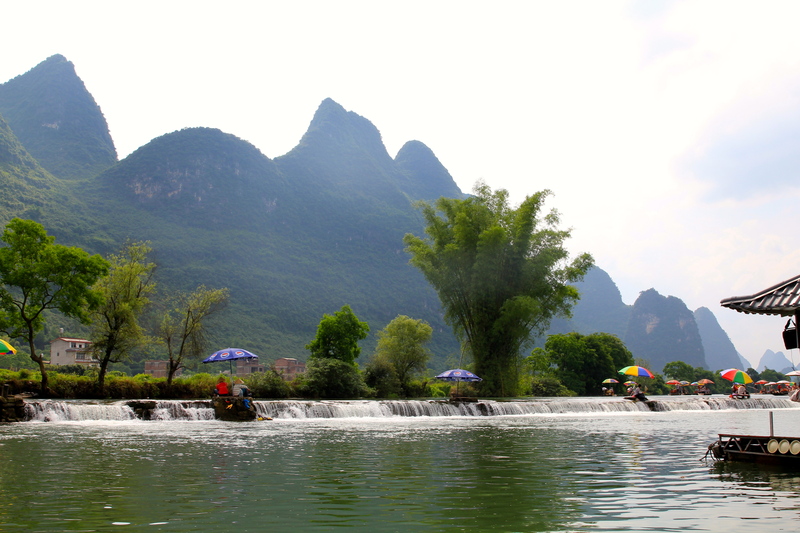 During that period, Sichuan belonged to the Kingdom of Shu, which was at almost constant battle with two other kingdoms for more than 100 years. 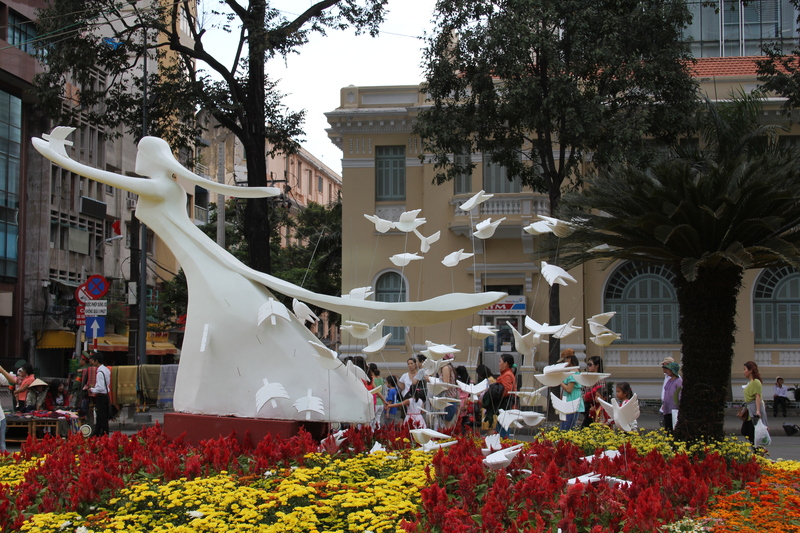 Wuhou Memorial is dedicated to the heroes of those battles. 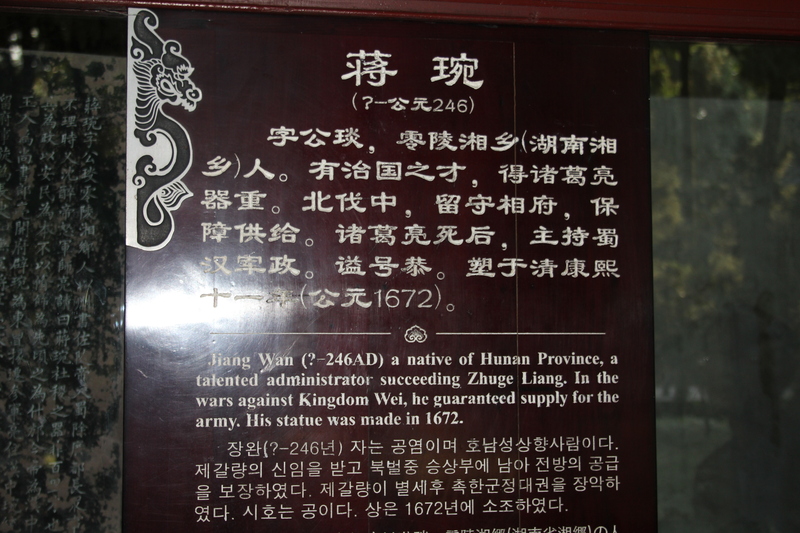 Zhuge Liang, the military advisor of the King of Shu, even 1800 years after his death, is still regarded as one of the most gifted and brilliant strategists China ever had. 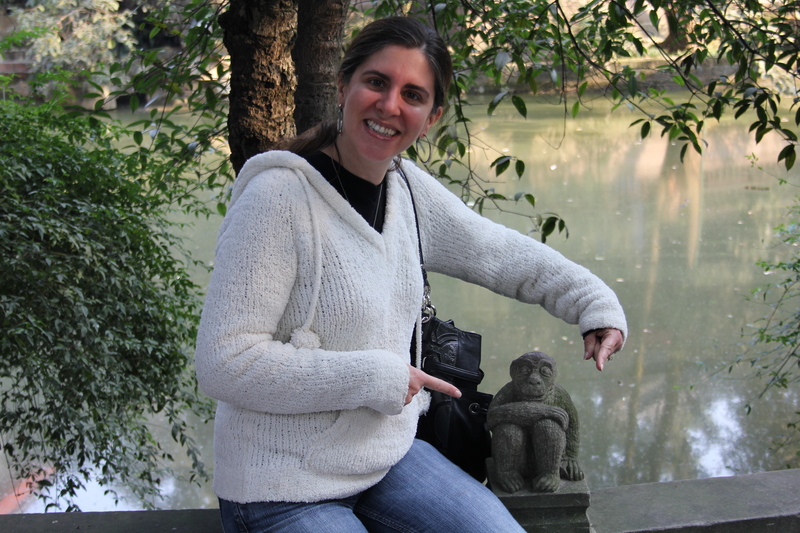 This temple has some larger than life statues, mainly dating back to the 17th century but some from the 14th century. 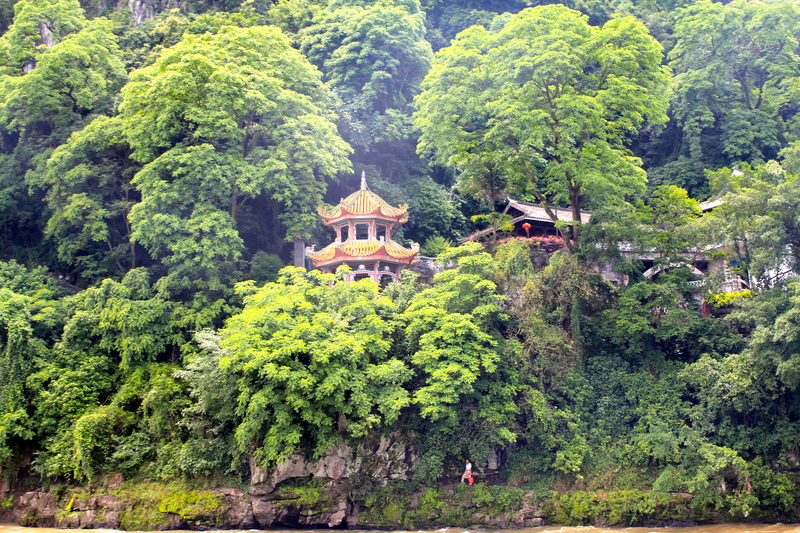 There is also the most magnificent bonsai tree garden hidden away in the middle – a lovely surprise! History of The Three Kingdoms and individuals. 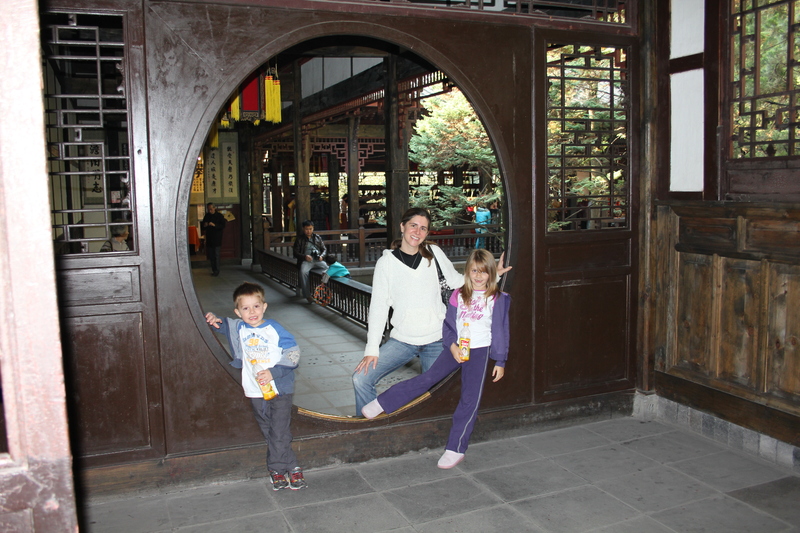 Beautifully carved wood – unusual doorways all over. Very cool architecture outside too! 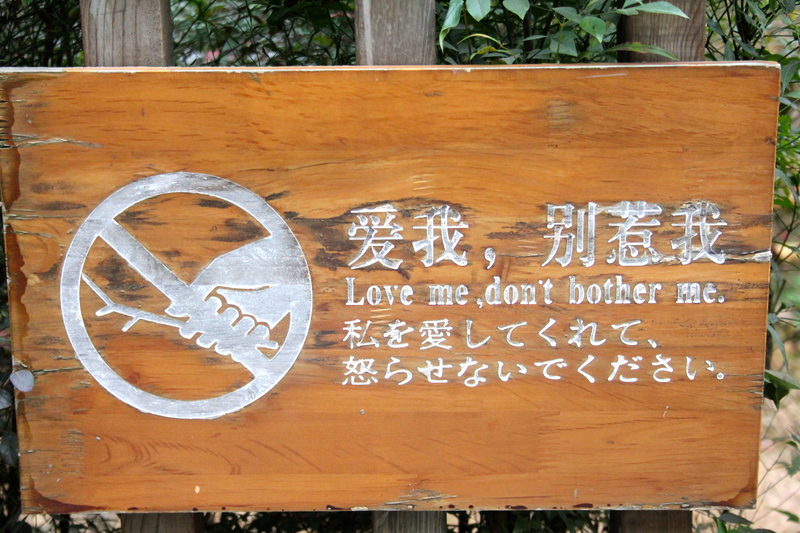 This passage led into the Bonsai tree garden that was not sign posted and so a delightful surprise to stumble upon. 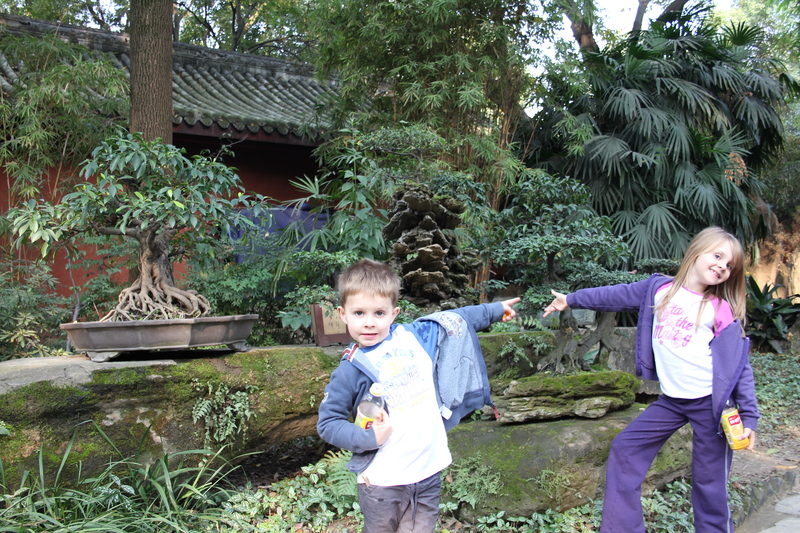 Pointing at the Bonsai Trees. This was a lovely garden with many varieties. 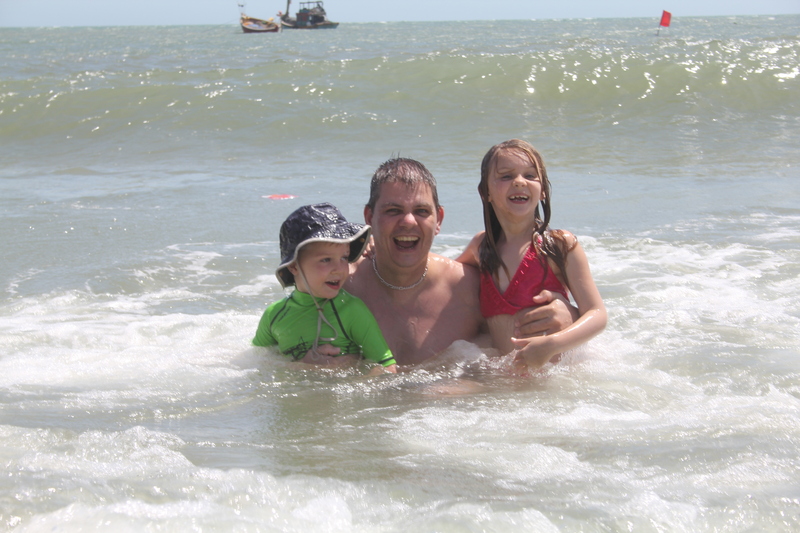 What you don’t see is that there at least 8 people behind me also taking photos of our children! 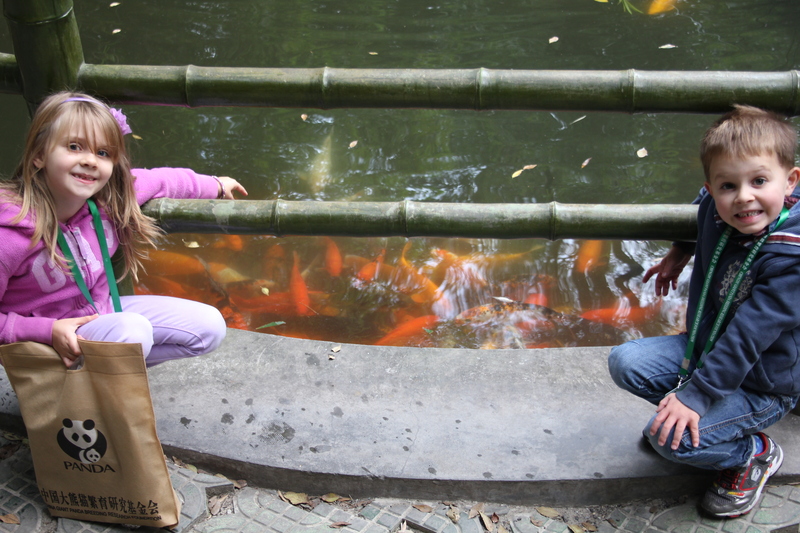 Owen with Oliver and Isabelle sitting by the Koi Carp pond. 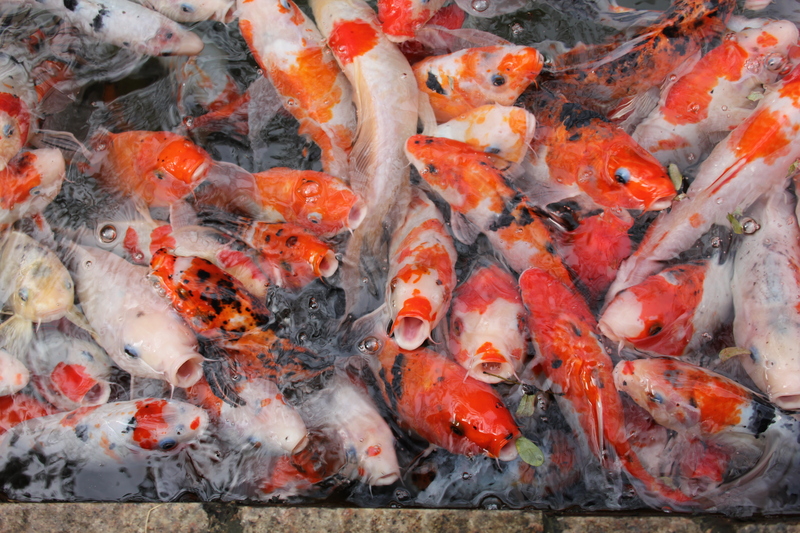 Once you leave the Bonsai garden, you are in more gardens with a lovely pond filled with lots of fish. 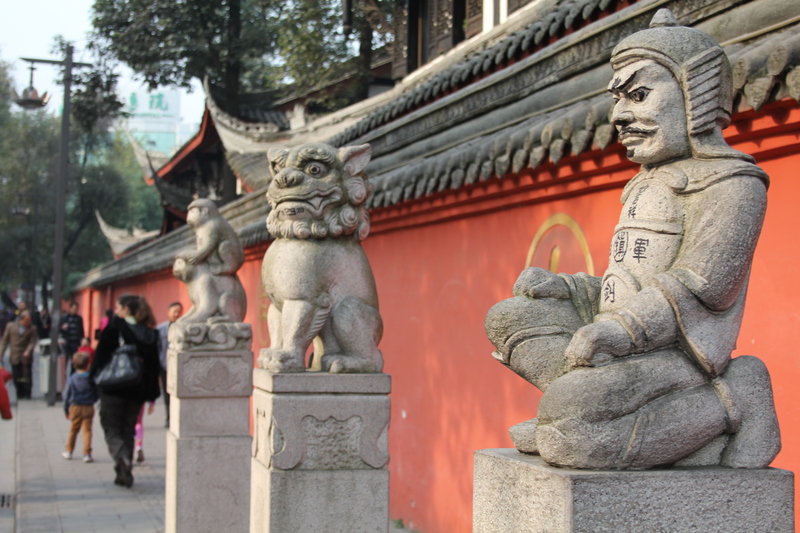 There are stone carvings of the key individuals during The Three Kingdoms period. Again, many people behind us taking photos of the children! 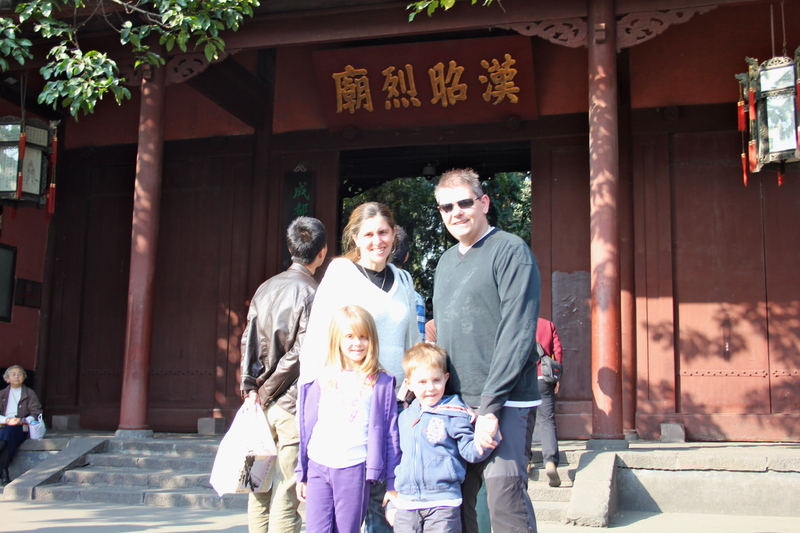 After a leisurely couple of hours walking around the lovely grounds of the Wuhou Memorial Temple, we walked into Jinli Street. 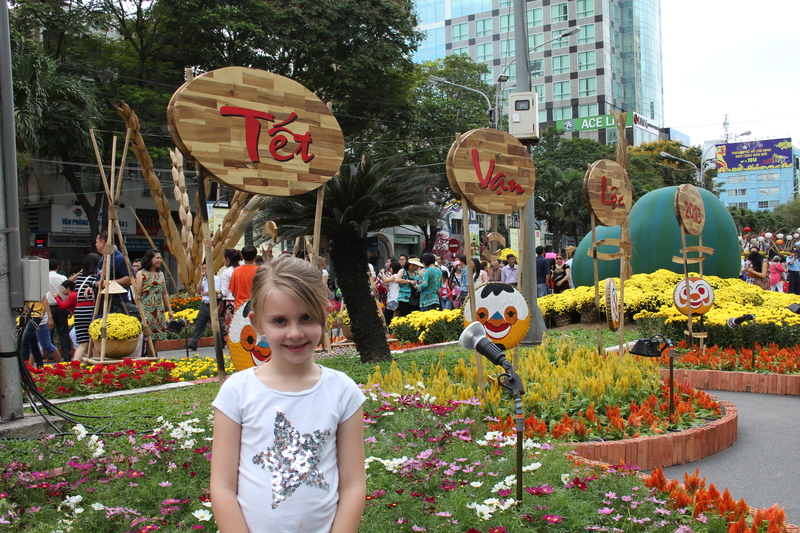 This is a big tourist area filled with many shops, cafes, street food vendors and souvenirs. We passed a stall with a man painting on the inside of glass bottles. The pictures were so detailed and beautifully done. Both Isabelle and Oliver came away with mini bottles with their names painted. We watched while he did it and was amazed at the skill to be able to do this! I bought a lovely pair of silver earrings in this shop. 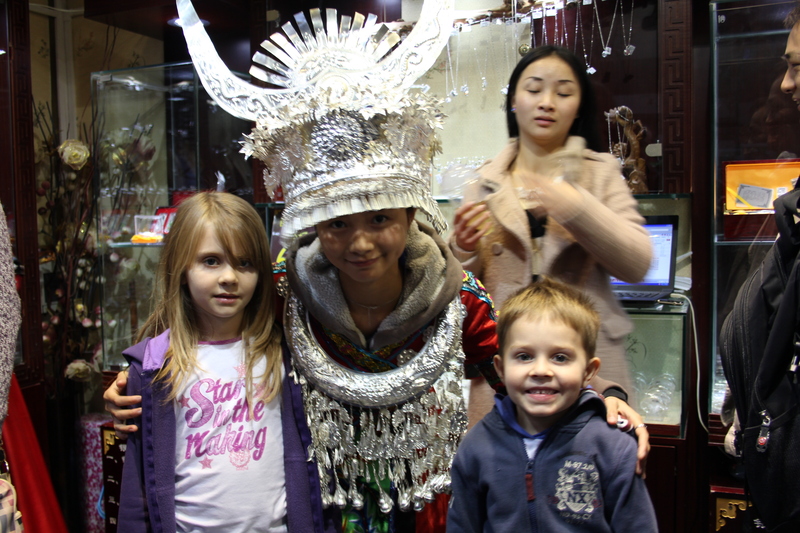 The lady was dressed in an old Chinese Princess Warrior costume and agreed to pose with the children! Her head gear looks really heavy! A lovely couple of hours spent shopping and site-seeing here. 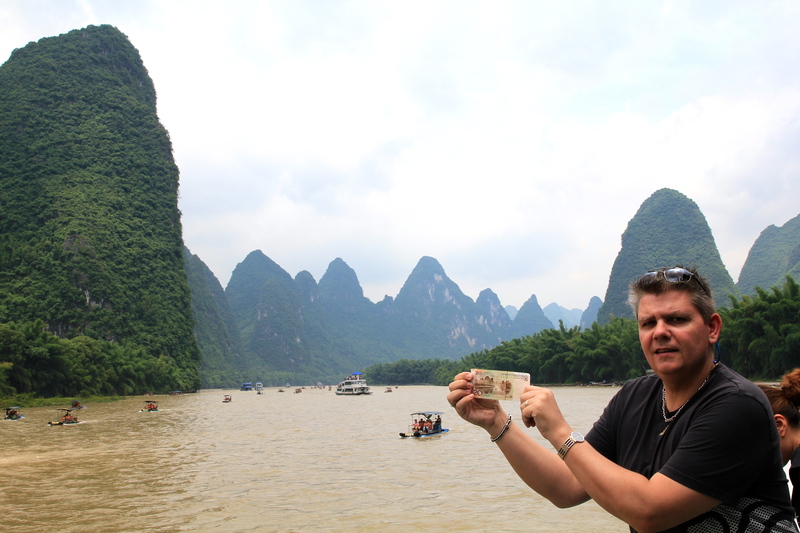 We headed back to the hotel after this as James (the fantastic concierge) had managed to get us front section tickets for the Chinese Opera. As we needed to be at the Theatre for 7:30pm we decided to eat at hotel again. Another buffet for the kids, who have completely won over the staff. 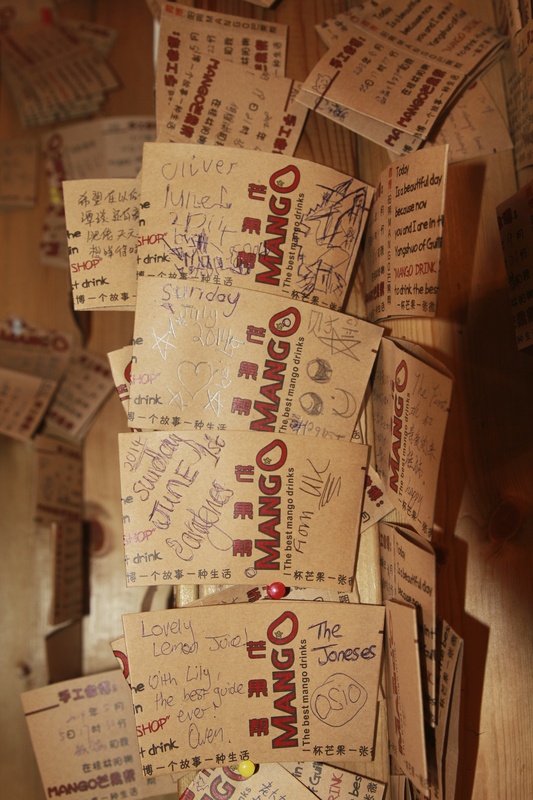 We, rather they, get so much attention – the Chinese want to know their names and ages. They were escorted around the food stations and assisted both of them with filling their plates! Owen and I sat back and watched!!! 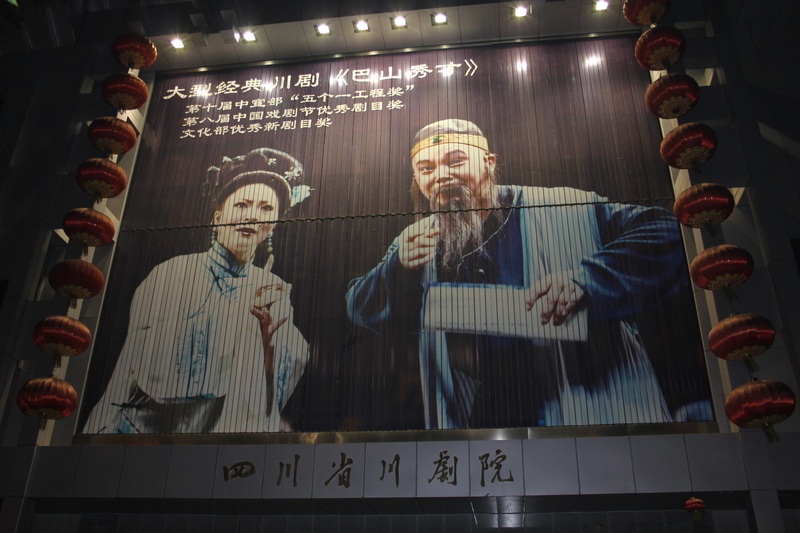 We were so excited to be going to the Chinese Opera as we had heard great things about this. There were 7 different acts in the 90 minute show, with the finale being the “Face Changing” display. First on was a dance depicting a love story where 3 heros fight against lvbu. Then the story continued with Lv Bu and Diao Chan. 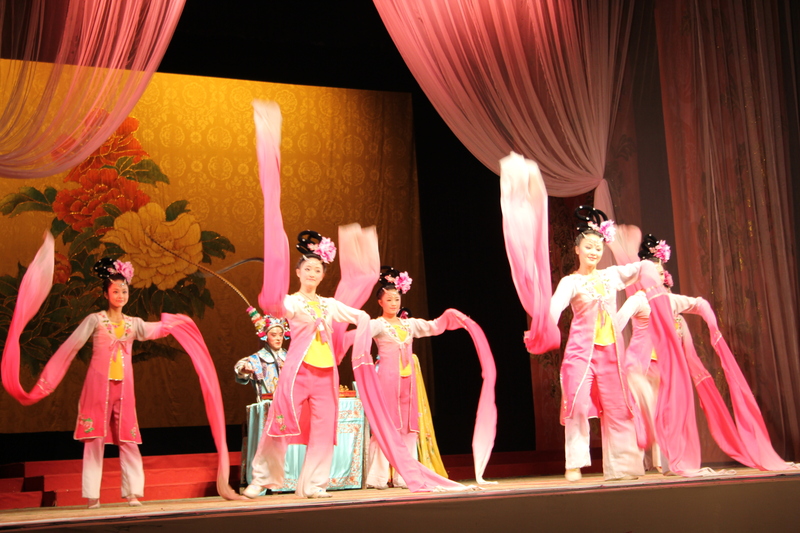 There was a stick puppet show, some acrobatics, a hand shadow show, Sichuan Opera song (not our favorite!) a man playing the Erhu and then the finale which was the face changing. The face changing was the most intriguing display as you could not see how it was done at all. It is a closely guarded secret and it is not known how they do it. The performers even came into the audience – 1 was 3 feet away from us and did 3 face changes. It was impossible to see how they did it – the effect is stunning. They also threw some masks into the audience. A gentleman behind us caught one and then gave it to Isabelle, who was thrilled! Oliver, meanwhile, was fast asleep. We could not keep him awake and he fell asleep half way through the performance. It had been such a busy day! 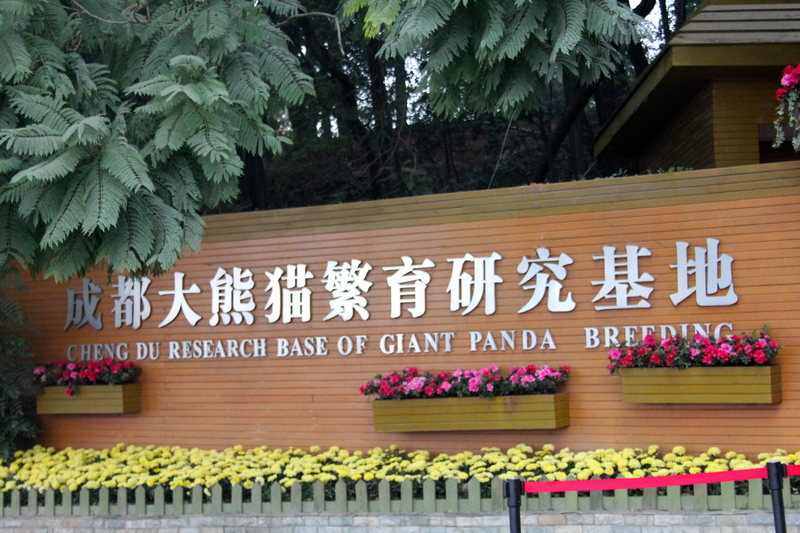 On Sunday morning, we got up early to go to the Panda Research Base. 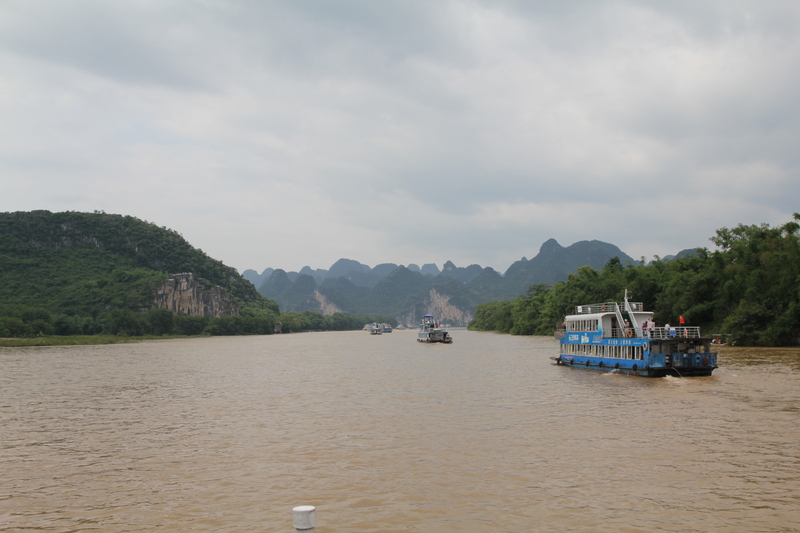 I have written a separate post on this trip. It was amazing! 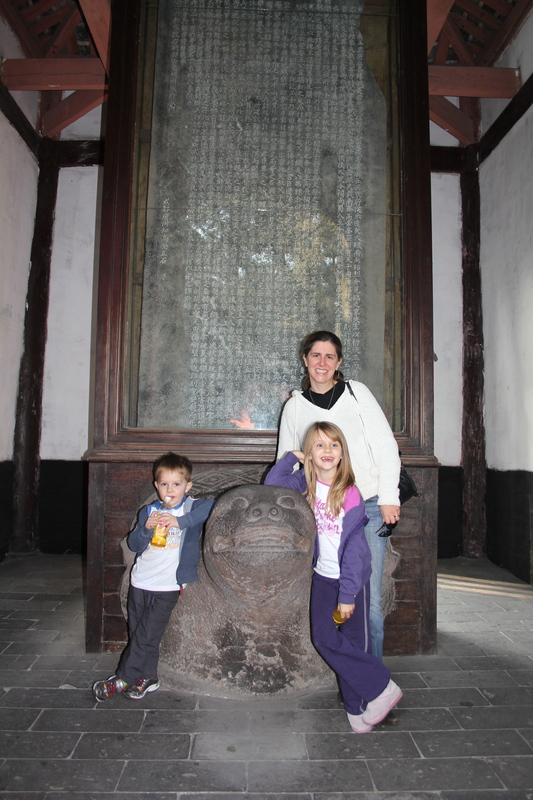 When we got back we went to the Wenshu Monastery. 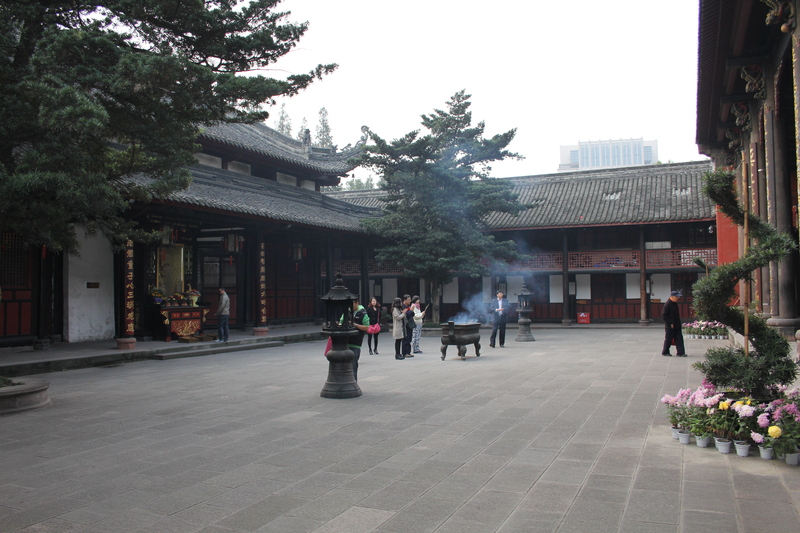 This buddhist monastery is one of the oldest and best preserved temples in Chengdu. 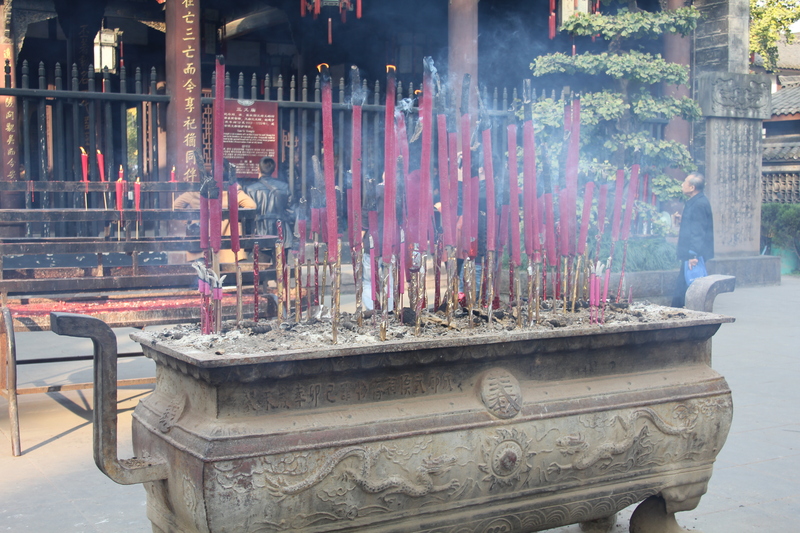 Worshippers light candles and incense, constantly filling the temple with a thick, perfumed smoke. 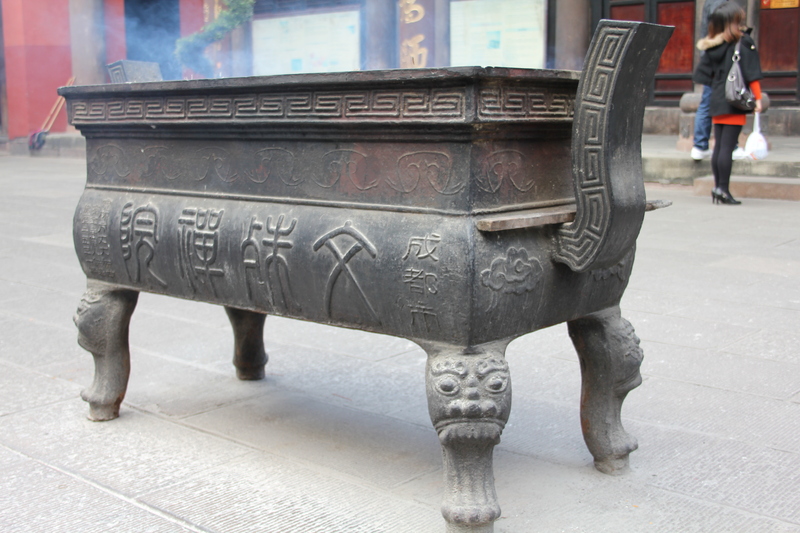 One of the many containers for burning incense. The perfume smoke filled the monastery. 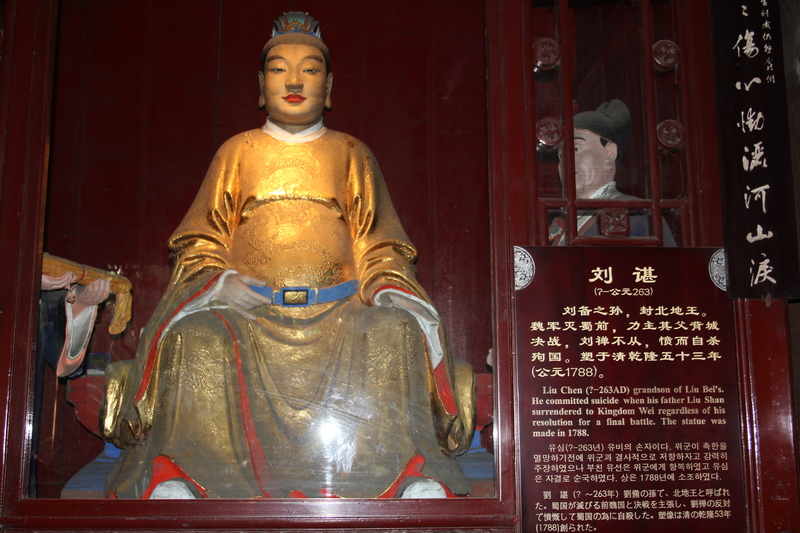 One of the many Buddha’s. 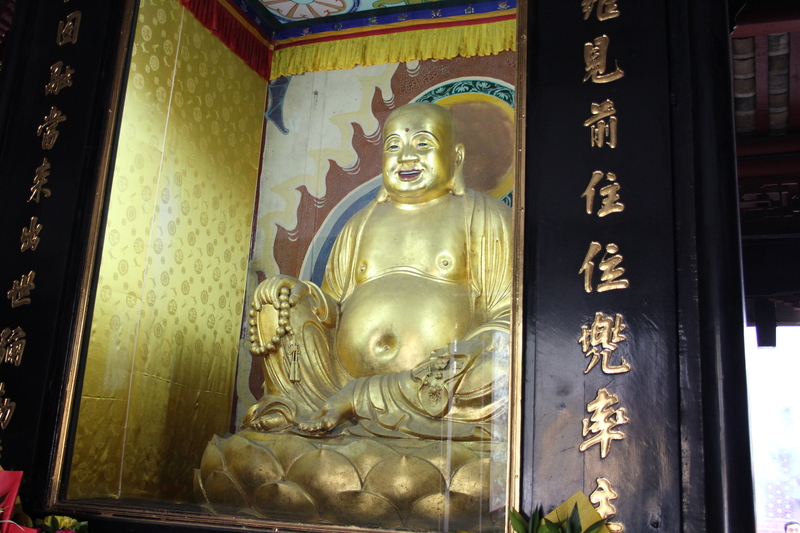 There are over 300 Buddha’s on display. I took this photo before noticing that photography was not allowed. 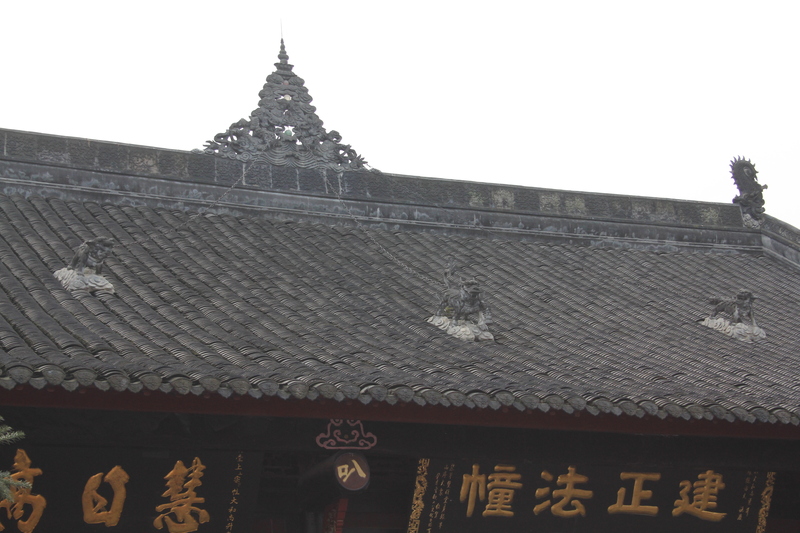 It is still an active Monastery and we saw many monks walking around. 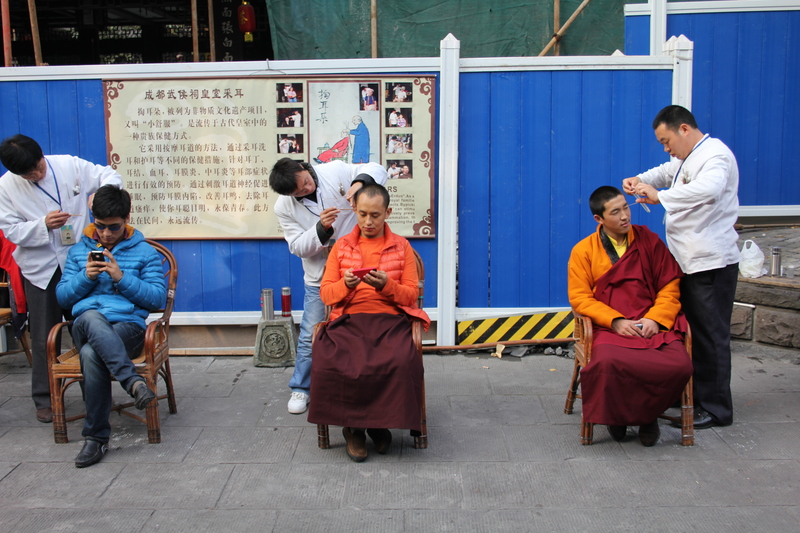 We saw many people praying and bringing offerings to the different Buddha’s. If you look closely, you can see the chains that are tying the animals down! The detail of the architecture is amazing. 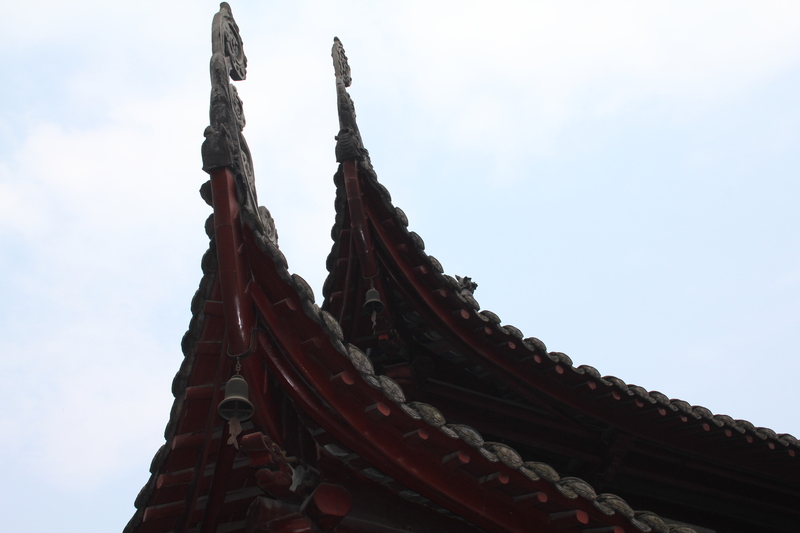 I love the curved roofs that you see in the older Chinese buildings. 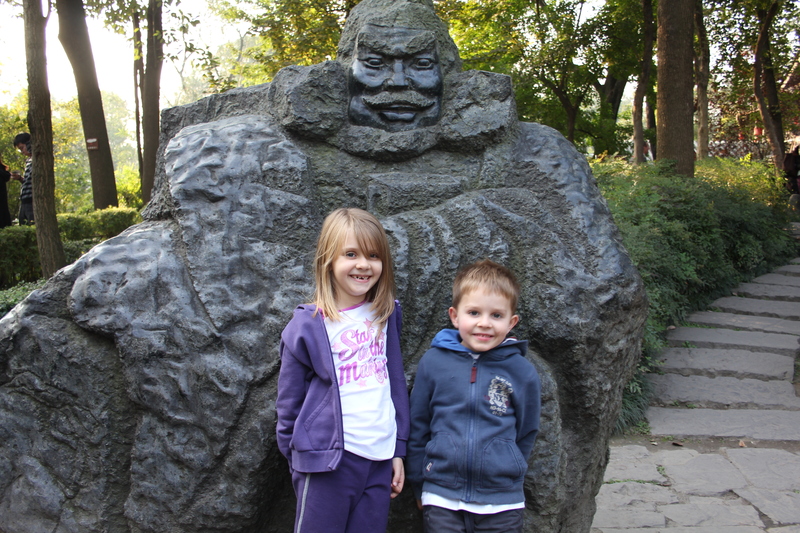 Another stop on our site-seeing tour today, was to the Ancient Town. 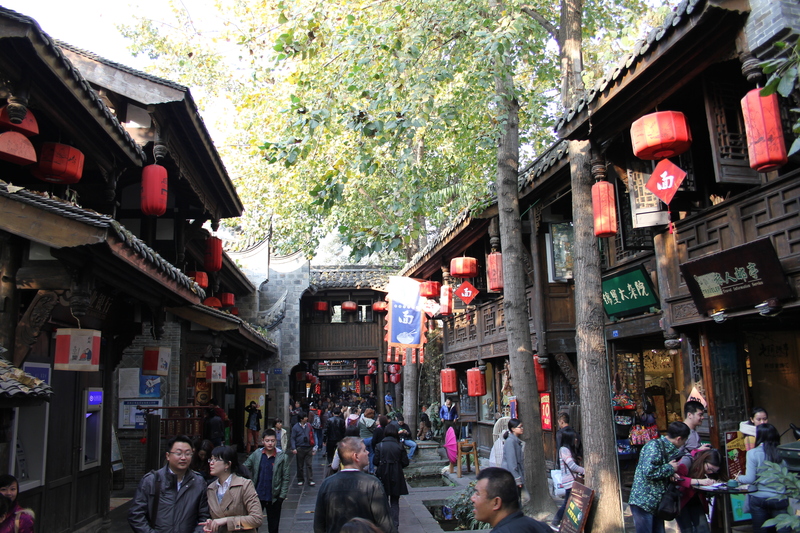 This is a walled area that has many alleys and narrow roads filled with shops, food, and souvenirs. We had just walked in when we saw this couple have wedding photos taken. Red is an extremely lucky colour in China, so brides are always married wearing a red dress! Starbucks is everywhere! We stopped here for coffee, hot chocolate and cake! 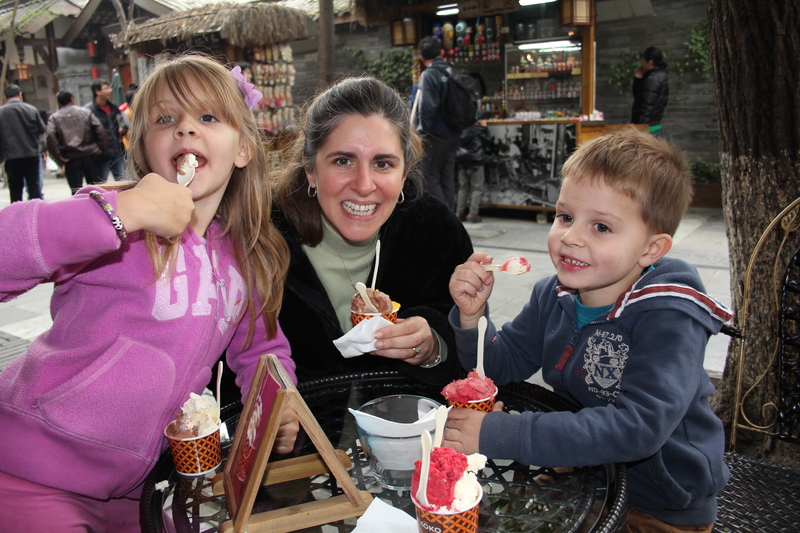 And we also stopped for ice cream! Sugar on a stick. There is a wheel that you spin and when the pointer lands on an image, the man will make the caramel (sugar thing) in front of your eyes in seconds. 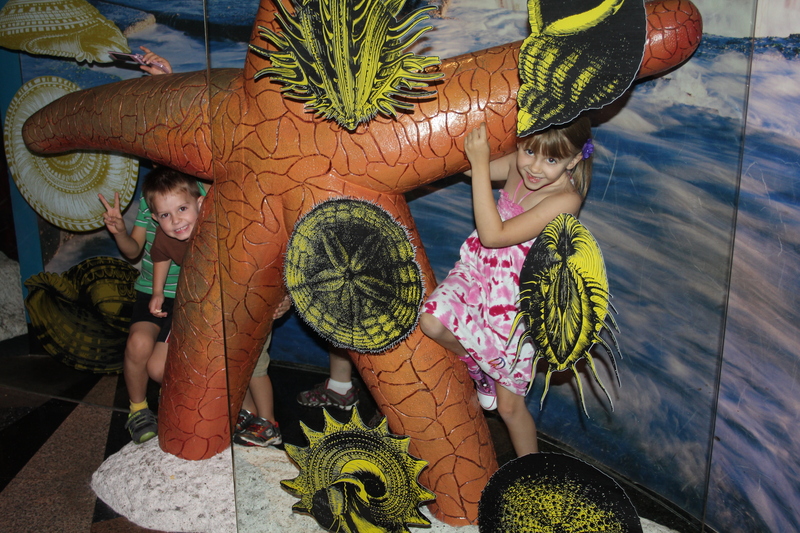 Of course, the kids loved this……. 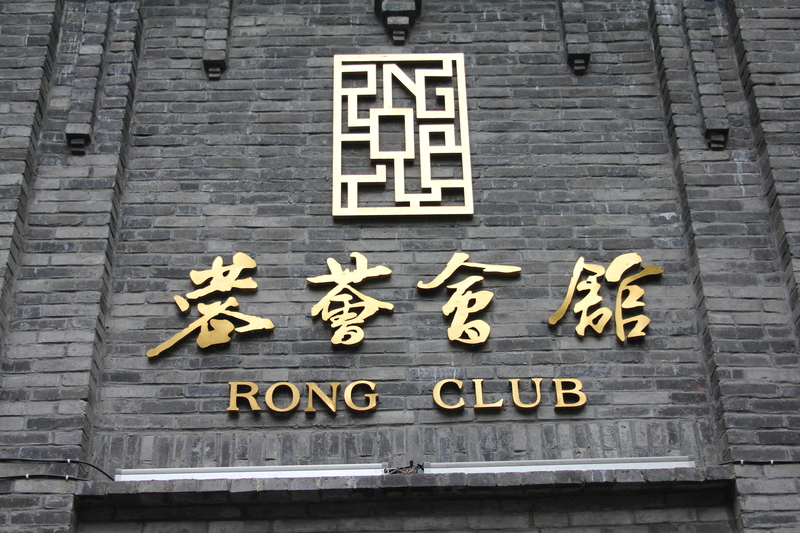 The Rong Club – just liked the sign!! 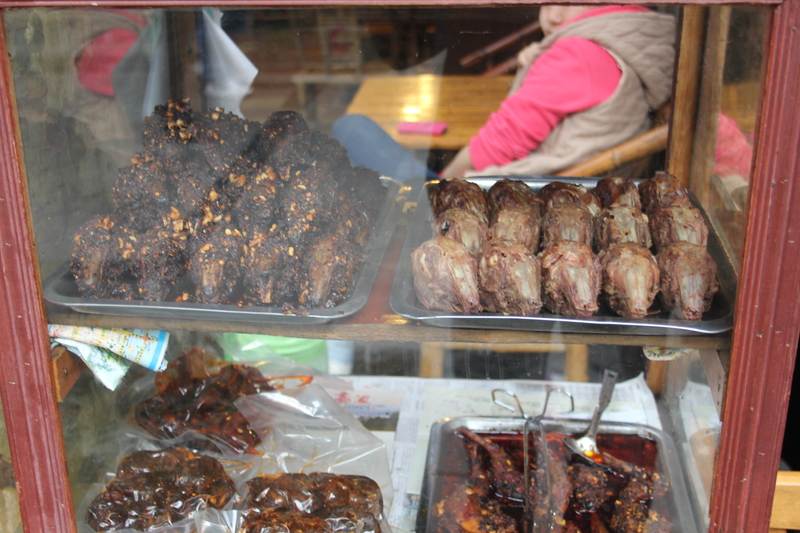 Rabbits head – a delicacy. (Top right) We did not try these. 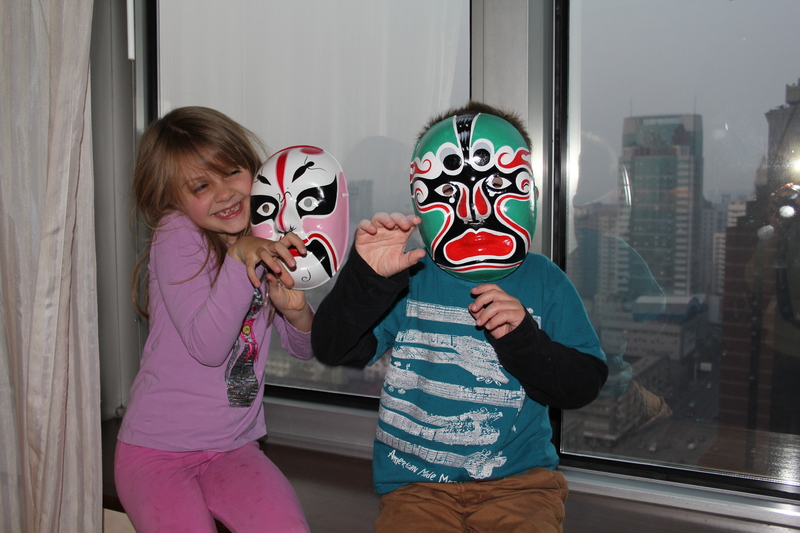 Back in our hotel room and the kids with their Face Changing Masks. Our Sunday night dinner was a recommendation from Jack (lovely concierge!) 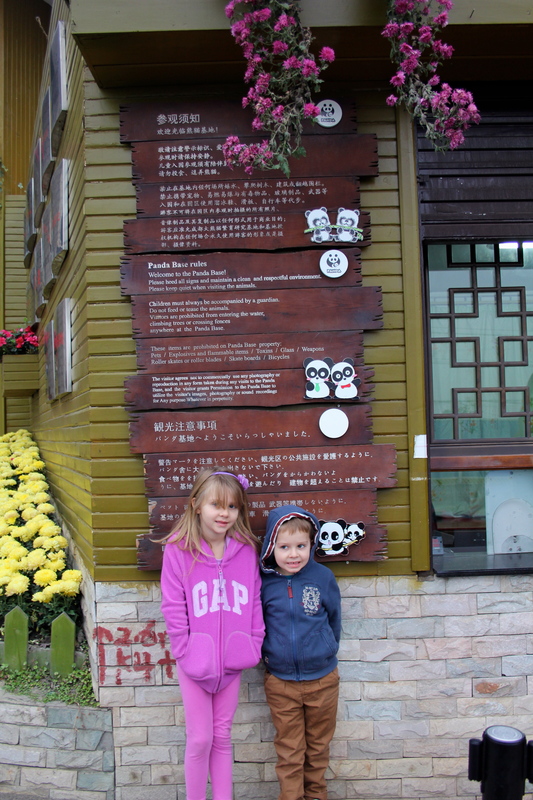 We walked a couple of blocks to a Sichuan restaurant. 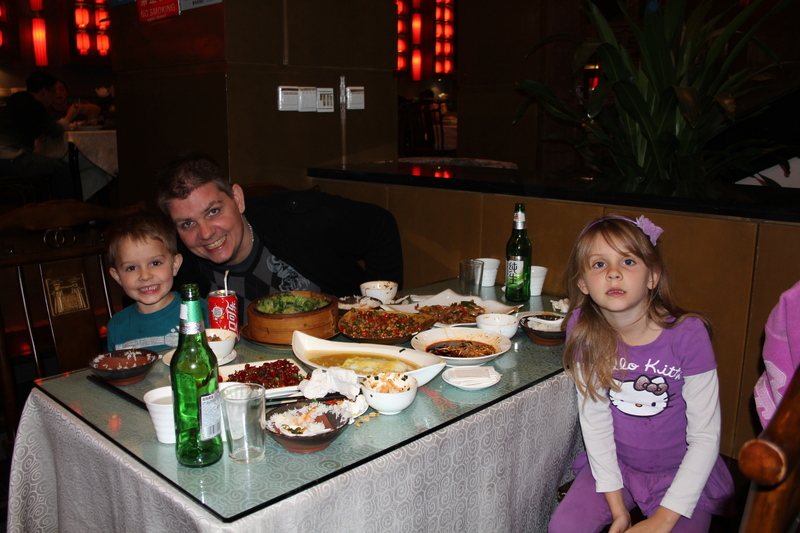 The cuisine in this area of China is spicy and Owen and I wanted to try some authentic food from here. Nobody spoke English in the restaurant, so between our iPhone apps and the pictures on the menu, we ordered several dishes to share. 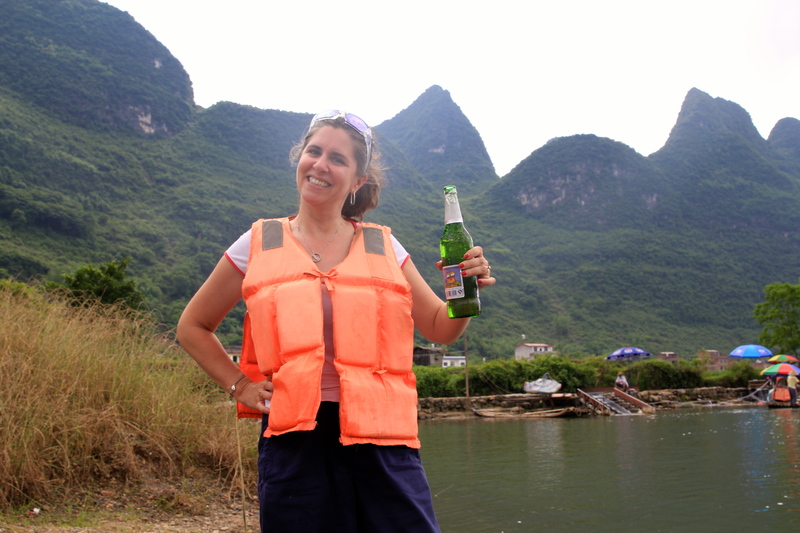 I made sure that we ordered plenty of Mifan (rice – one of the few words I know!!) so that Isabelle and Oliver would have something that was not spicy. As it turned out, a couple of the dishes were not too bad and they tried almost everything. 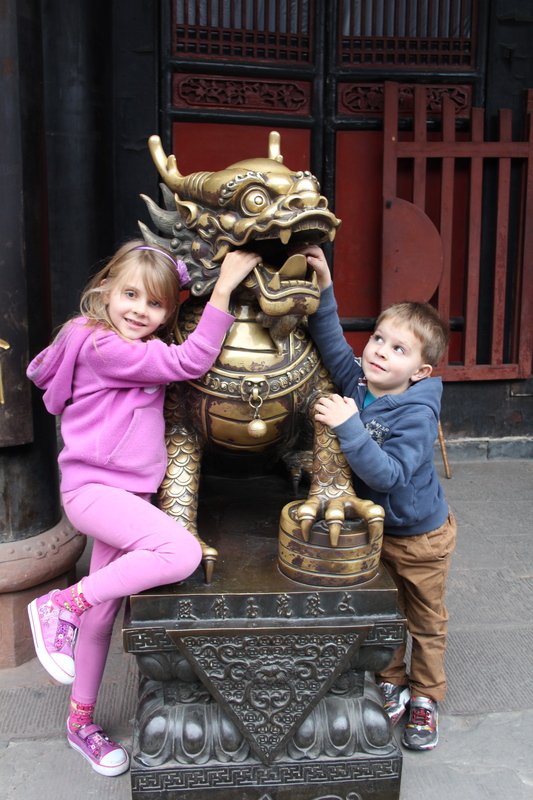 It was very funny watching them with the chopsticks – they have been practicing at home, but they are difficult to use in little hands! It was a delicious meal. A table full of food, beer for Owen and I, and we had change out of £30. 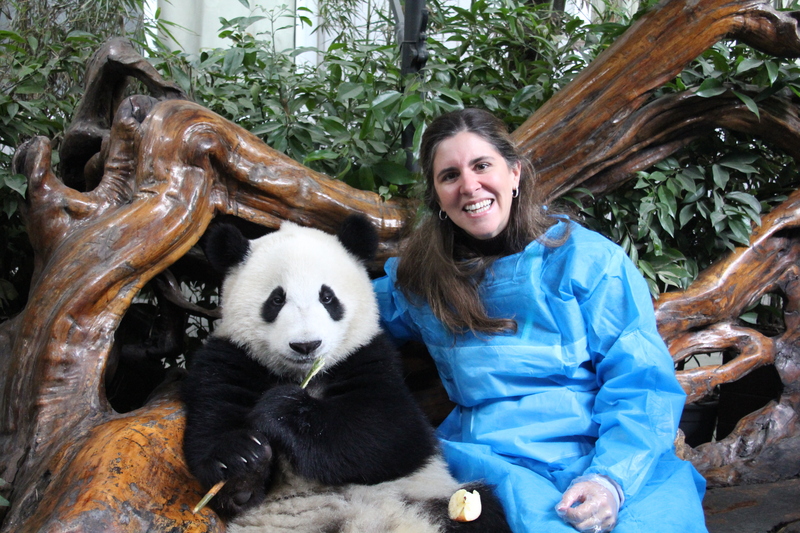 Another early start on Monday morning as we were back to the Panda Research Facility to cuddle with a Panda Bear. 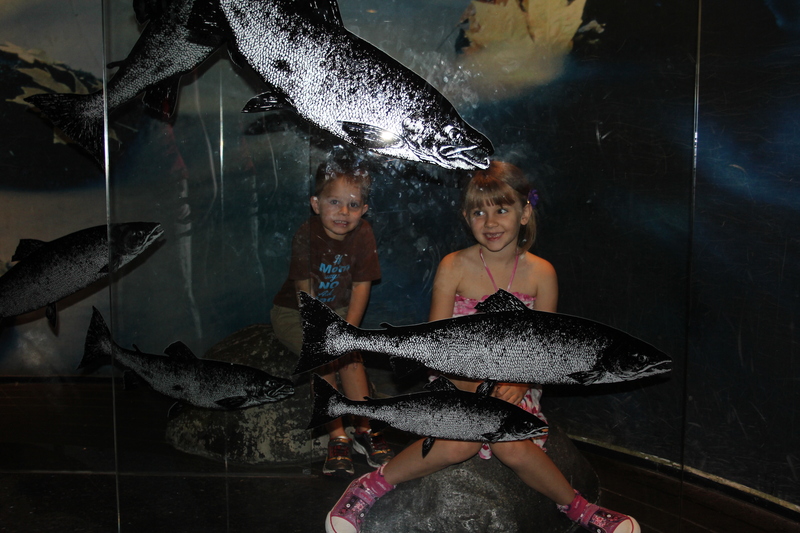 After we had experienced this fantastic interaction, we walked around the sanctuary again. 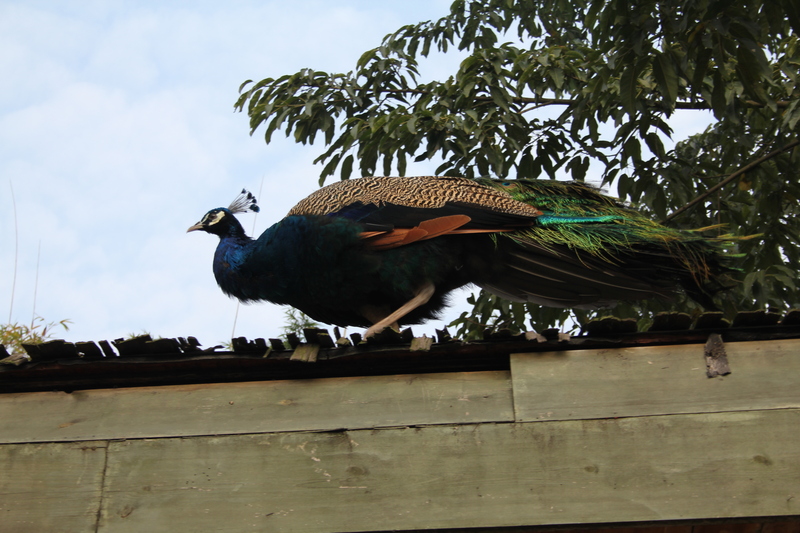 We spotted this Peacock on a roof. 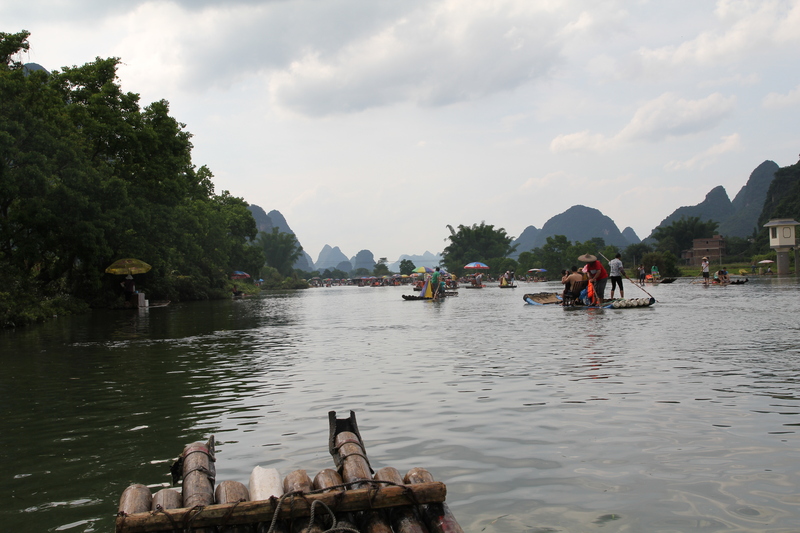 Big fish pond and loads of fish! These fish thought they would be getting fed! Brother/sister hugs! 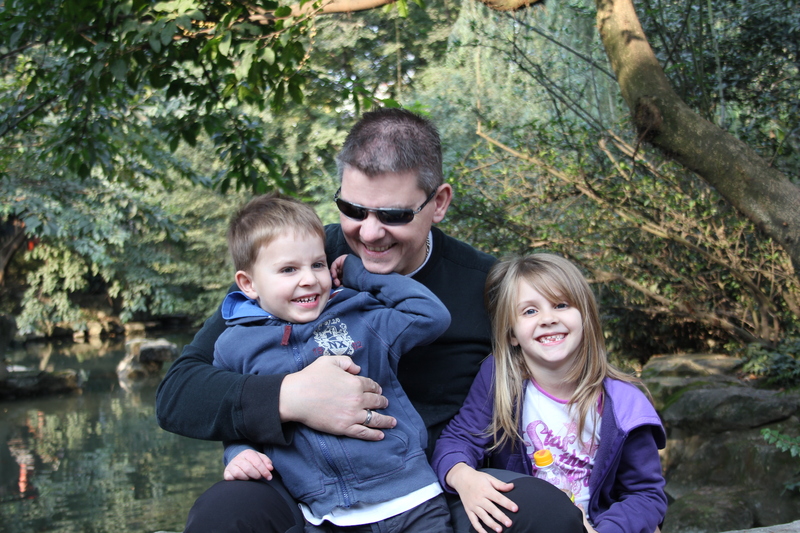 Notice the panda bears in the trees behind them. 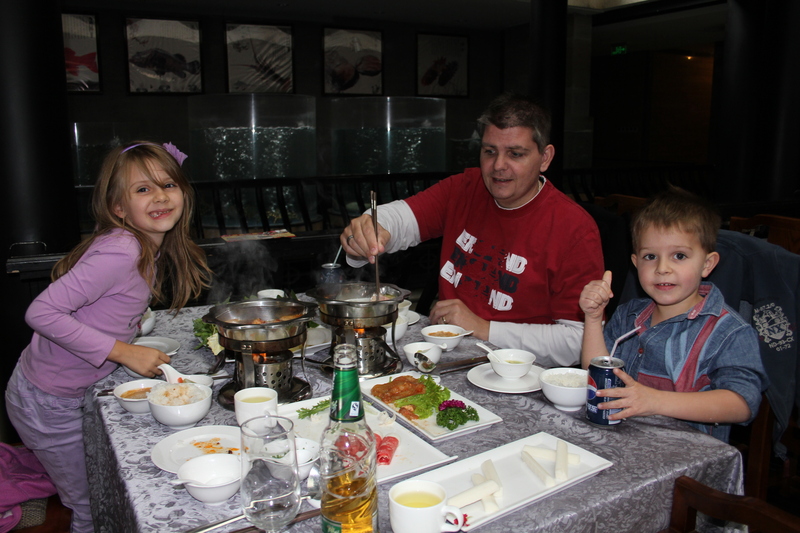 After the Panda Experience, we went to another restaurant recommendation for Hot Pot – another speciality of the Sichuan region. The Pots on the table had a spicy chilli oil side and a chicken broth side. This was ideal for us as Owen and I cooked all our food in the spicy side, while Isabelle and Oliver could enjoy the same meat and vegetables without the zing! This was another delicious meal. Finished lunch, off to the airport and home we went! A fantastic weekend with so many memories to last a lifetime. 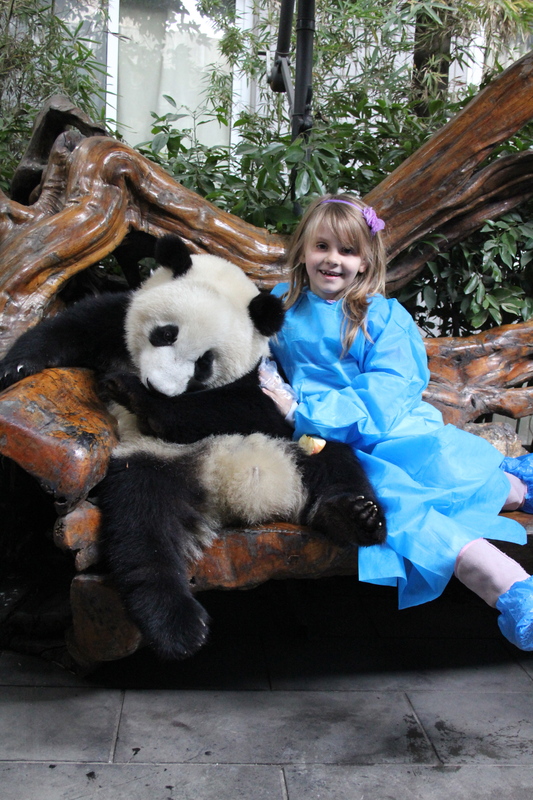 I will never forget the Panda that we cuddled with. The whole weekend was non-stop enjoyment. 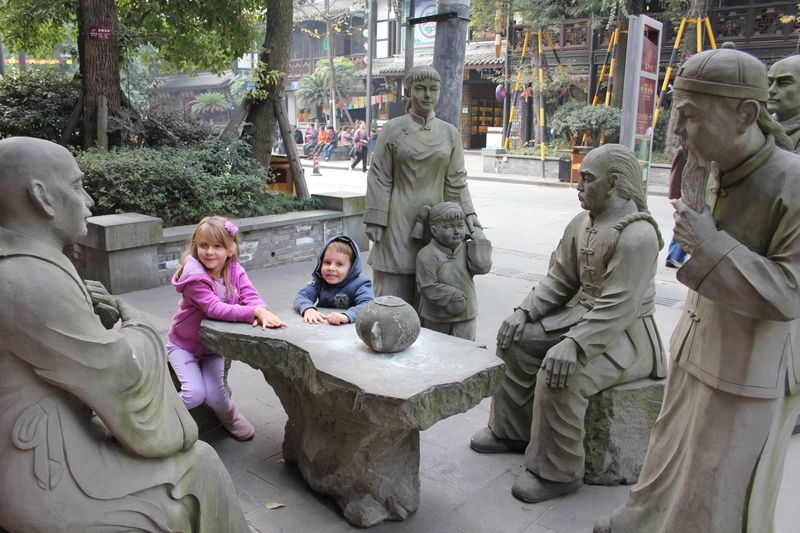 Stone sculptures in the street outside the restaurant. 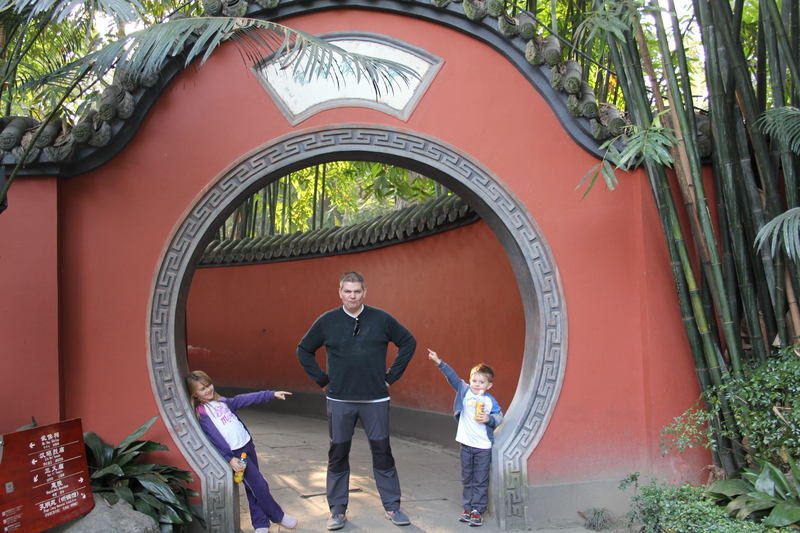 Chengdu is a fabulous City to visit. 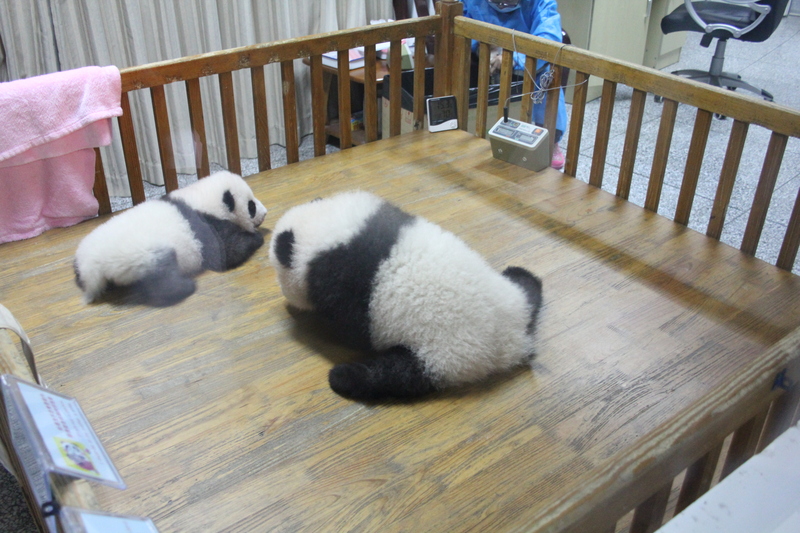 The Chengdu Research Base of Giant Panda Breeding facility is a fantastic place that has great success in breeding pandas – 7 have been born in the last 3 months alone. 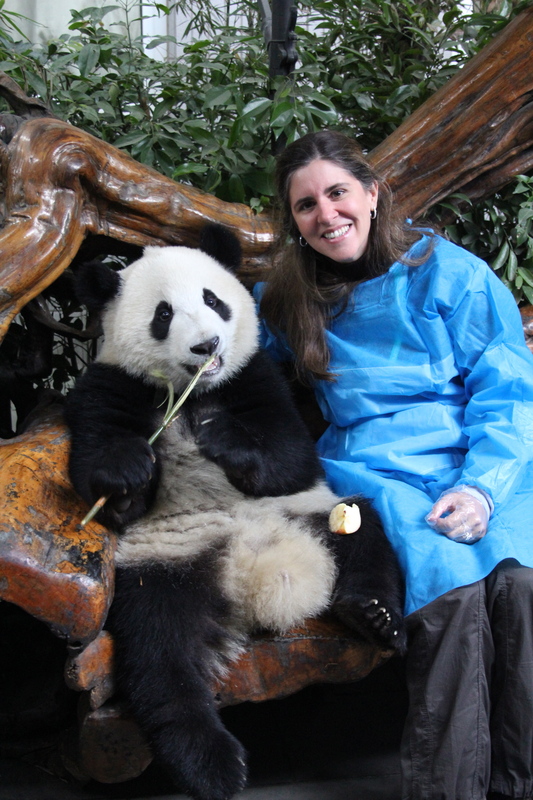 They also loan Giant Pandas to facilities around the world to help with the re-population of this magnificent animal, including a male/female pair to Zoo Atlanta (that has resulted in 3 successful births). 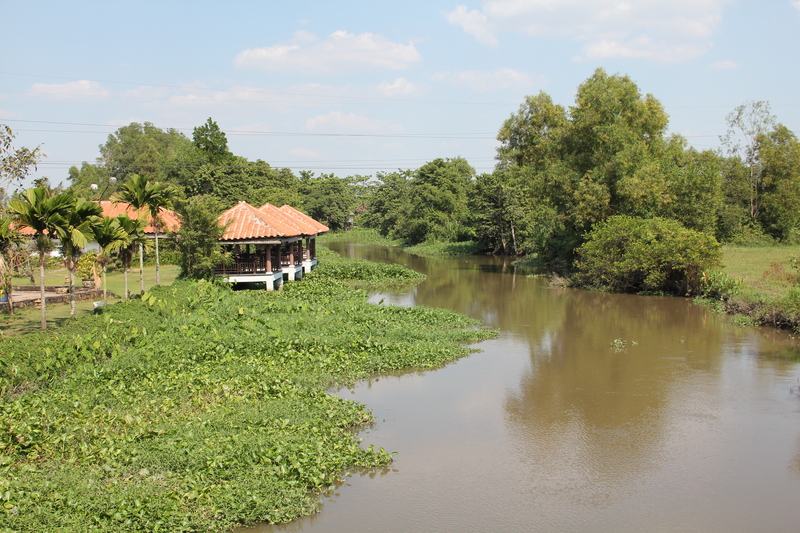 The park is set in over 1000 hectares with plenty of room to replicate the natural habitat. As someone who is generally against animals in captivity, I was pleasantly surprised at how well this environment is built and maintained. 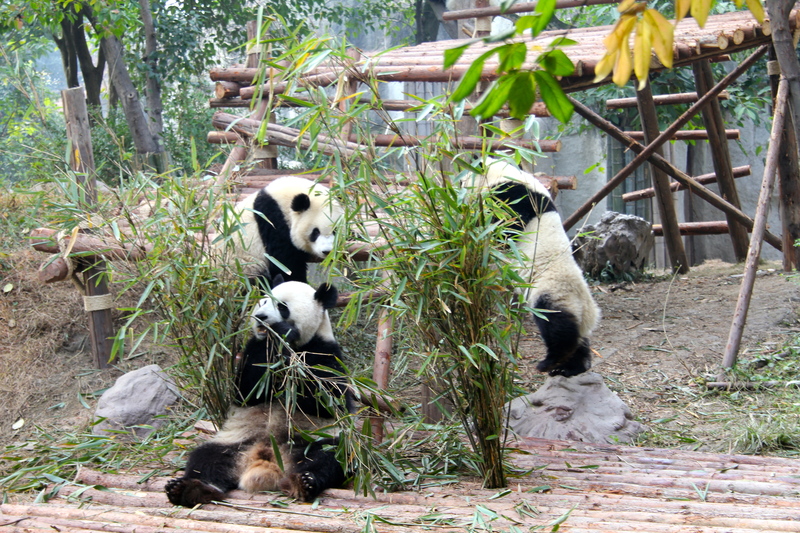 There are huge areas for each Panda and Panda family and we arrived early enough in the morning to see plenty of activity – they feed and actively play in the mornings when it is cooler. After doing some research, this is also the best time of year visit. 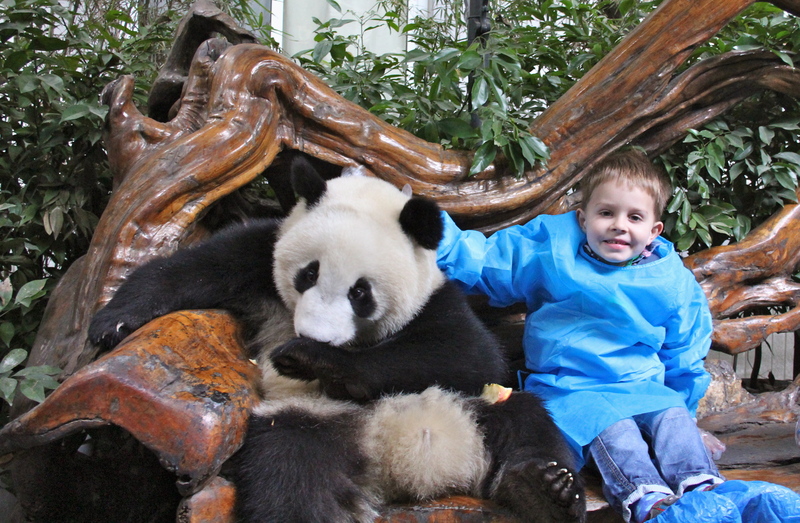 So excited for the day – lots and lots of Panda Bears to see! The Research Facility is huge and there are electric “trains” that take you to different areas of the park. 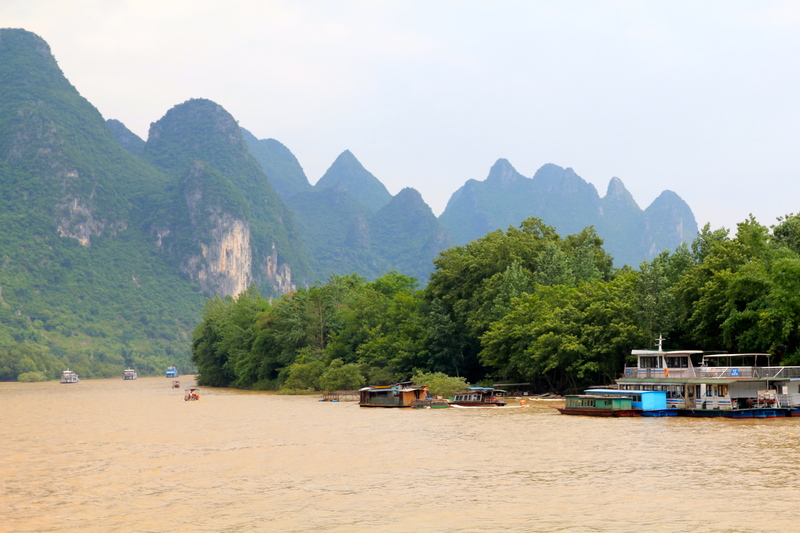 It is a very natural looking environment to help with the re-introduction into the wild. One of the pandas- Mei Lan, had special significance for us as we had seen her as a baby panda in Zoo Atlanta when she was the result of a successful breeding in 2006. 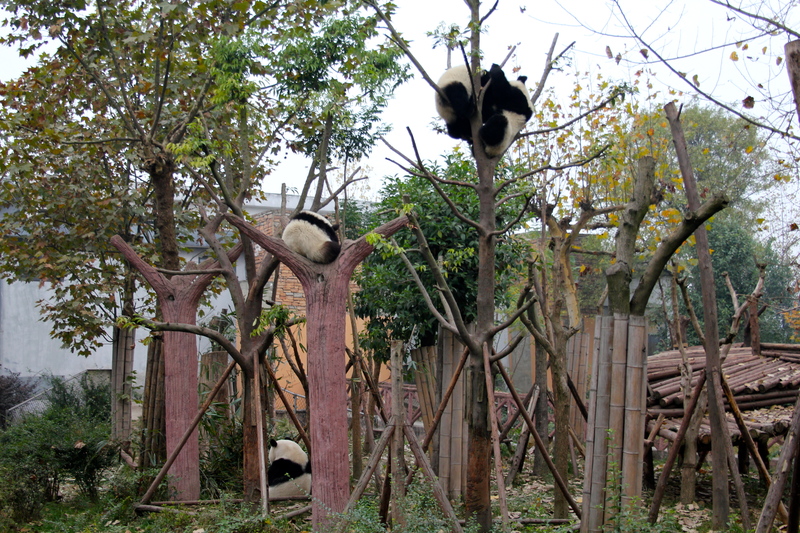 There are fewer than 1000 Panda’s in the world, so the breeding successes in Chengdu are critical to the Panda’s survival. 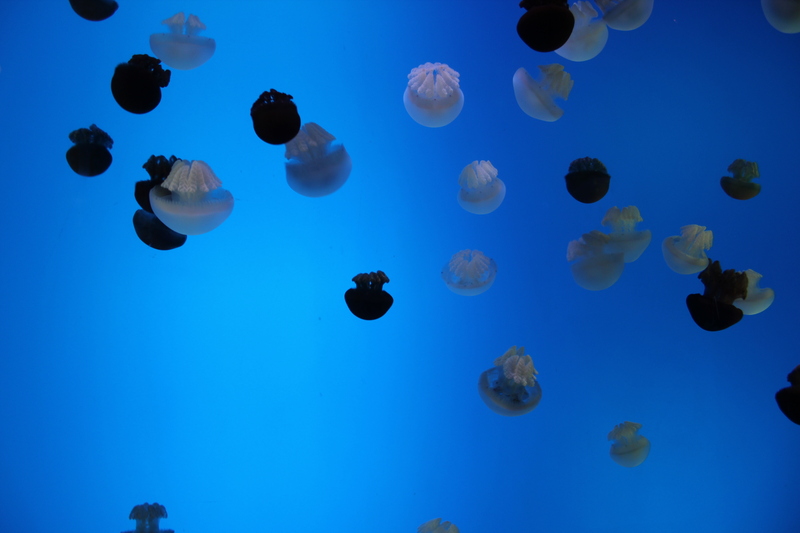 They simulate as natural environment as possible as the goal is to release them back into the wild. 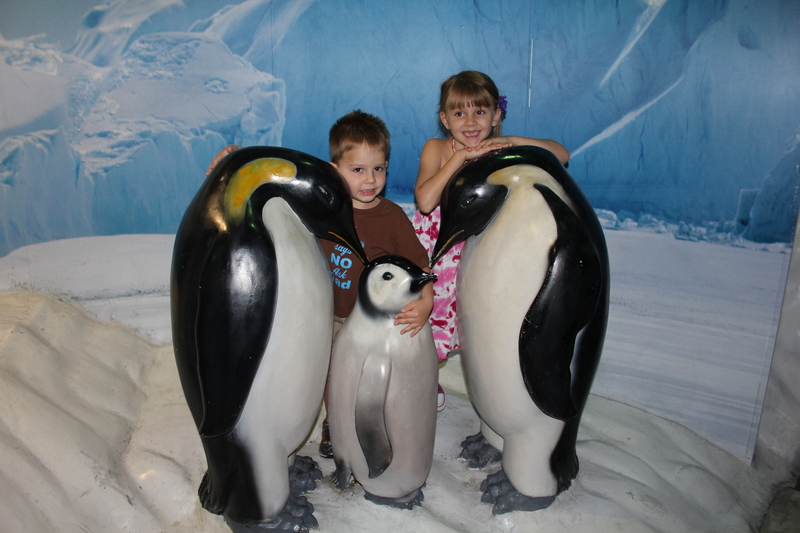 We walked around some of the areas and took some fabulous photos – they are such lovable animals. 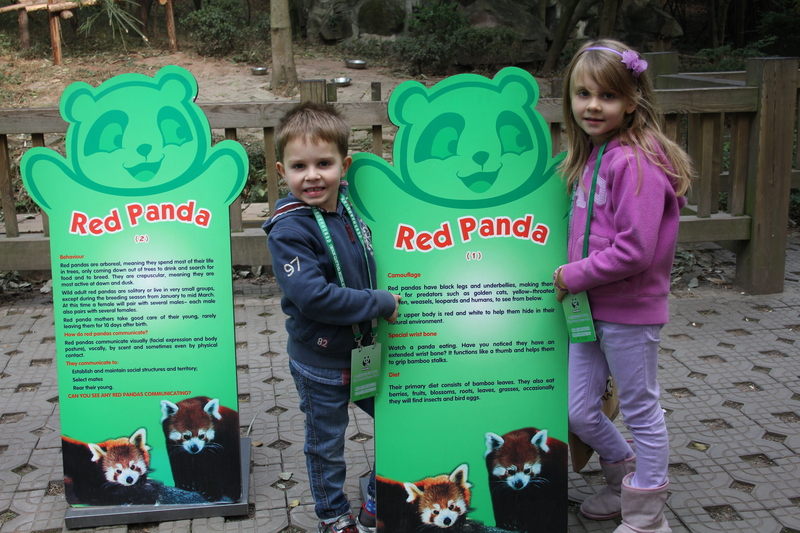 As well as giant pandas, this facility is also home to the Red Panda which actually looks more like a raccoon. Our first visit was on Sunday morning and we strolled around the different areas, took many photos and oohed and ahhed at the babies in the nursery! Very cute baby Panda Bears in the nursery. These 2 were born in September. 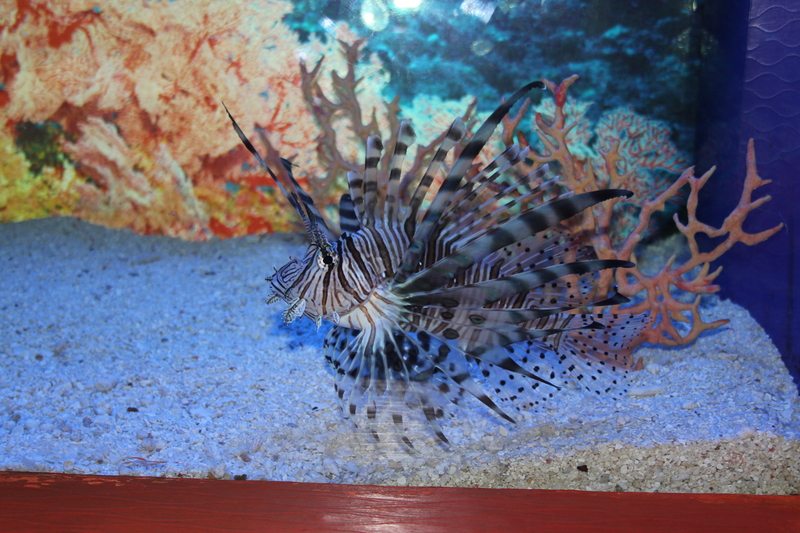 (Another 3 were born in August – we saw these in a separate nursery). 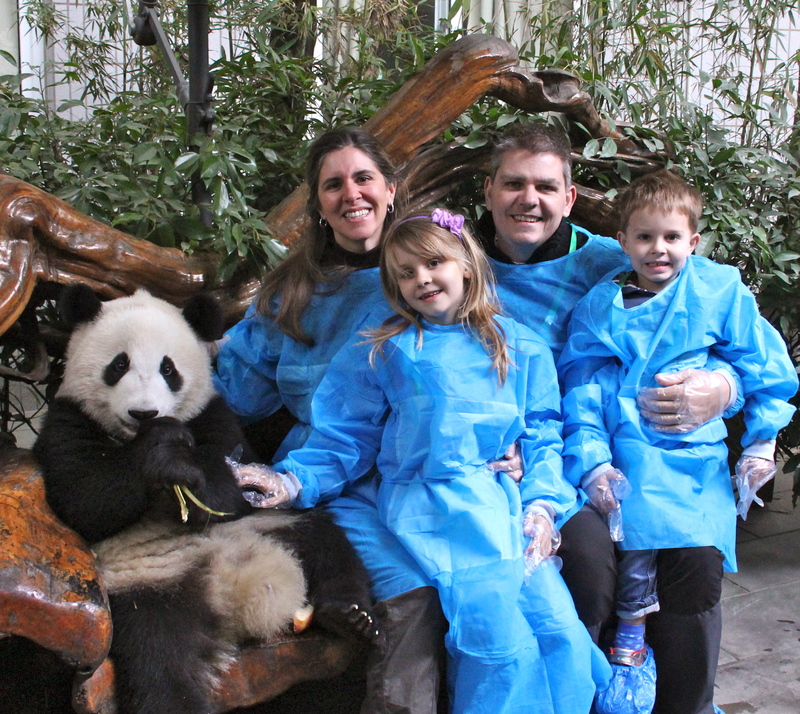 Unfortunately, the “Panda Experience” was not open so we made the decision to return the following day. 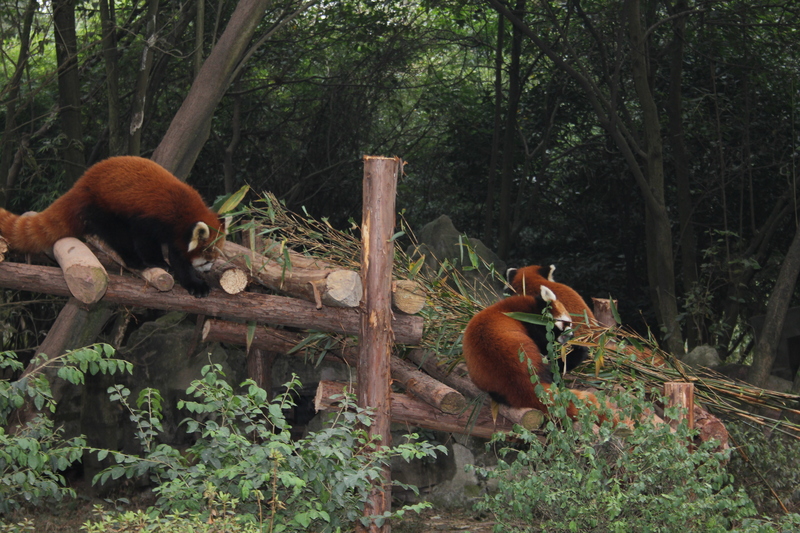 As well as Giant Panda’s we also saw many Red Pandas playing – all of the animals were very active! So playful, wonderful gentle giants. 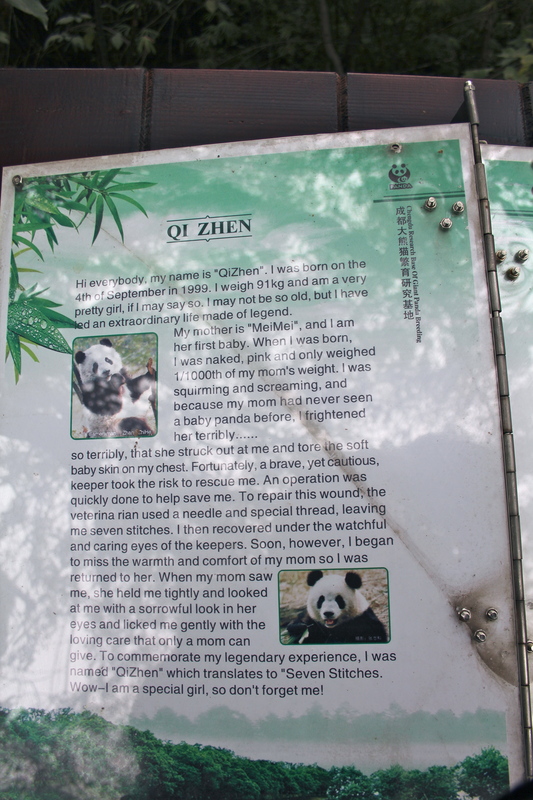 A lot of information about the Panda is given. It is so nice to read their story, learn where they get their names from and get a better understanding about these fantastic animals. 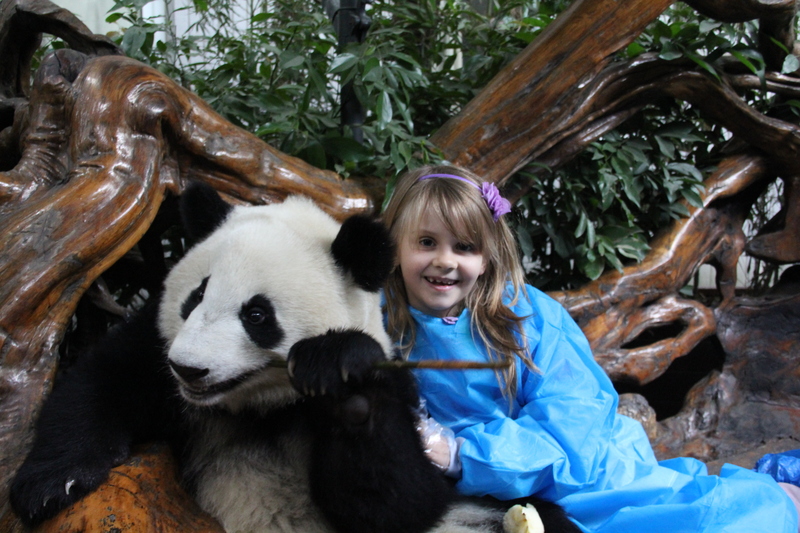 On Monday morning we went back to the Chengdu Panda Base for the “Panda experience”. 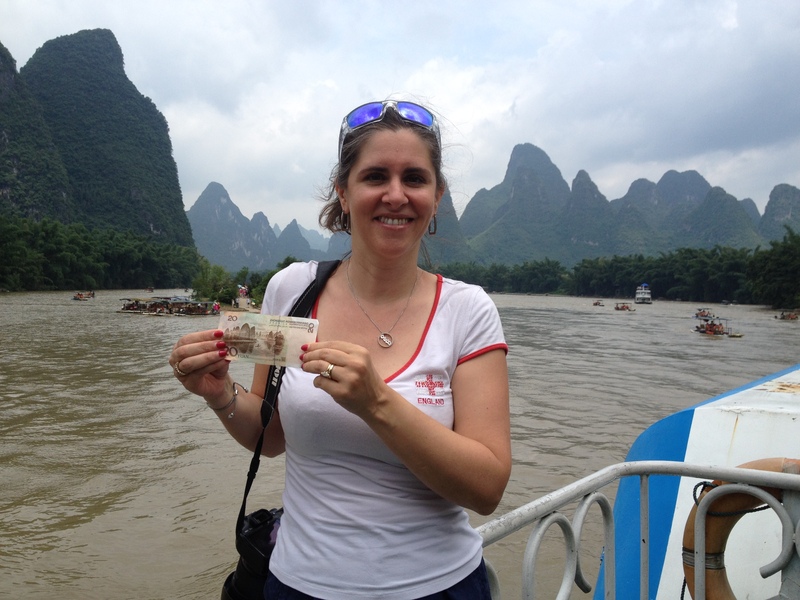 We arrived at the Sunshine nursery at 9:30 to be told to come back at 10:00 with a donation of 1300RMB per person to have an interaction experience – truly a once in a lifetime event. 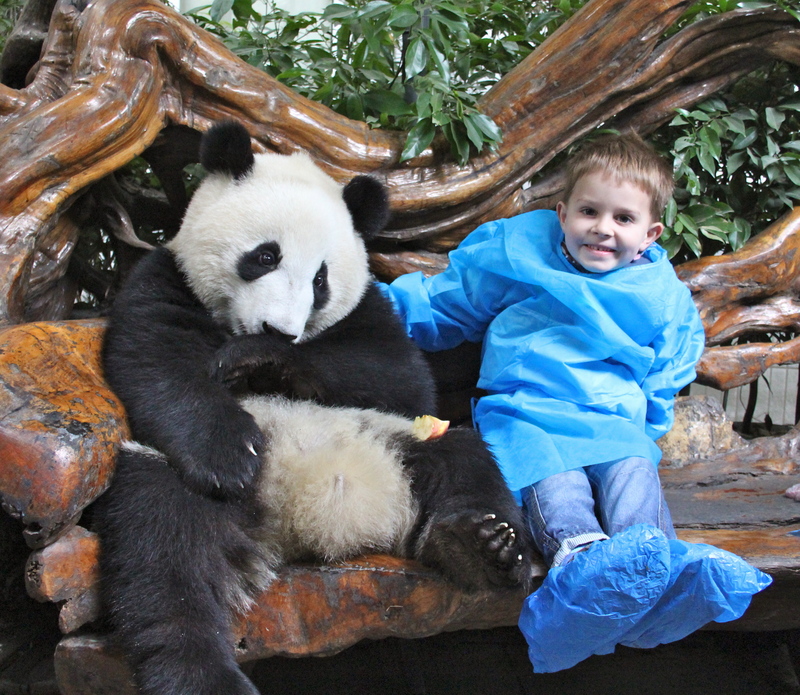 After we had paid, we watched a video of the Panda life cycle from birth to fully grown, saw pictures of Pandas from birth to adulthood and got an education on their diet (no meat for these bears) and then we were escorted into a back room. We were given blue surgical coveralls to put on, plastic covers for our shoes and plastic gloves. 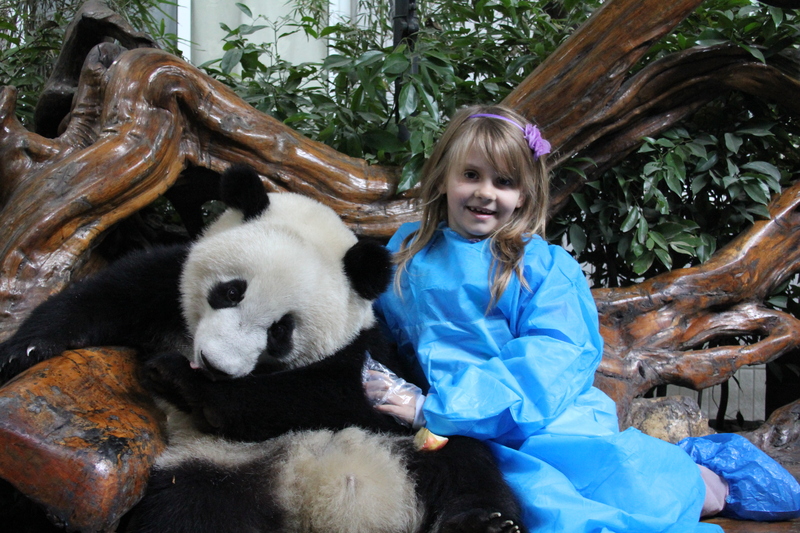 We gave our camera to the lady in charge and then they brought out the most gorgeous panda. 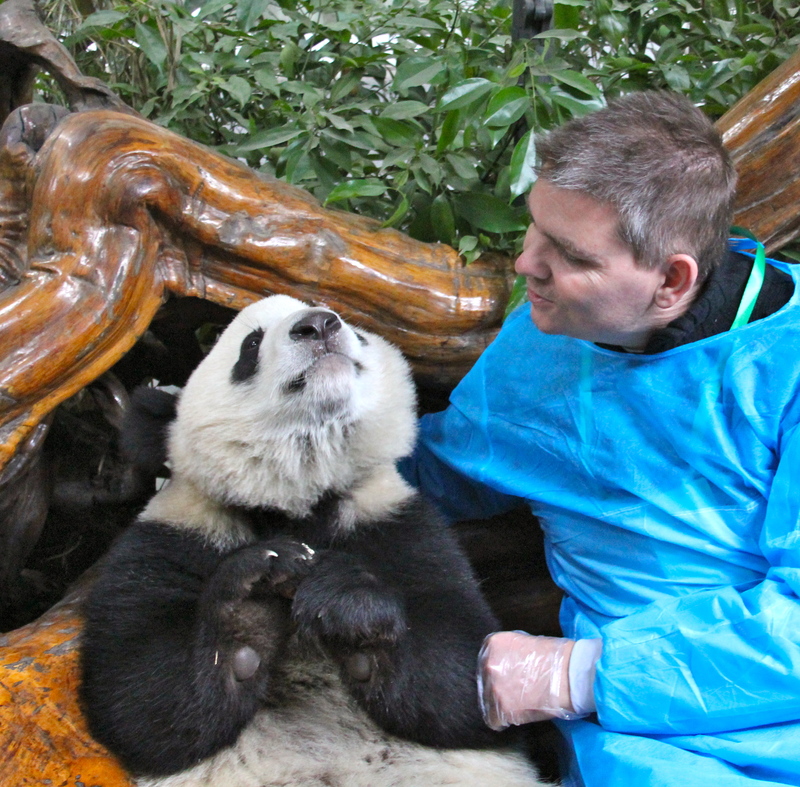 Her name was Zhen Zhen, and she is 1 year old, weighing 100lbs. 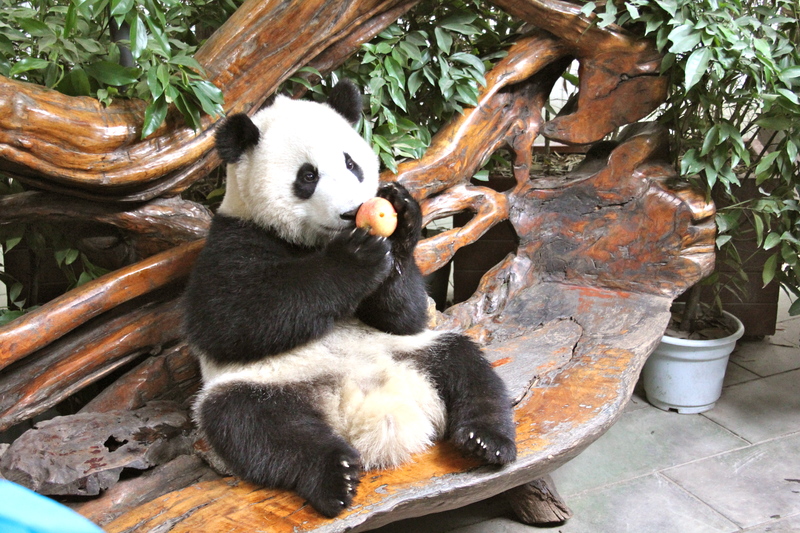 They had attched an apple to the end of a bamboo stick and she happily followed along to the bench. 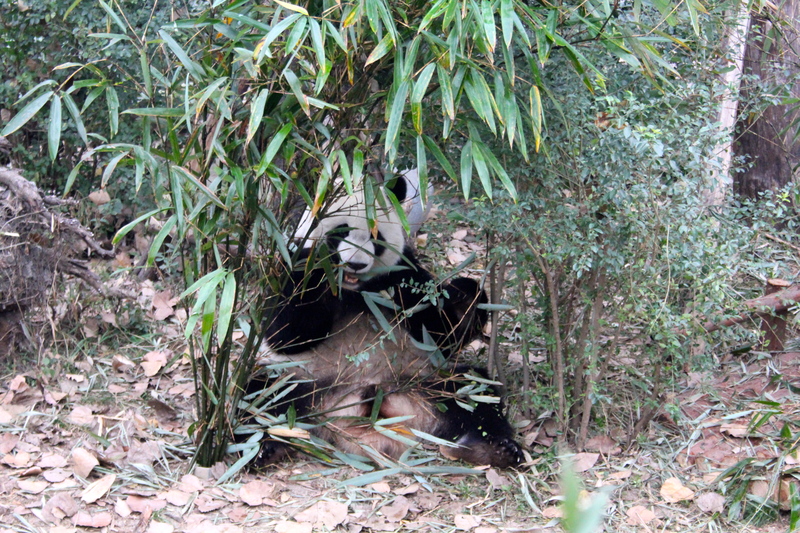 She was helped up and then was fed some apple slices and given some bamboo sticks dipped in honey. It is true that bears like honey – Winnie the Pooh shared that secret many years ago!! Zhen Zhen just arrived at our Interaction area. 1 year old and already 100lbs. 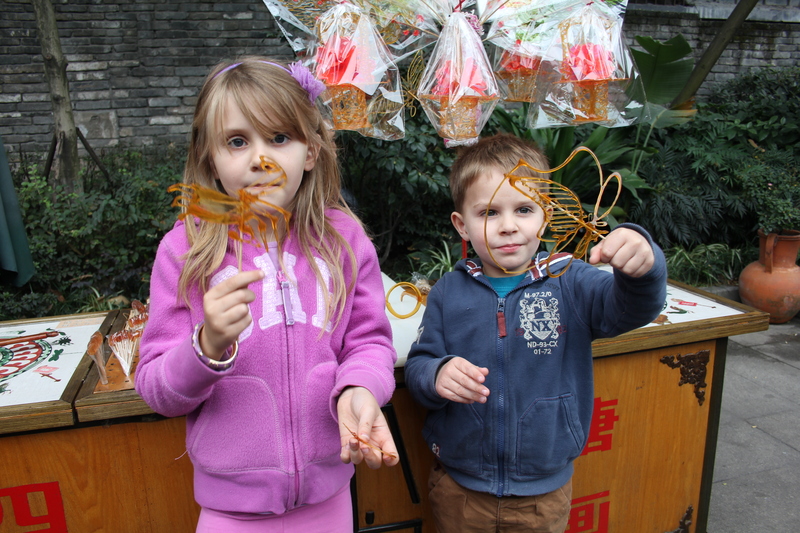 Yummy bamboo dipped in honey! Owen was the first one to sit next to her. He could not keep the smile off his face – and the same was true for all of us who followed! Oliver was a little apprehensive and did not want to sit as close as Owen had done, but quite happily stroked her and smiled for photos. Isabelle was next and she loved her, scooching up close for a cuddle with feet curled up on the bench. It was not long enough for Isabelle who had to move to make way for me. I could not believe that I was sitting next to this marvellous gentle creature whose fur was so soft. 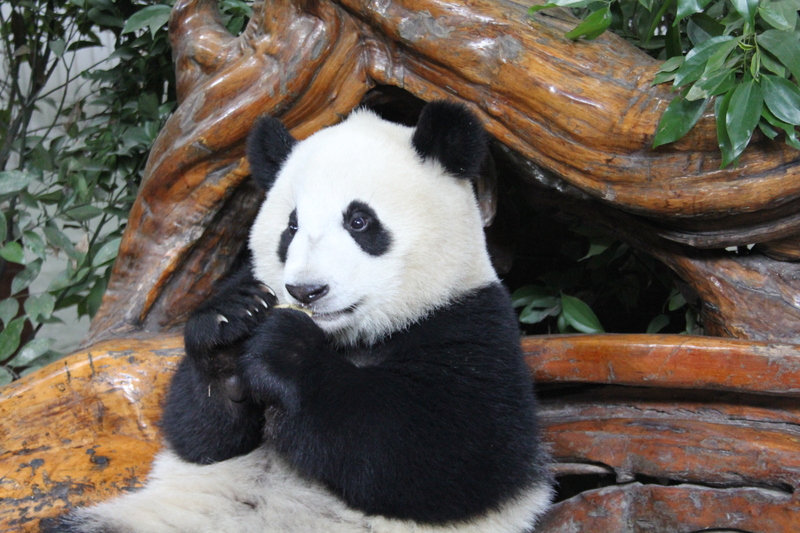 Throughout all this interaction, Zhen Zhen was happily munching her way through sticks of bamboo and oblivious to all the attention. We finished off by having some family photos taken as a fabulous reminder of a truly wonderful experience and well worth the money, in my opinion. Oliver was not too sure to start with. But he had cuddles too! I don’t think she could get any closer! I am speechless. I cannot believe that I am actually cuddling a Panda Bear. 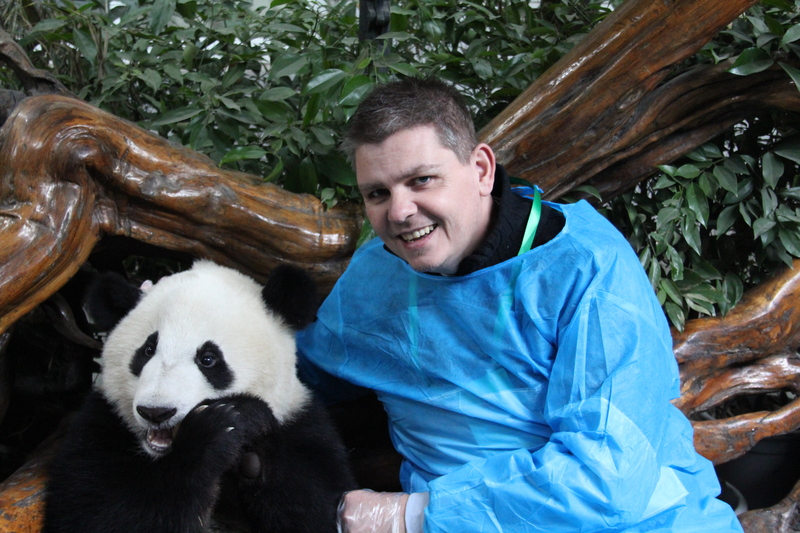 The rumours are that they will be stopping this after next year so we are grateful to have had the opportunity to get so close to one of natures most beloved animals and such a recognisable mascot for China. 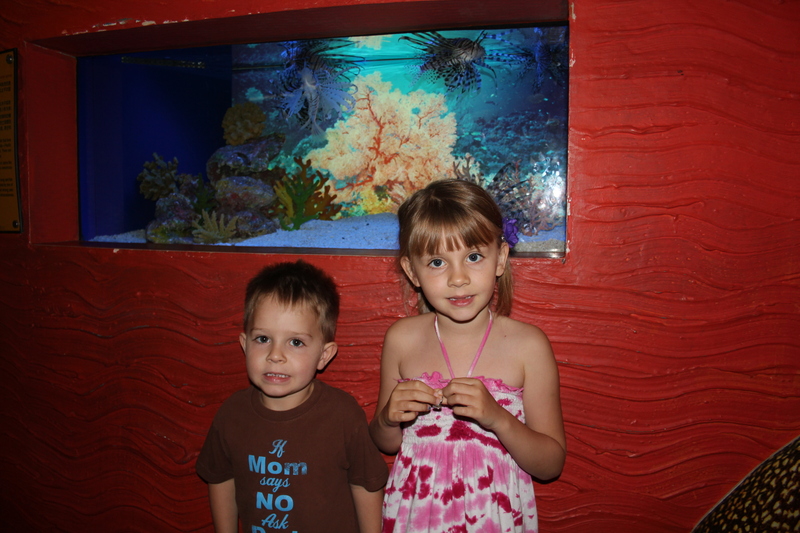 Owen took Isabelle and Oliver to the Shanghai Ocean Aquarium which includes a very long tunnel that takes you through a coastal reef, open ocean, a kelp cave, shark cove, and a coral reef. 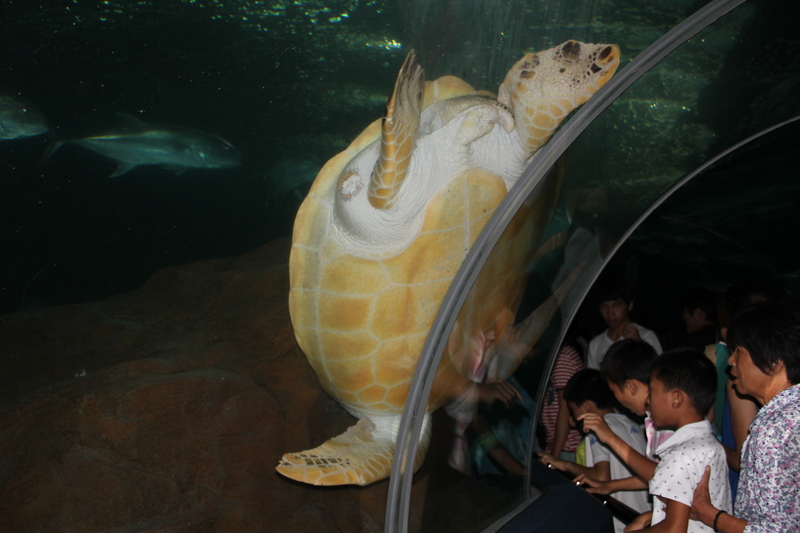 They all saw sharks, jellyfish, seahorses, penguins, stingrays, tropical fish, chinese fish, huge turtles and amazing coral. 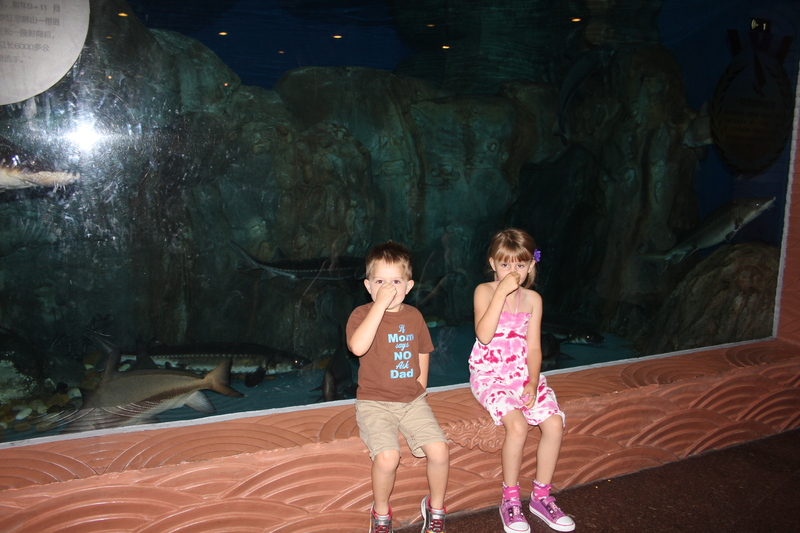 The kids enjoyed everything except being stared at and photographed. 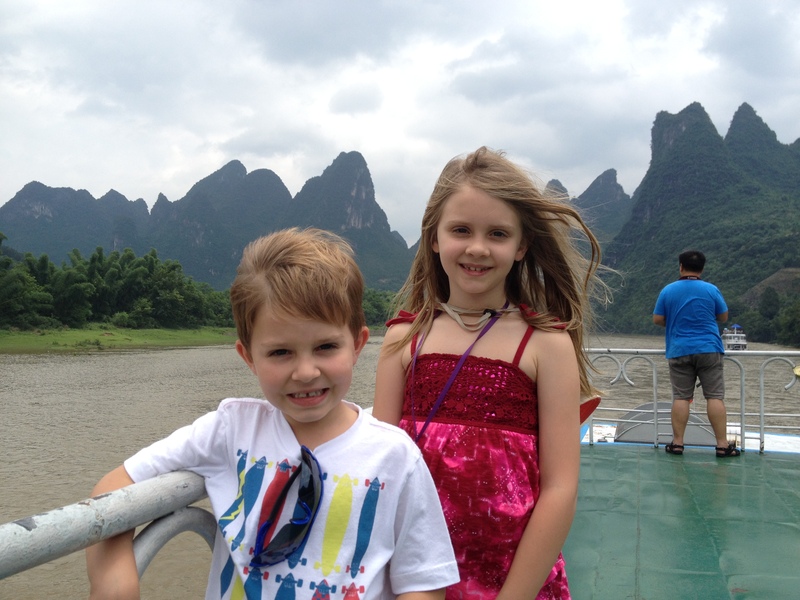 I don’t know what the fascination is for Western children, but the Chinese love to take photos of them. Oliver is not so bothered by it, but Isabelle really does not like it. 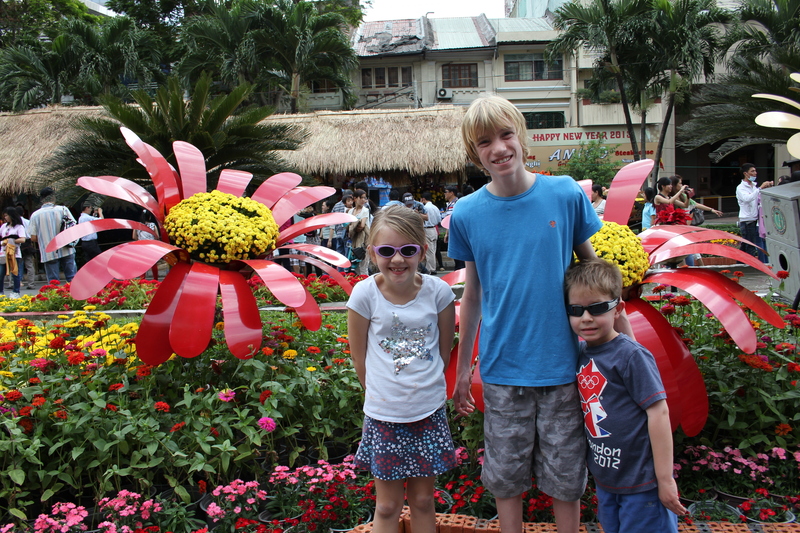 At one point there was a lady taking video and as Owen moved around, turning the kids, the lady did a 360 around too!! How do you explain video of complete strangers?!!!? 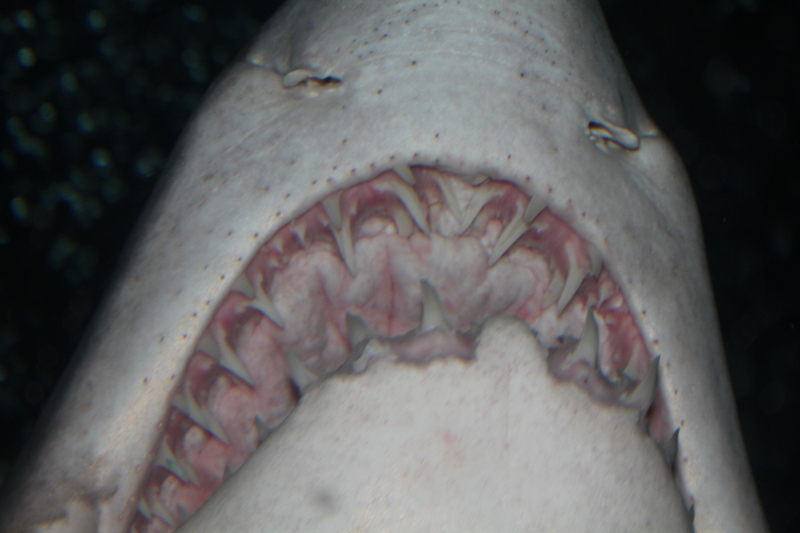 This Shark swam over their heads! I & O said this area was “stinky”! 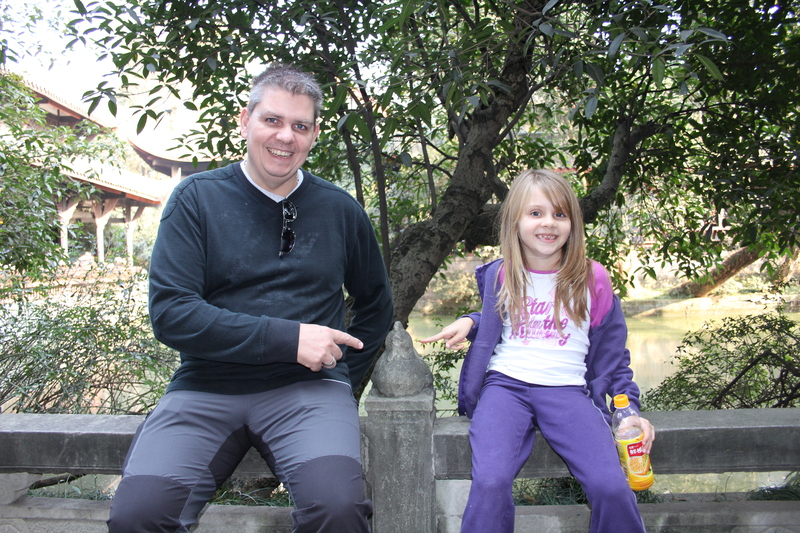 On a very hot sunny Sunday afternoon we decided to do some site-seeing in downtown Shanghai. After a very local lunch (chicken head on our chicken dish!) we started our Big Red Bus Tour outside Madame Tussauds. 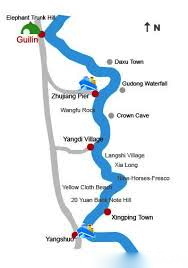 We were doing the red route which took us along the Bund (means embankment). This area is 1 mile of spectacular buildings along the waterfront. 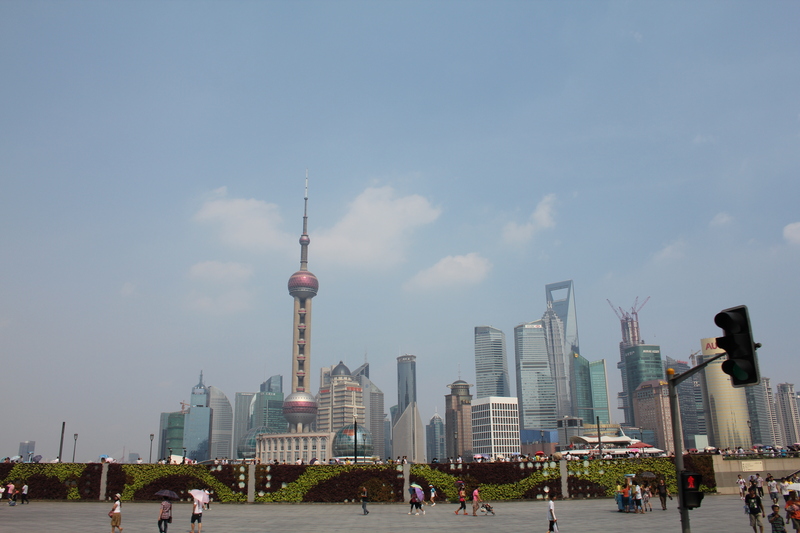 It is famous for magnificent 19th and 20th century architecture on one side with state of the art sky-scrapers on the other modern Financial District side. 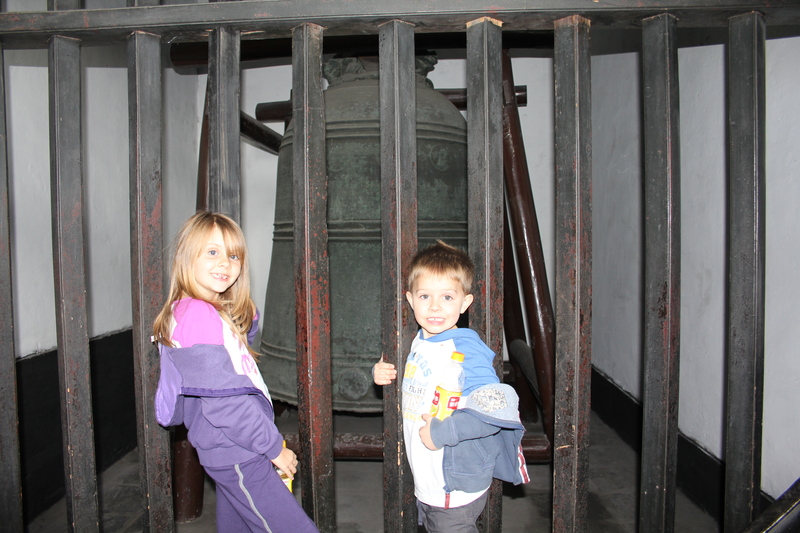 There is even a mini Big Ben – a throw back to the old British influence! 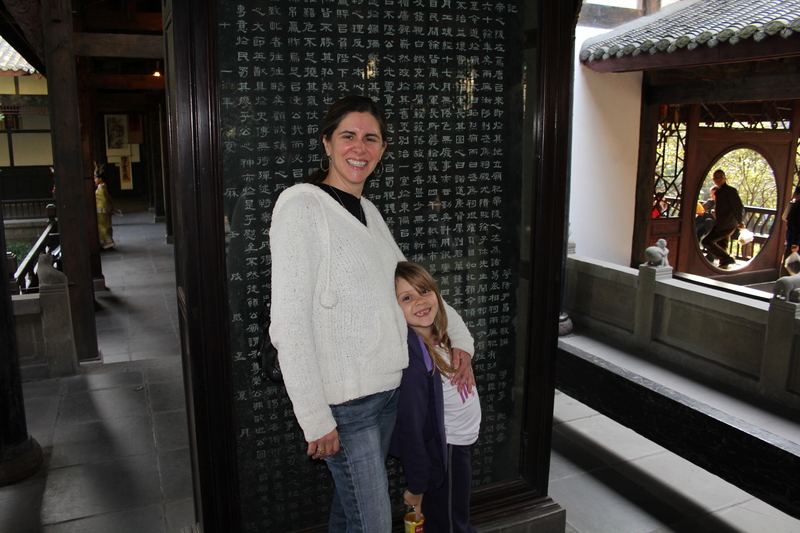 Moving on from there, next stop was Xintiandi (“New Heaven and Earth”). It is a traffic free area of restored Shikumen (“Stone Gate Houses”) houses on narrow alleys, some adjoining houses, which now serve as book stores, cafes and restaurants, and shopping malls. Shikumen are 2-3 storey town houses surrounded by a high walled courtyard, built in the late 1800’s, they blended East with West. 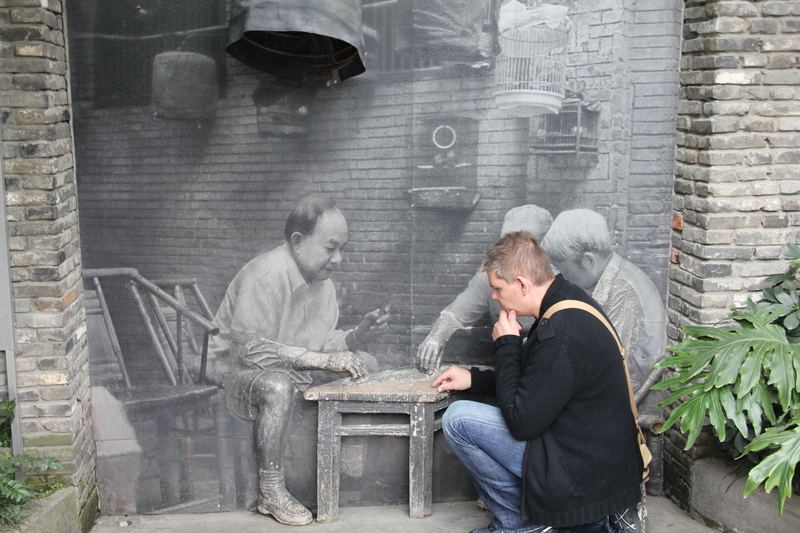 As Shanghai’s population exploded many of them were cleared for new modern developments. 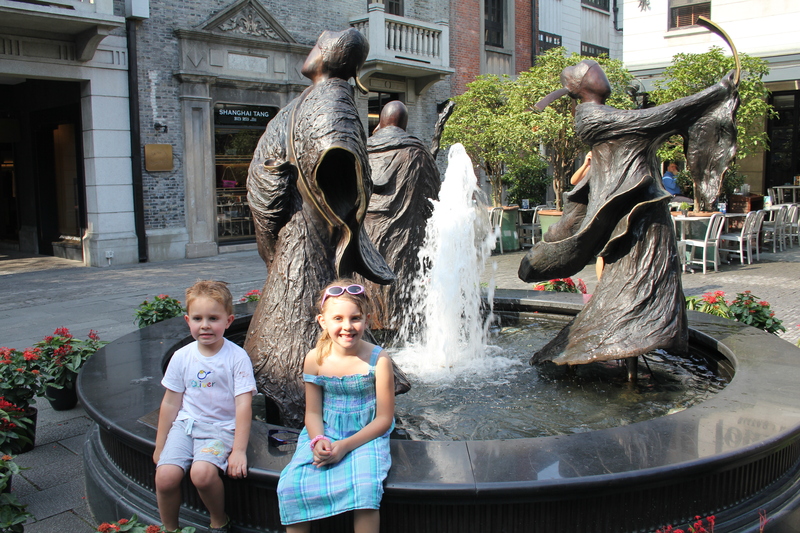 Xintiandi has been restored to its former glory and is a great place to eat out, stop for a drink or shop. 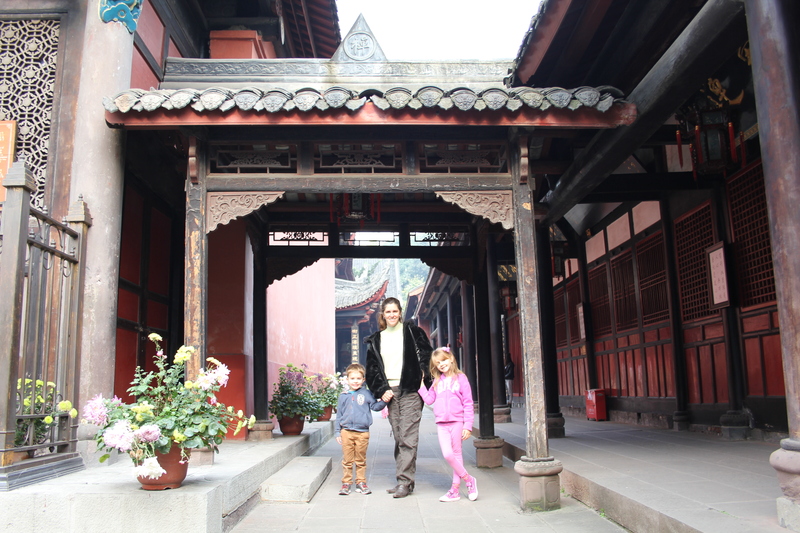 On the edge of Xintiandi is the building that hosted the first congress of the Chinese Communist Party in 1921 and is now a museum. 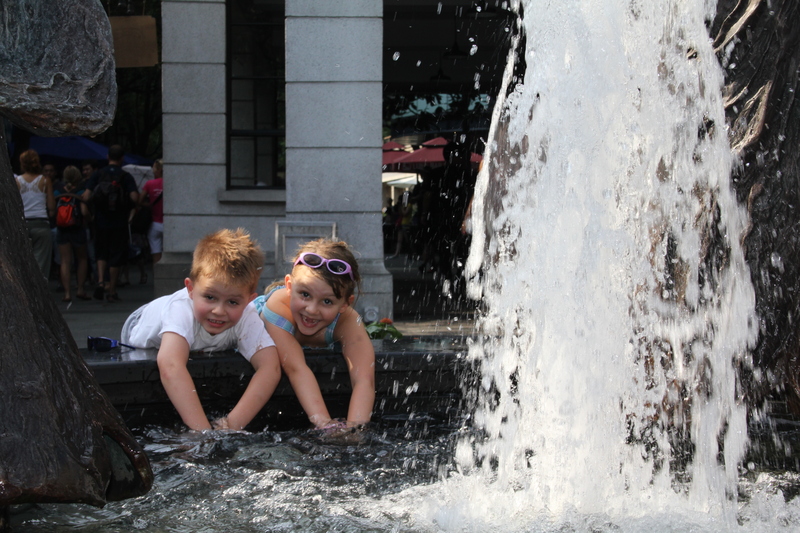 Cooling off in the Fountain! 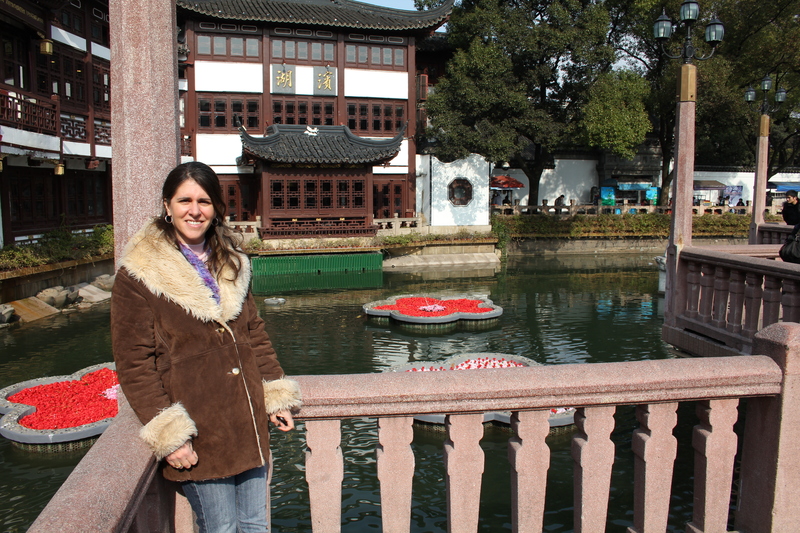 We drove by, but did not stop at, Yu Gardens. 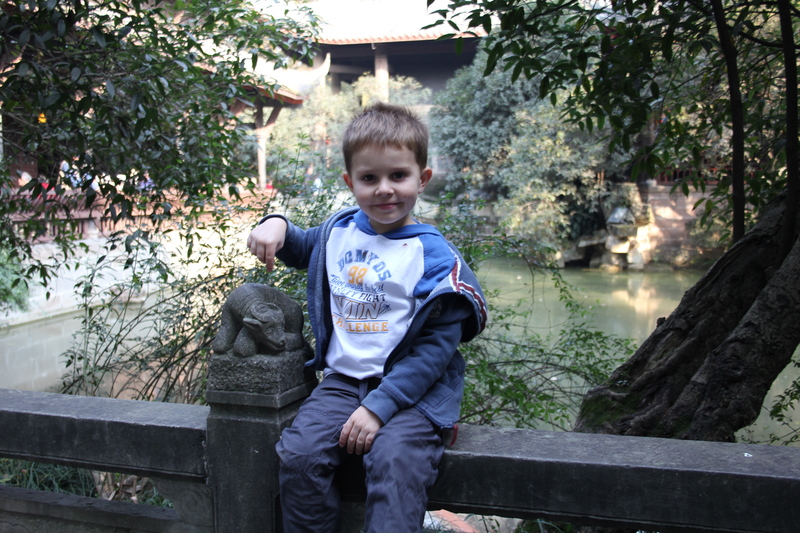 Owen and I had both visited here during our look/see visit in December. 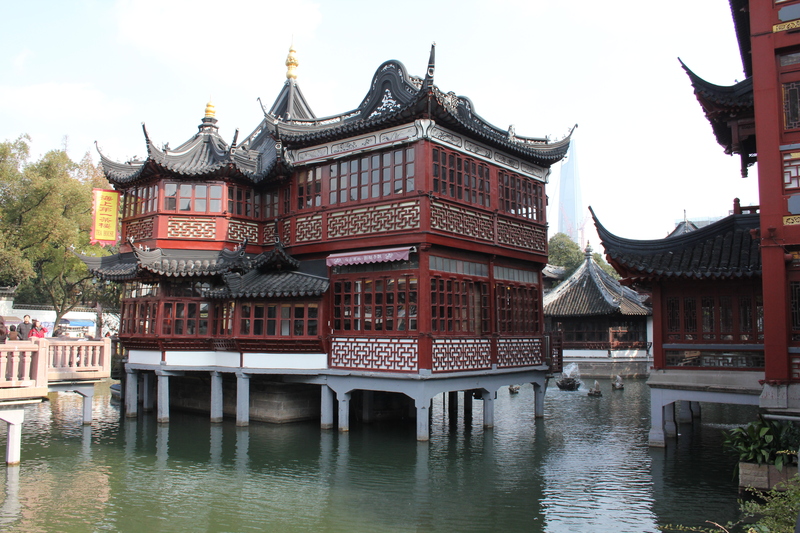 It is a 5 acre spread of a wonderful example of a traditional Chinese garden. 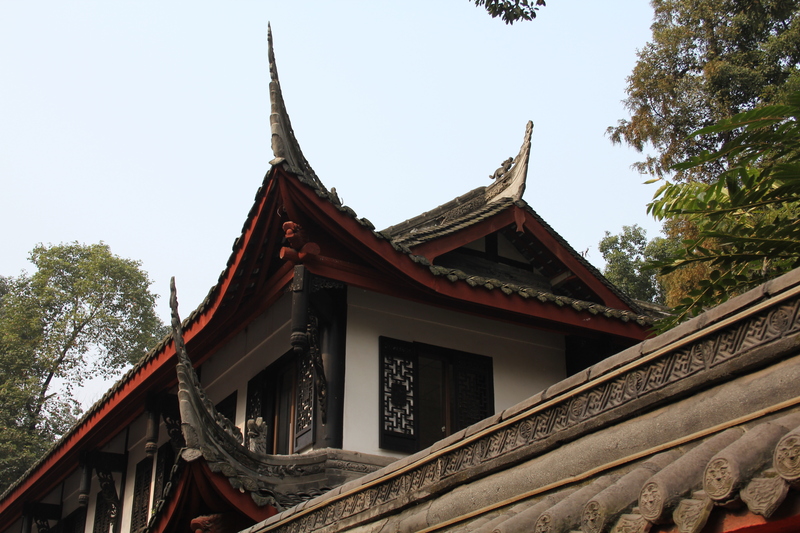 It was established more than 400 years ago by Pan Yunduan who spent 20 years building the gardens to please his parents. 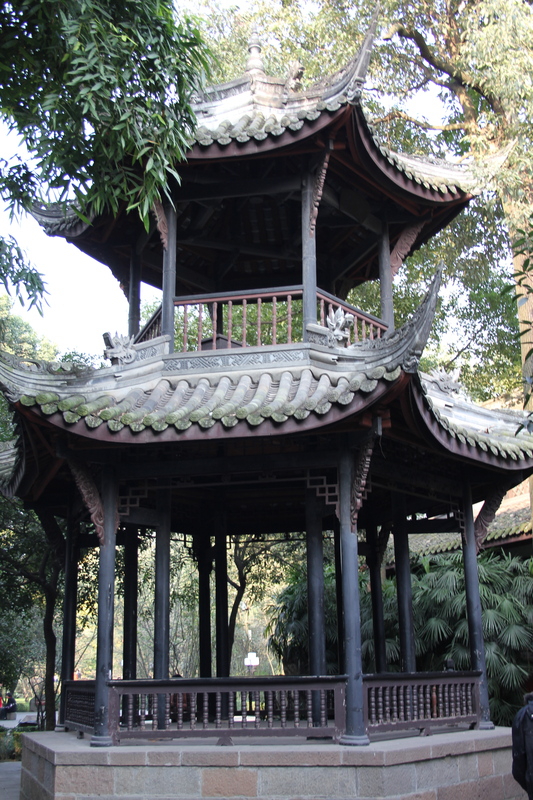 Surrounding the gardens is the Yu Bazaar. 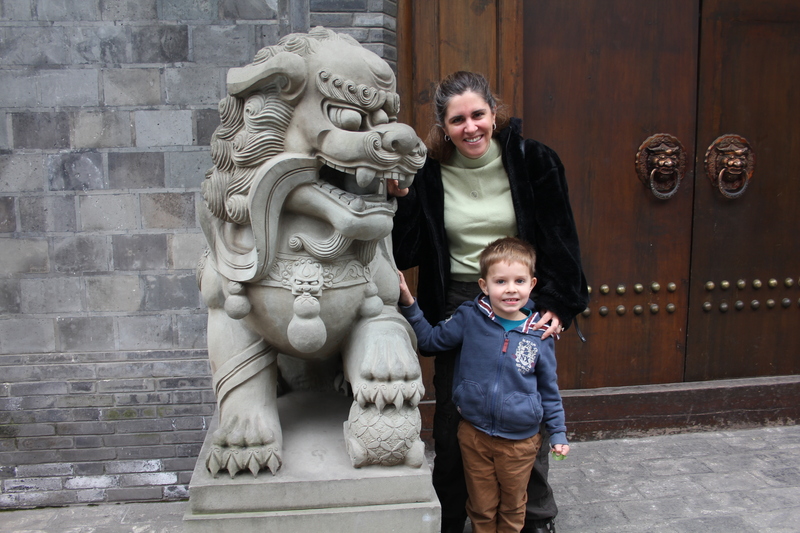 Here, Owen and I were hassled to buy many Chinese souvenirs in December!! 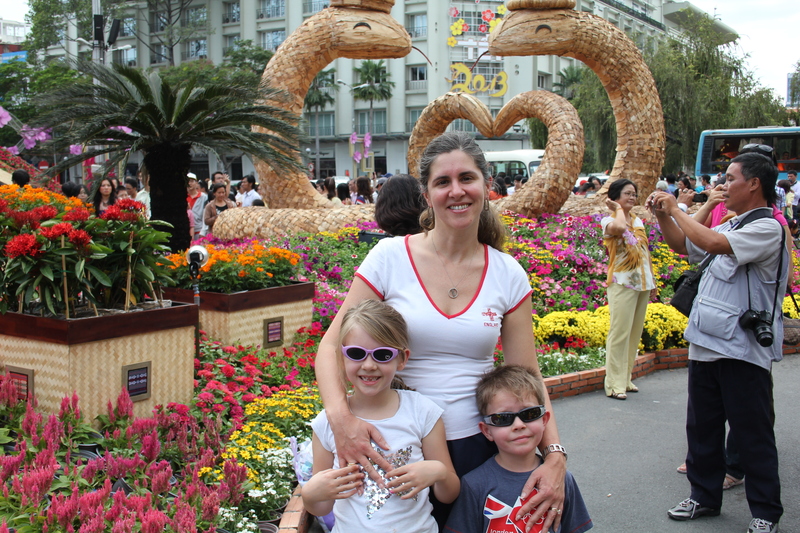 The red route took us past Nanjing Road East which is one of the busiest shopping streets in China. 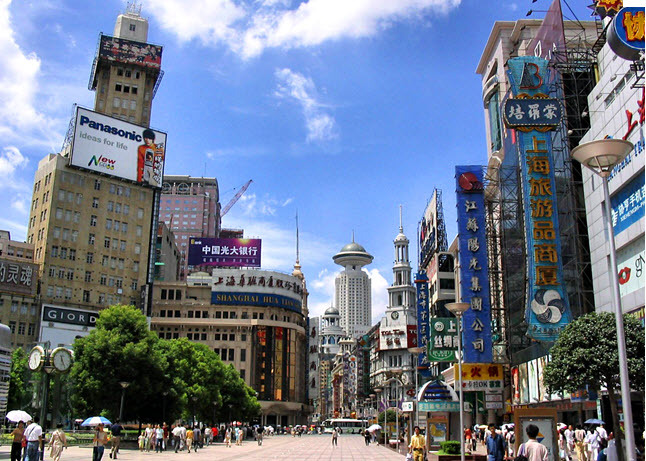 The street runs from the Bund to People’s Square, which is where it turns into Nanjing Road West. I work in a big building on Nanjing Road West, just off People’s Square. You could be anywhere in the world walking down Nanjing Road, as the shops are just as familiar to any in London, New York or Atlanta. Nanjing Road East. The building at the end (middle of photo) is the Radisson Blu hotel and is a 5 minute walk from my office. 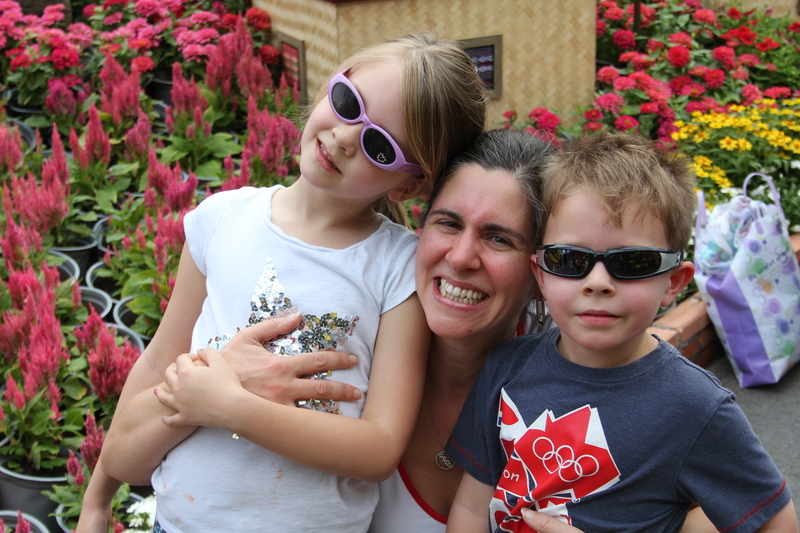 I can thoroughly recommend the Big Red Bus Tour, but not on a hot, humid sunny day. We will be back in the Autumn to do the green route. 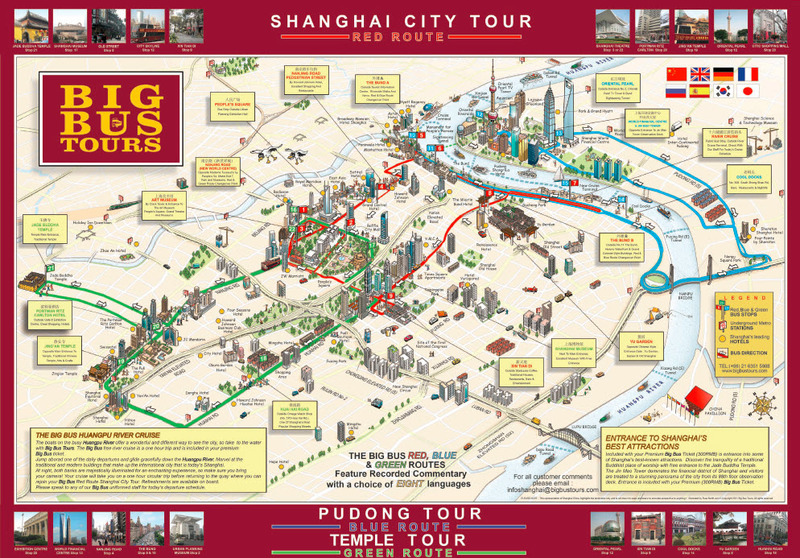 Big Red Bus Tour Map. Red Route – Done! 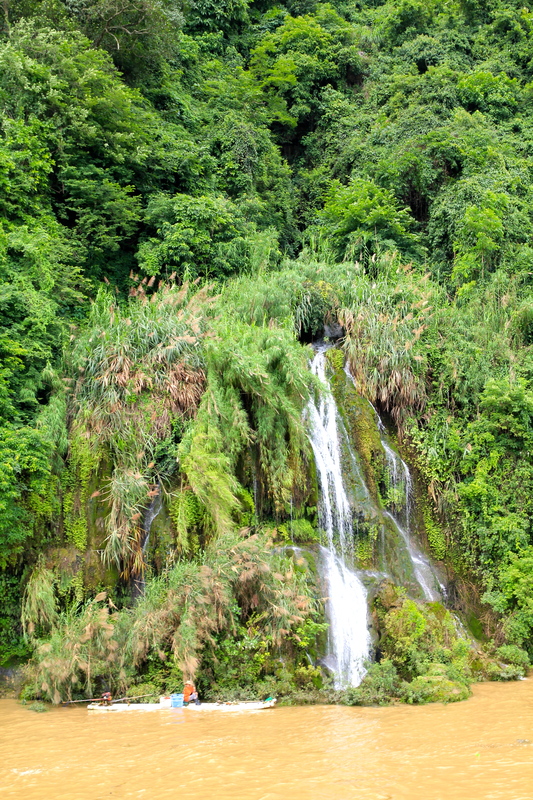 Green Route – to do!